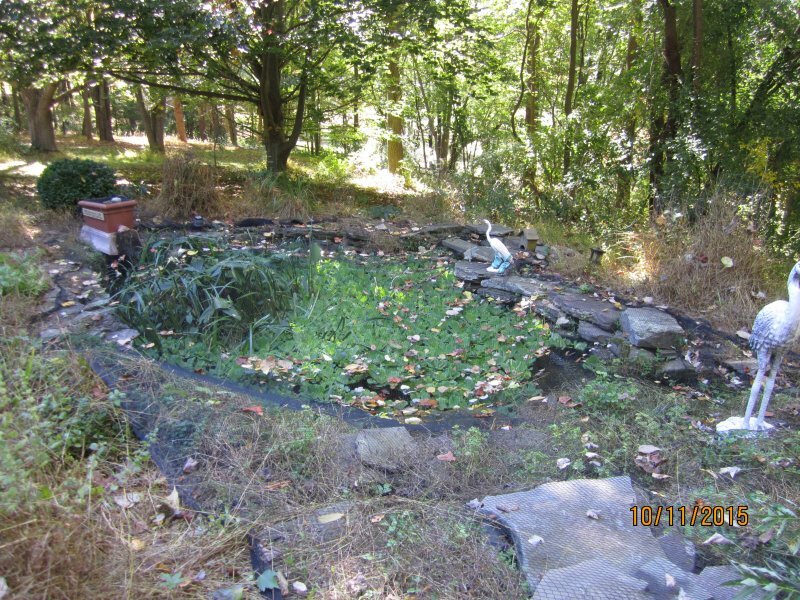 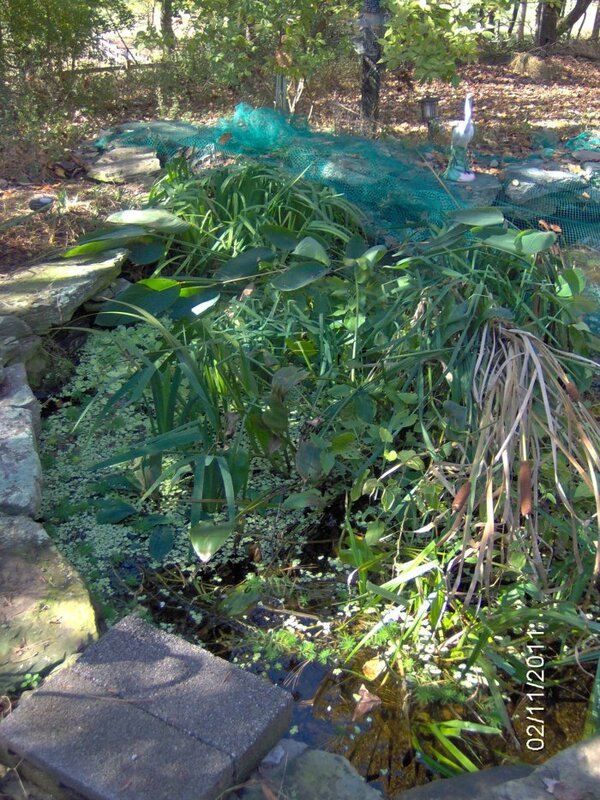 On 11/6/15, the pond pumped half way out as the leaf net was pushed down over the biofilter outlet which then clogged with leaves and diverted water away from the pond. 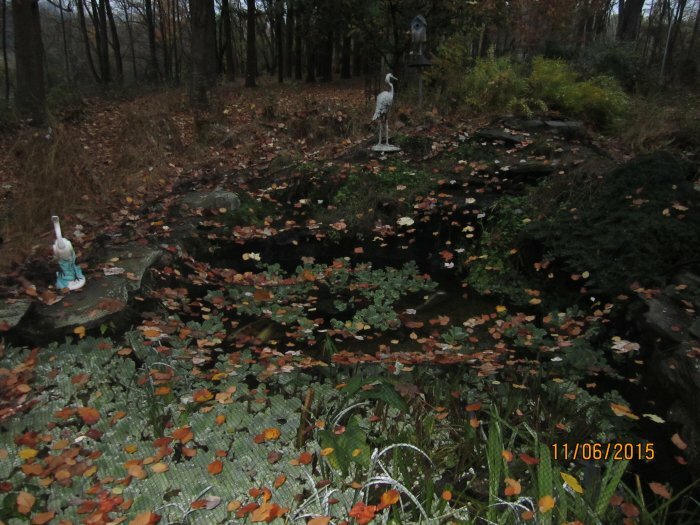 I took these photos of the half empty pond but, looking at them more than six months later when I am finally processing them, it is really hard to tell that the pond is half empty! 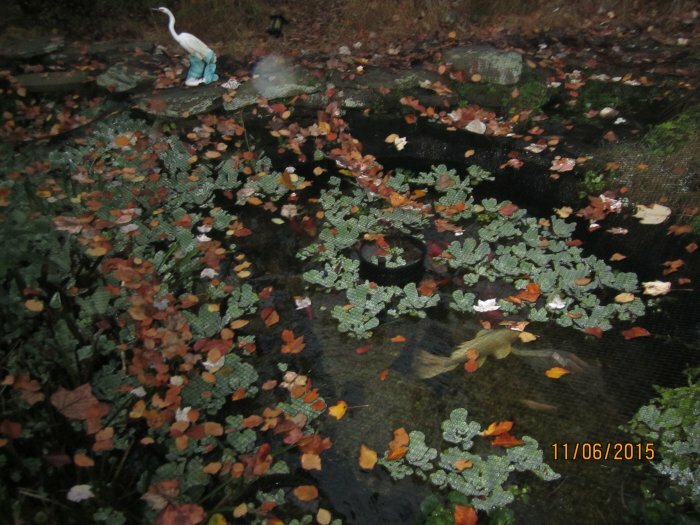 The photos were taken at dawn so they are still pretty dark. 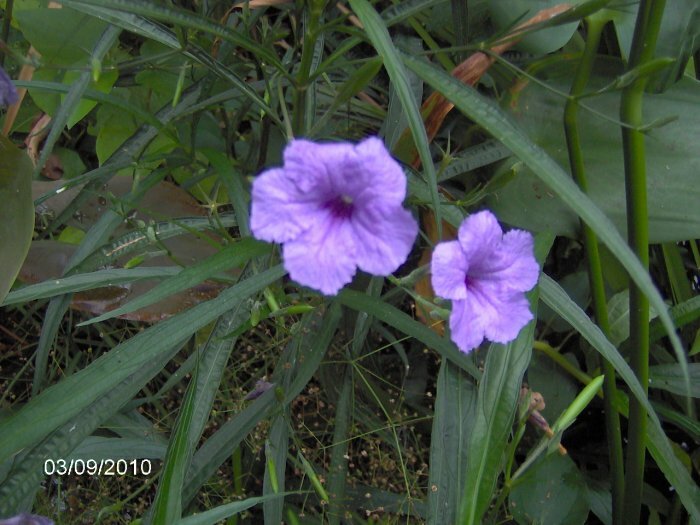 I only processed about half of the photos that I took because I could not tell there was anything special going on. 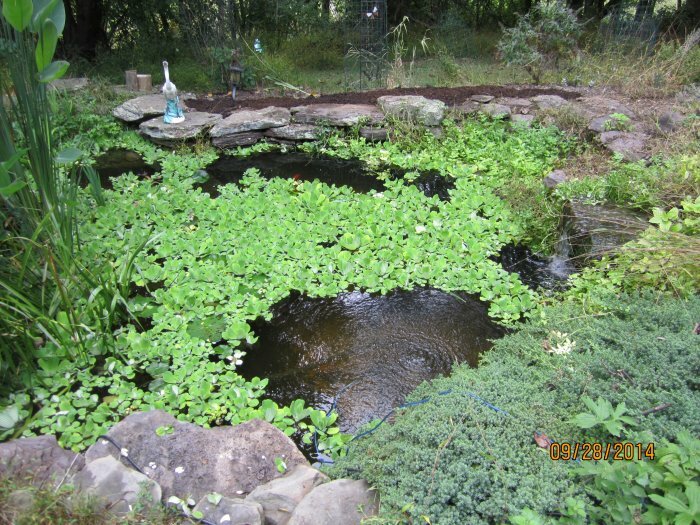 Half Empty Pond - facing northwest. 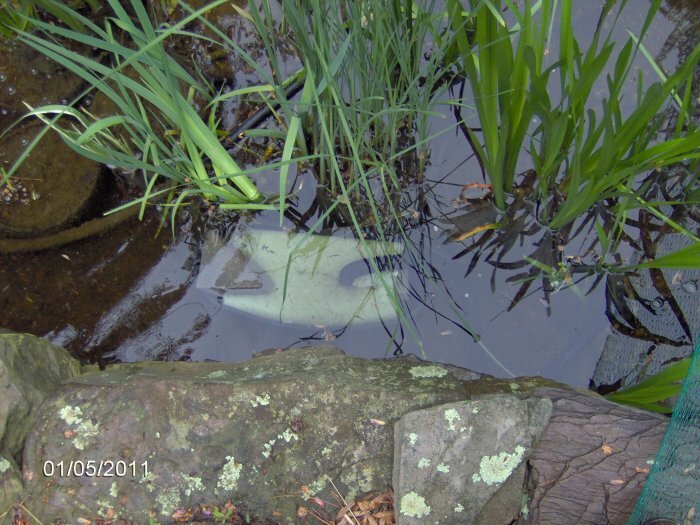 That five gallon pot in the middle of the pond is normally submerged but was completely out of the water. 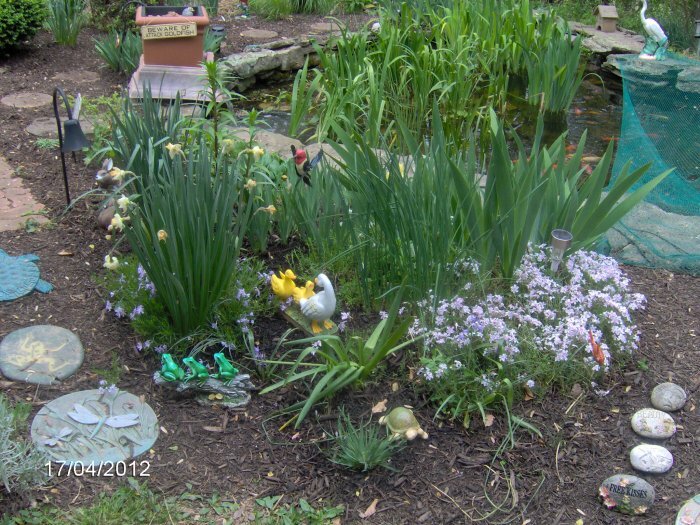 I see my koi, Colin. 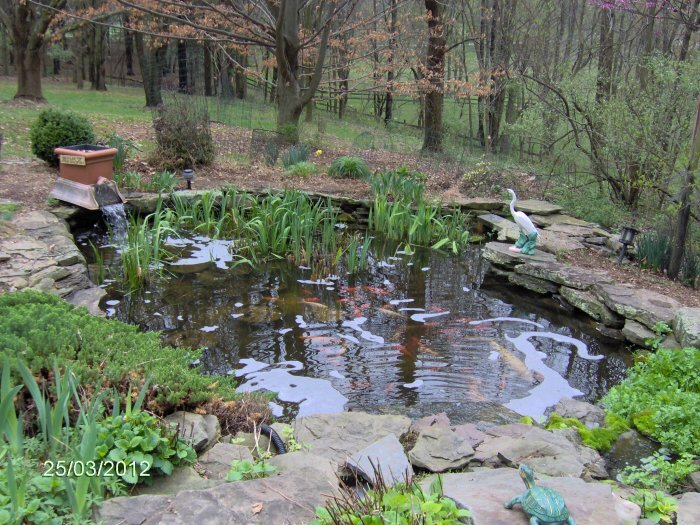 Half Empty Pond - facing northwest. 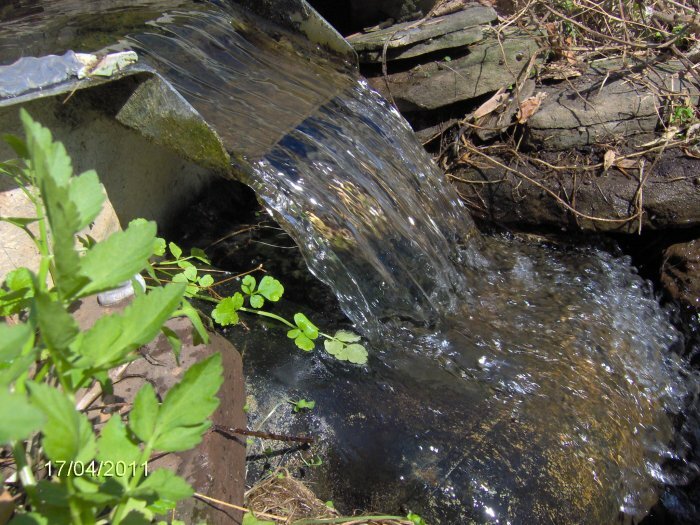 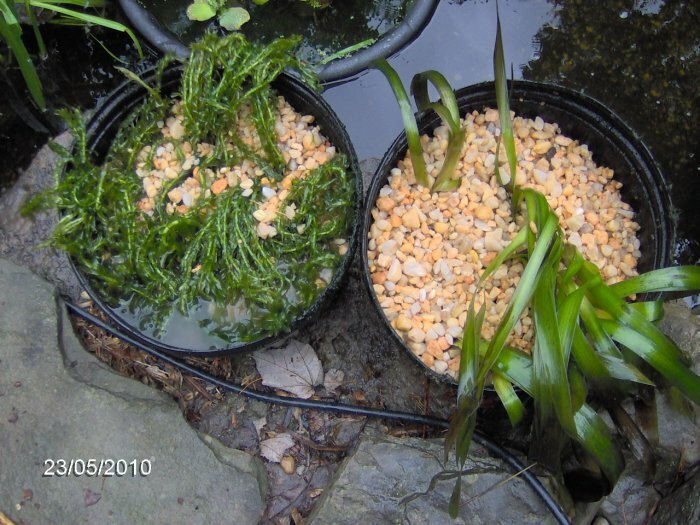 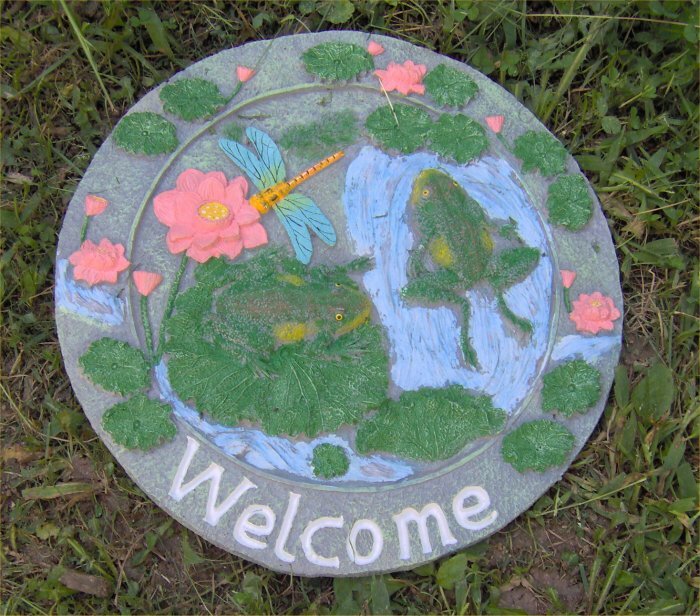 Waterfall - this is the output of the smaller waterfall as it goes in to the main pond. 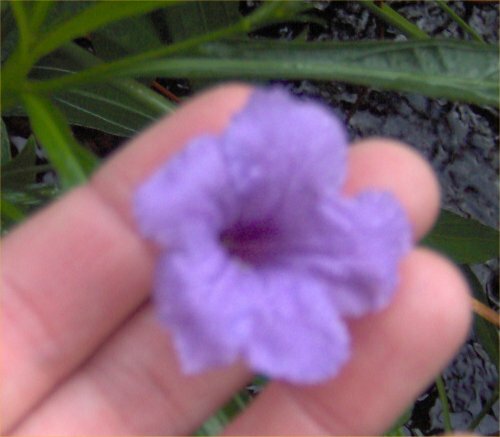 Normally, there is no drop there. 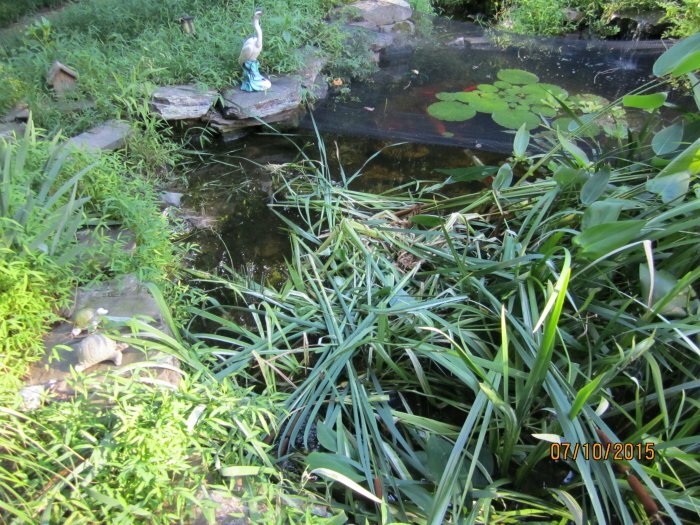 You can sort of see that there was now a drop with the pond partially empty. 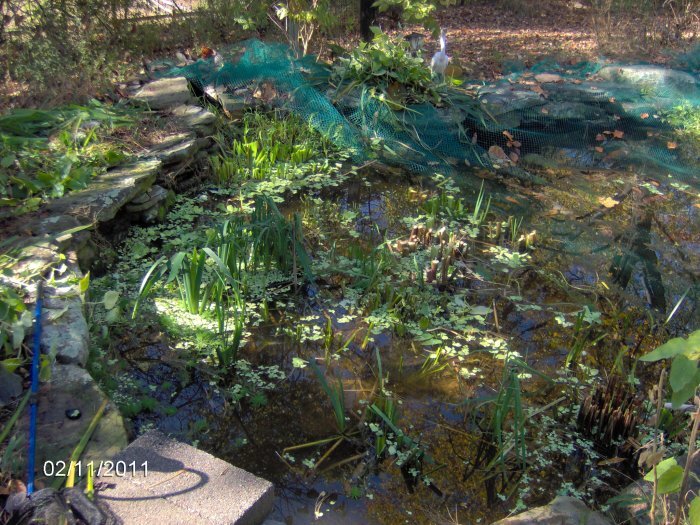 Half Empty Pond - this shows the deep end of the pond where the main waterfall goes in. 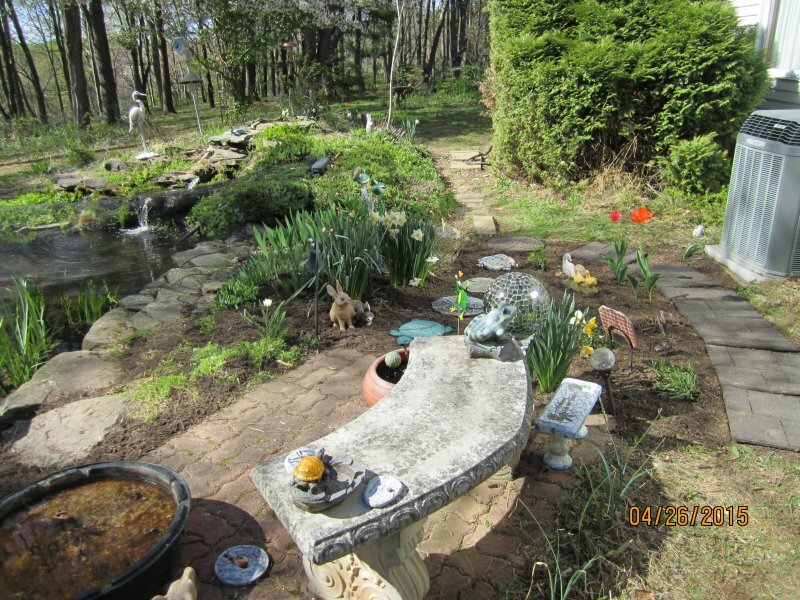 It is hard to tell that it is not normal. 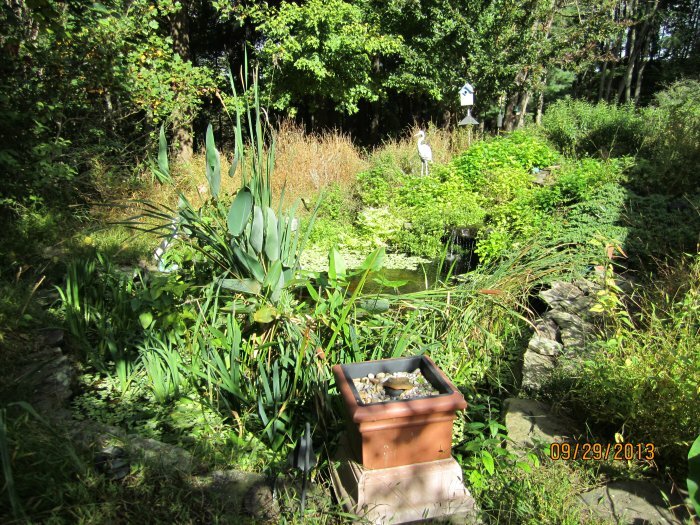 Pond on 10/11/15, facing northwest. 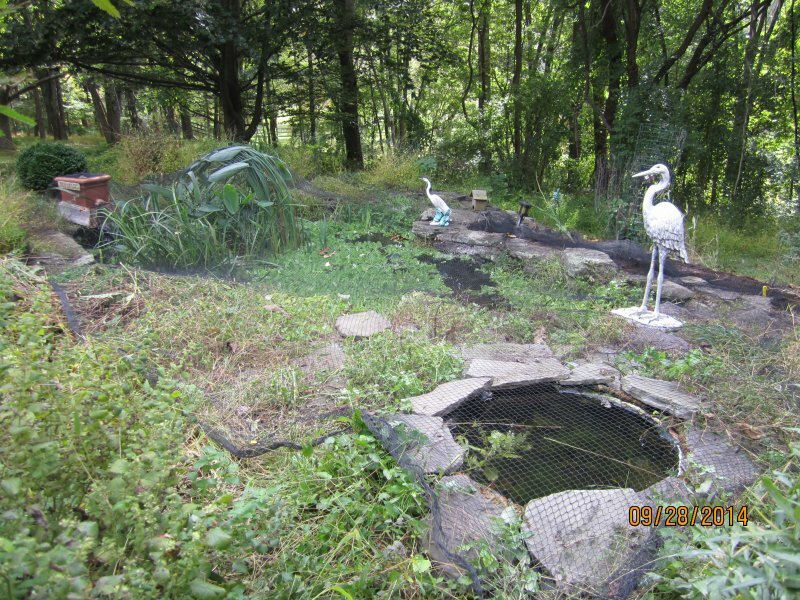 In July of 2015, some animal tore my 1800 gallon pond apart. 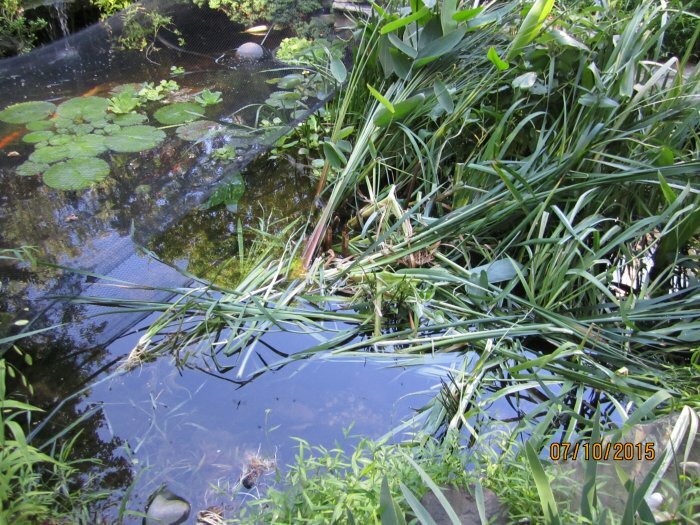 They ripped out and/or ate all the yellow flag iris, all the common cattails, most of the hardy canna, most of the lizard tail, etc. 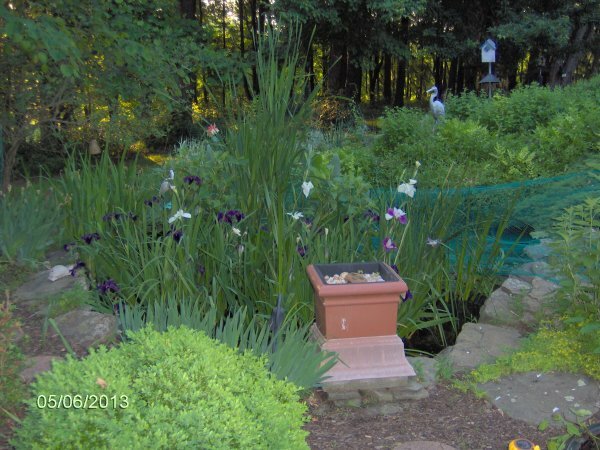 Yellow flag iris remnants - this was all that was left; I repotted it on 7/12/15; it did not survive at all. 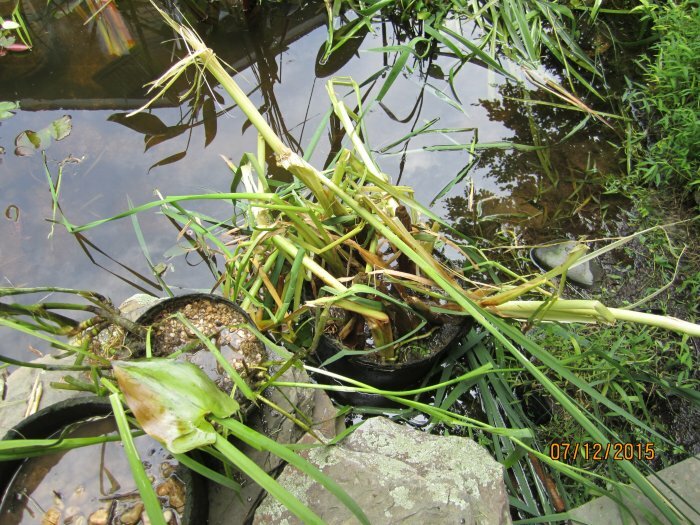 Cattail remnants as well as pickerel rush and sweetflag it looks like. 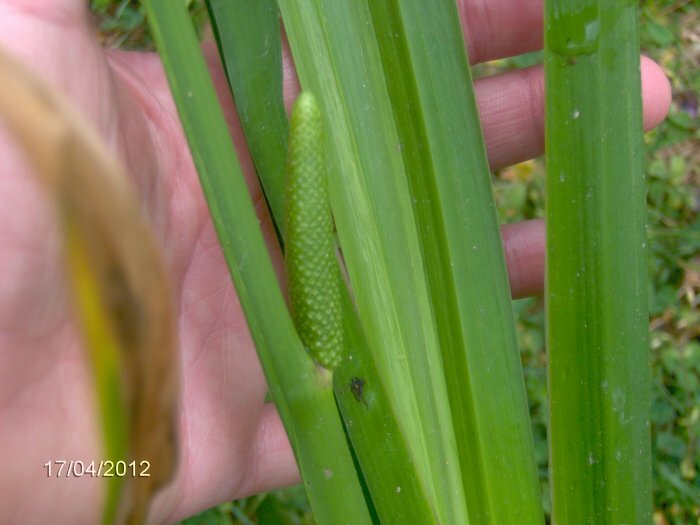 The common cattails were the very first plant in my pond (same exact plant as in 1997). 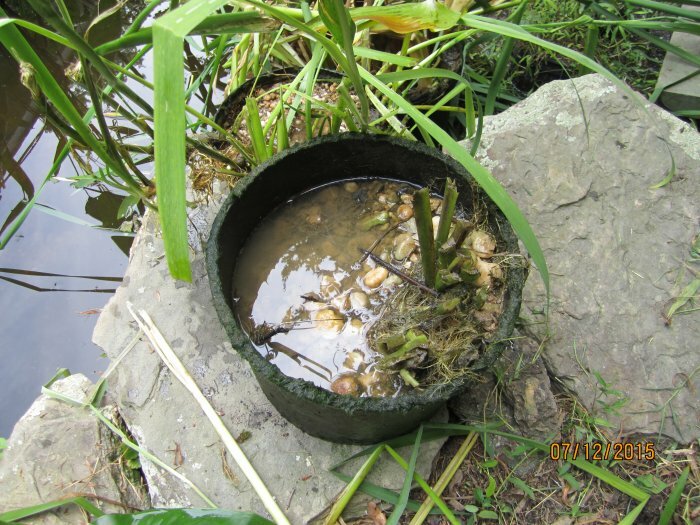 I repotted the remnants on 7/12/15. 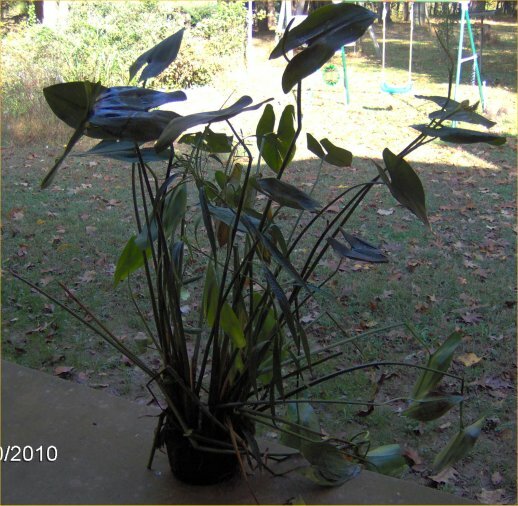 The cattails did not return in 2016. 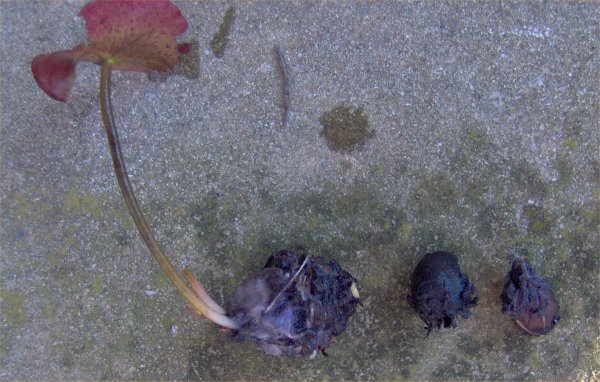 They died from this attack. 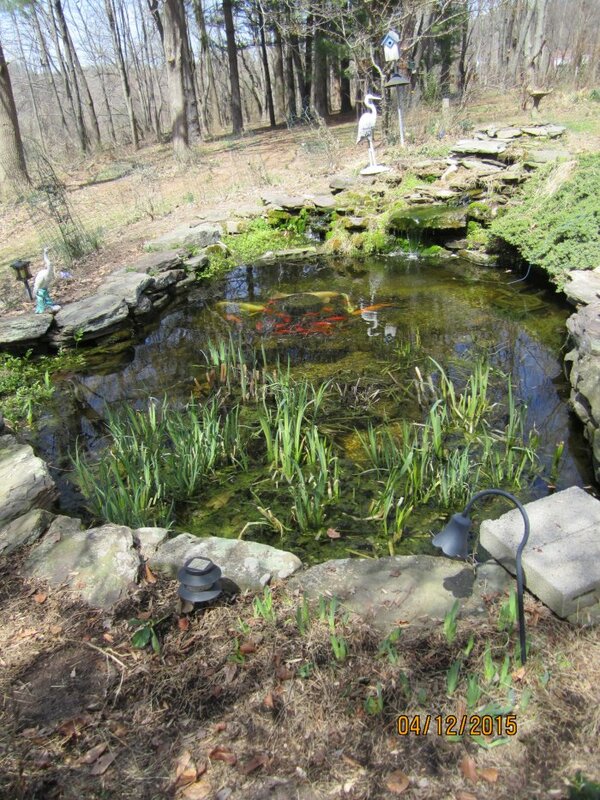 An era ended from when my pond was flourishing to now languishing. 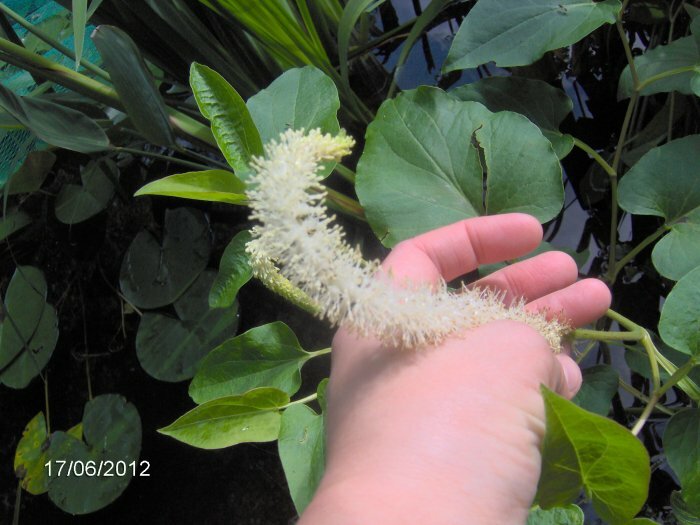 Lizard tail and pickerel rush in flower. 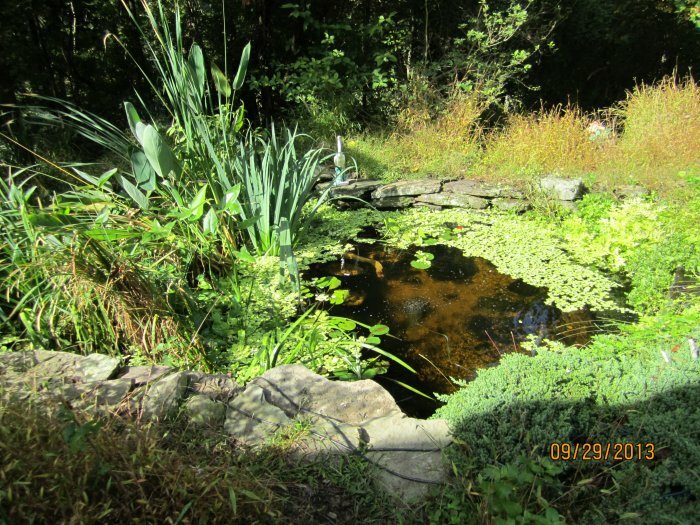 Pond facing northwest. 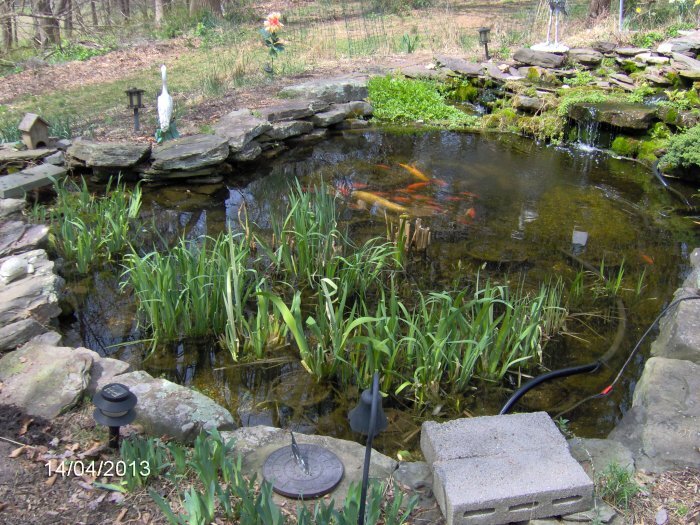 I see my oldest koi, Colin, and some goldfish. 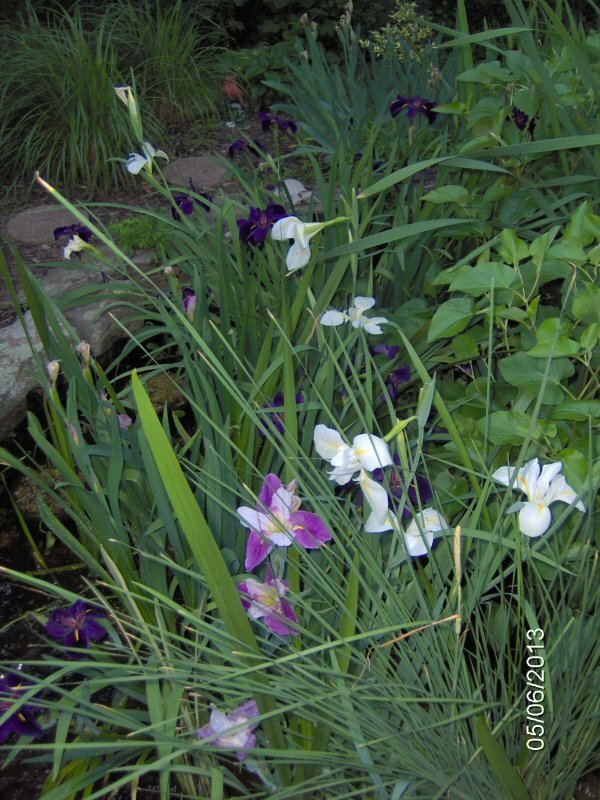 Purple and colorific iris in the marginal area. 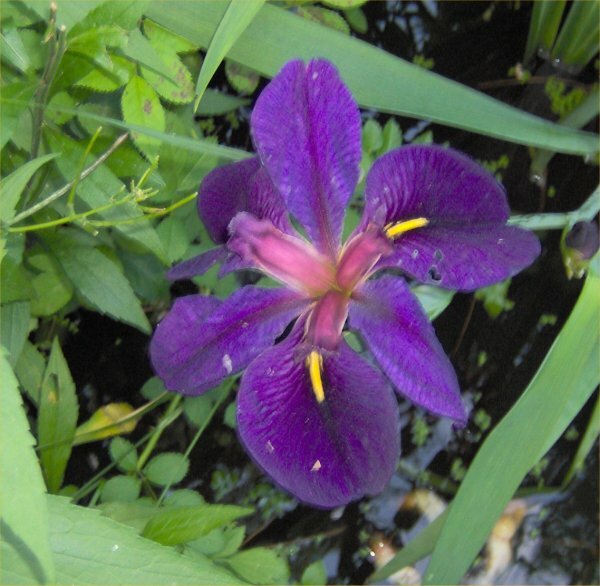 Purple iris in the marginal area, close-up. 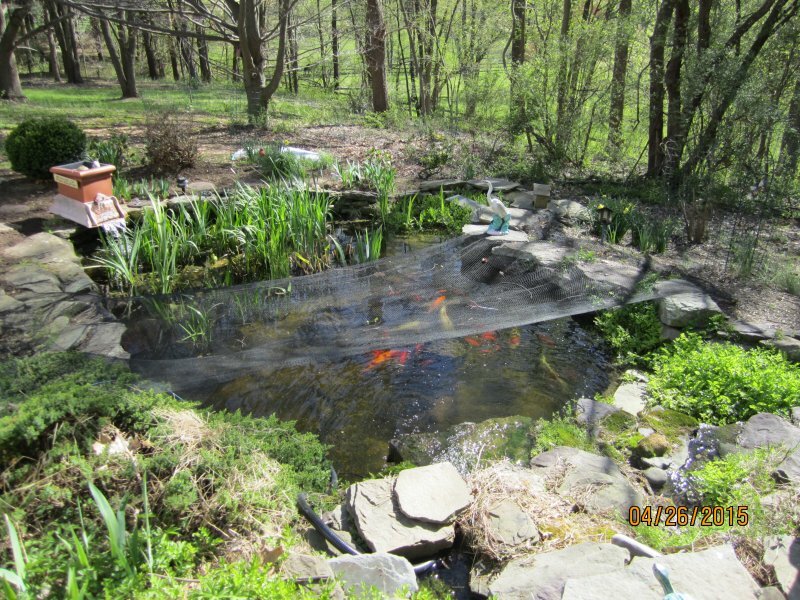 Big Pond and garden facing south, 5/9/15. 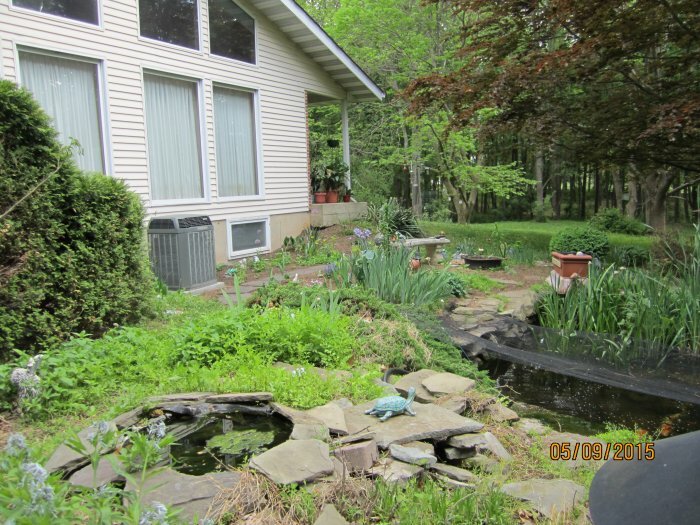 Big pond and garden facing south. 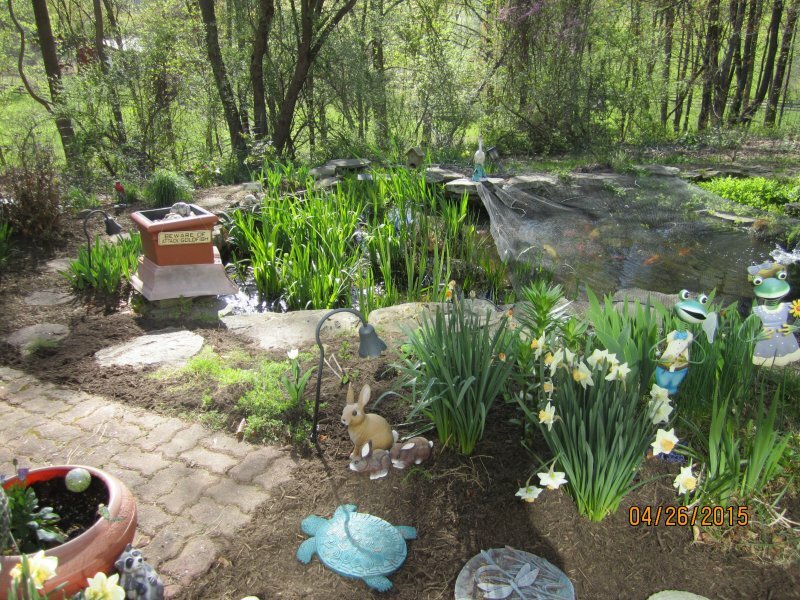 Here are some photos from 4/4/15. 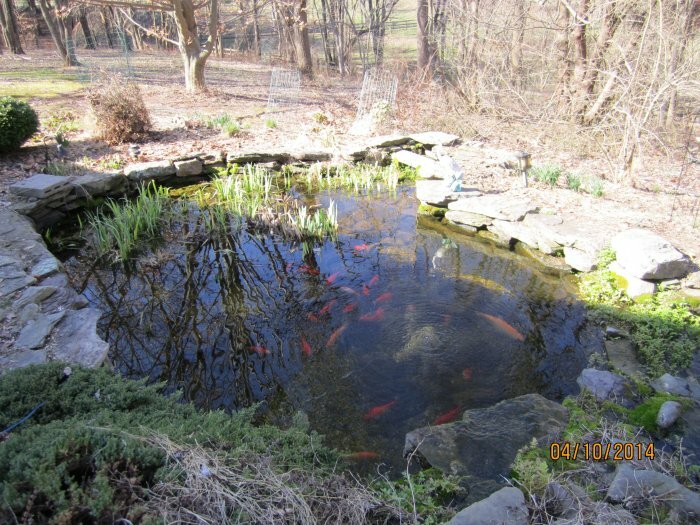 Big pond facing northwest. 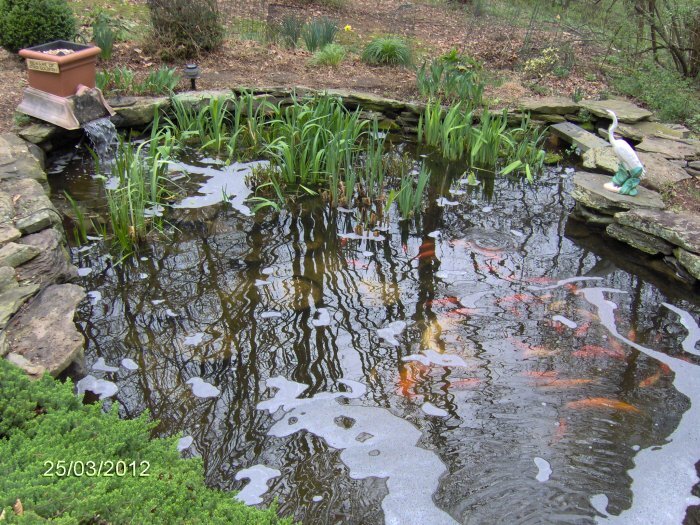 The orfe, goldfish, and koi are in the distance. 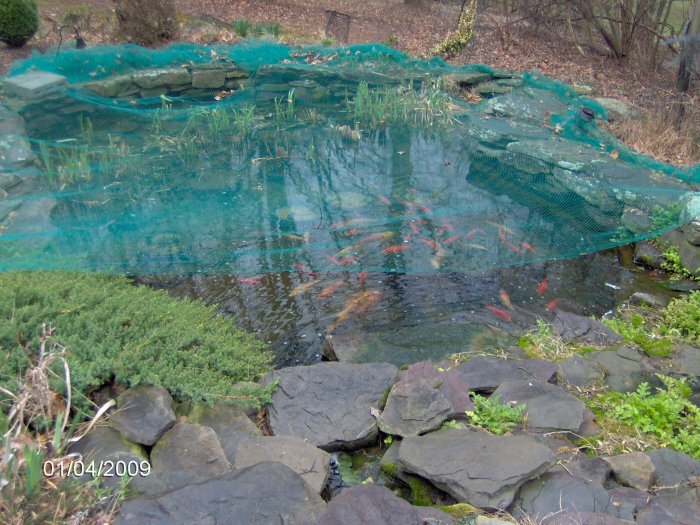 Big pond waterfall area with the fish! 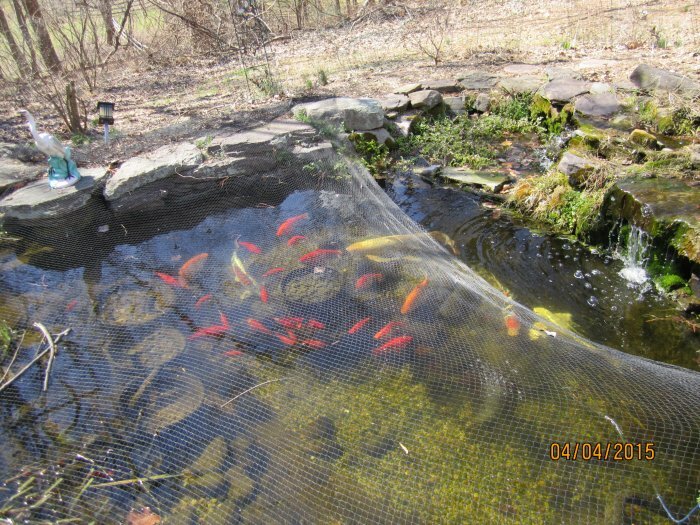 I took these photos on 9/28/14 when I took the half net on and before I put on the full net (except the last photo which has the full net on). 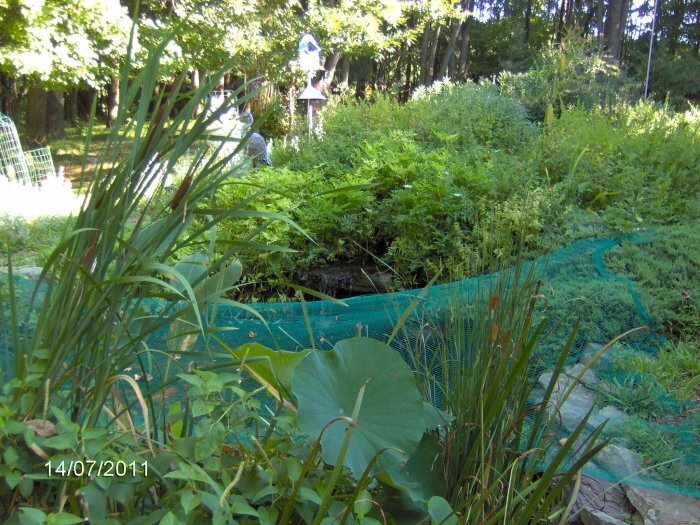 Pond facing southwest, from the biofilter. 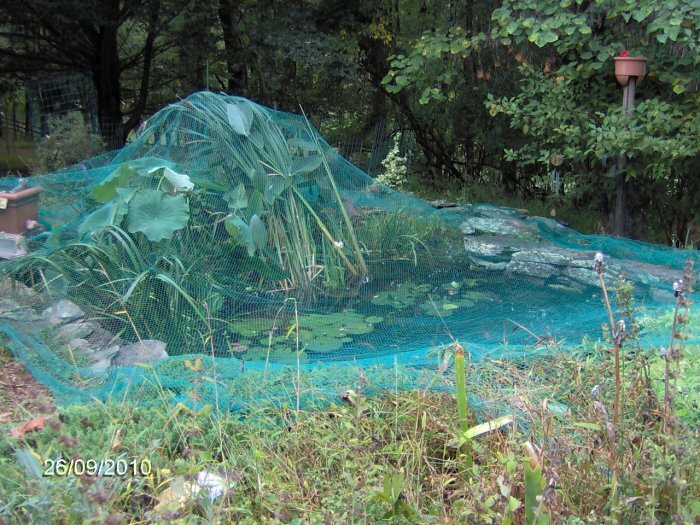 Pond facing southwest with the full net on. 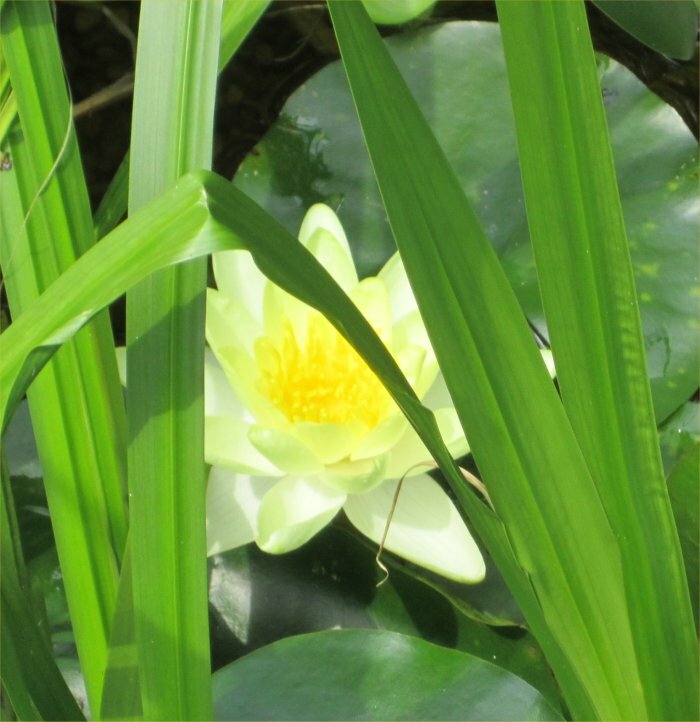 Tropical waterlilies in bloom in the 1800 gallon pond, facing west. 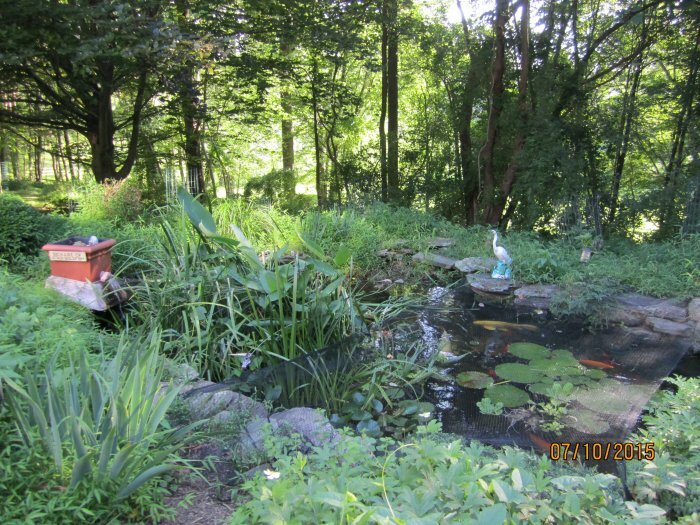 At the top of the photo, I can see koi Colin and Riley and an orfe. 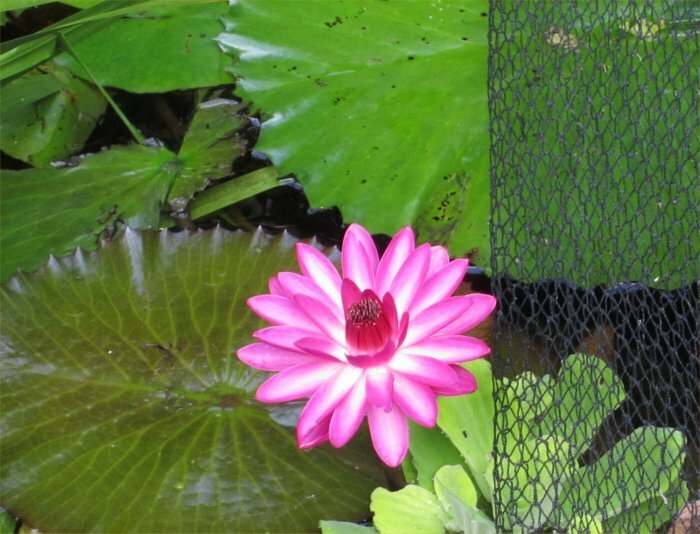 Tropical red waterlily in bloom, net pulled back, close-up. 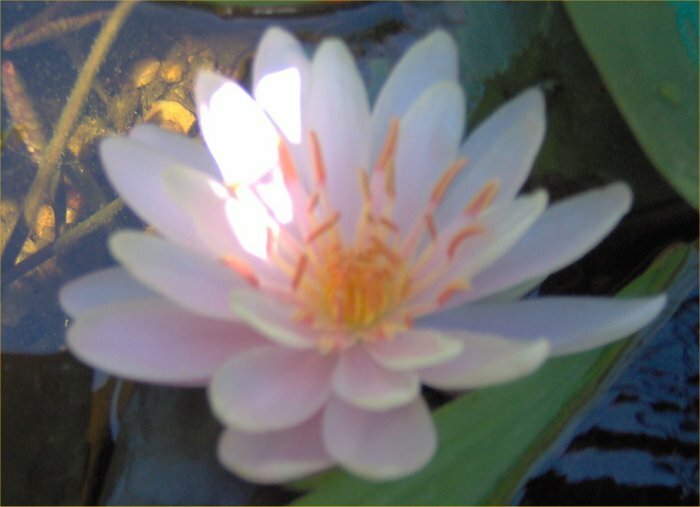 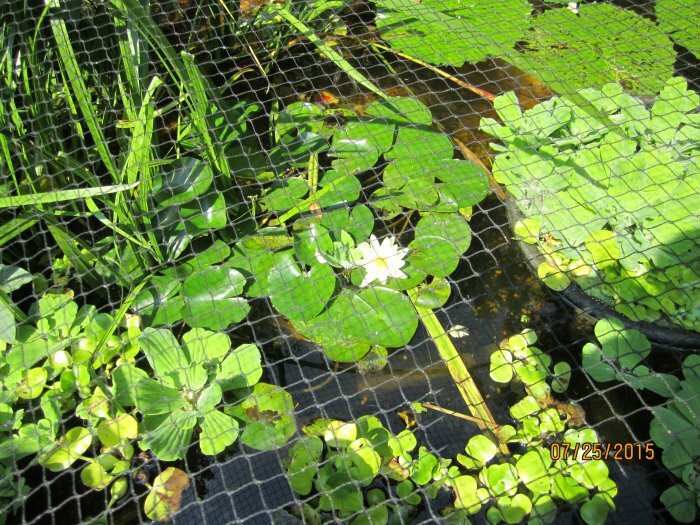 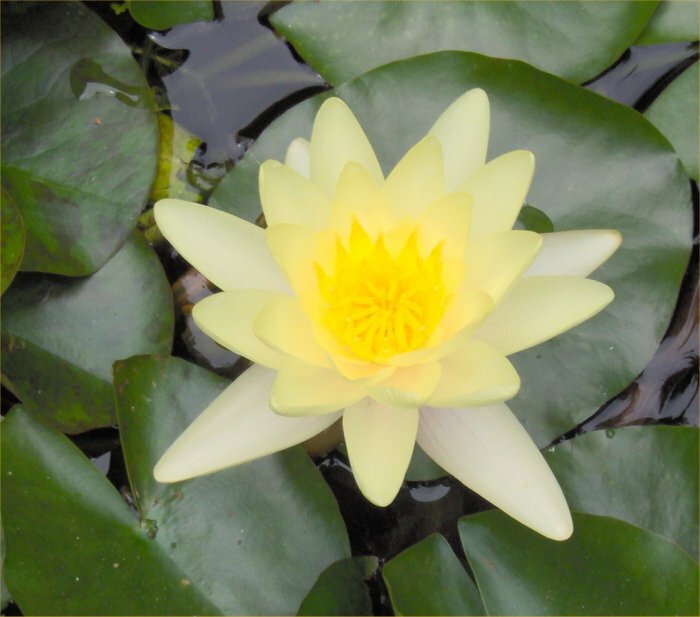 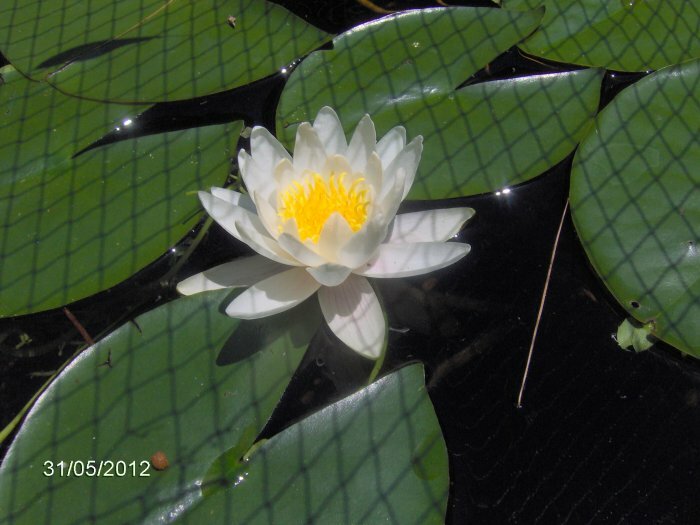 Tropical white waterlily in bloom in the 1800 gallon pond on 7/14/14, squished under the net. 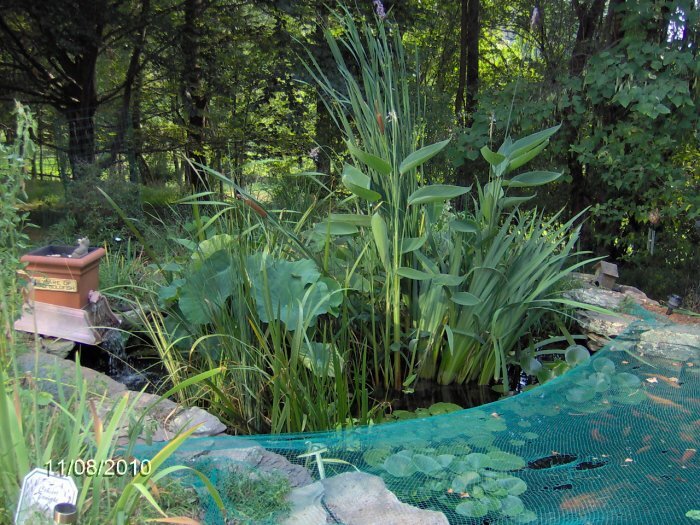 1800 gallon pond facing southwest, hardy canna and pickerel rush in bloom. 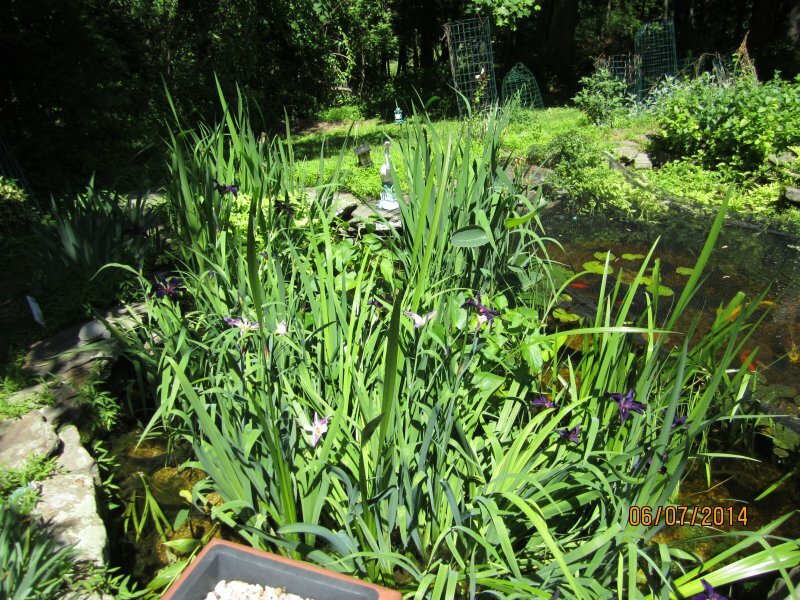 Pickerel rush and lizard tail in flower.Red terrestrial lily with the 1800 gallon pond in the background. 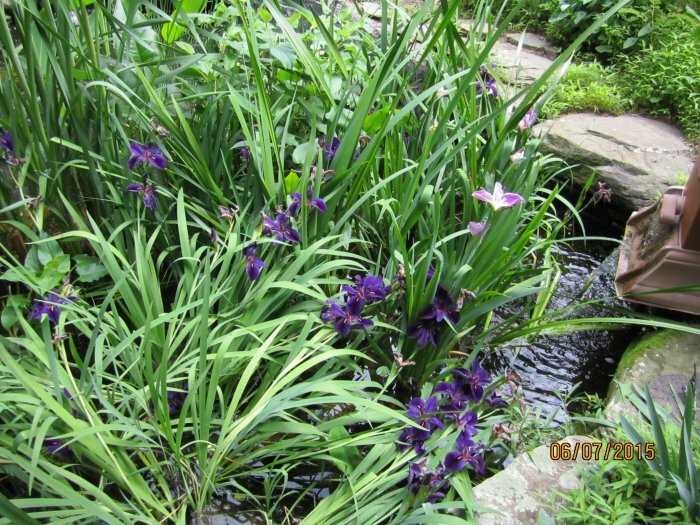 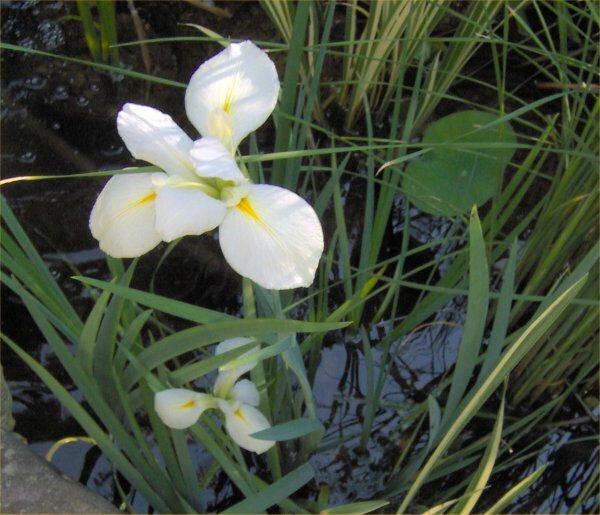 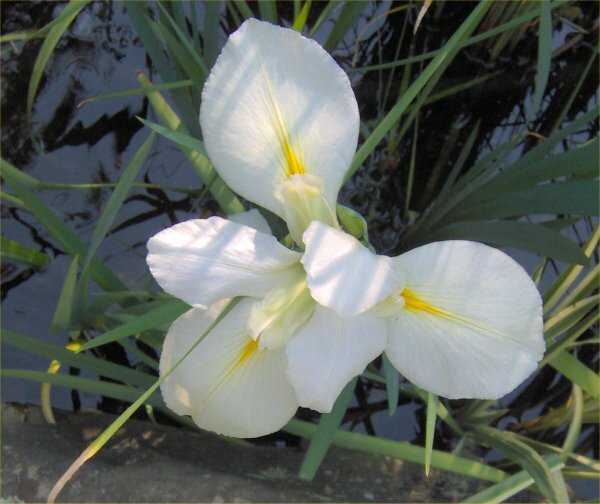 Iris in bloom - marginal area of the 1800 gallon pond, facing northwest. 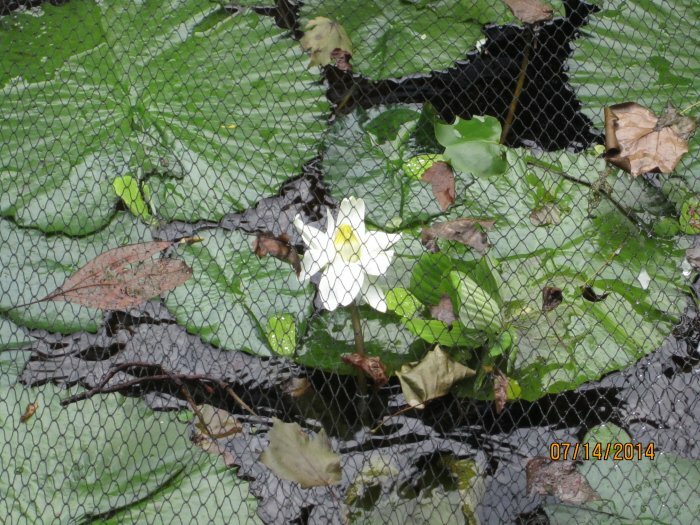 Albata lily in bloom in the 153 gallon pond. 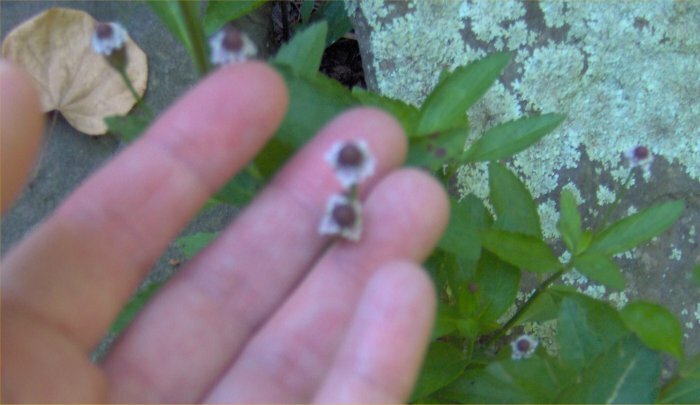 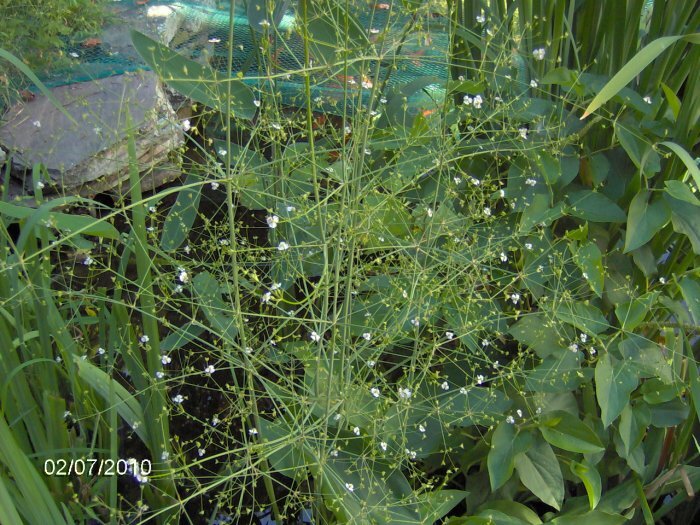 Also, notice the anacharis flowers. 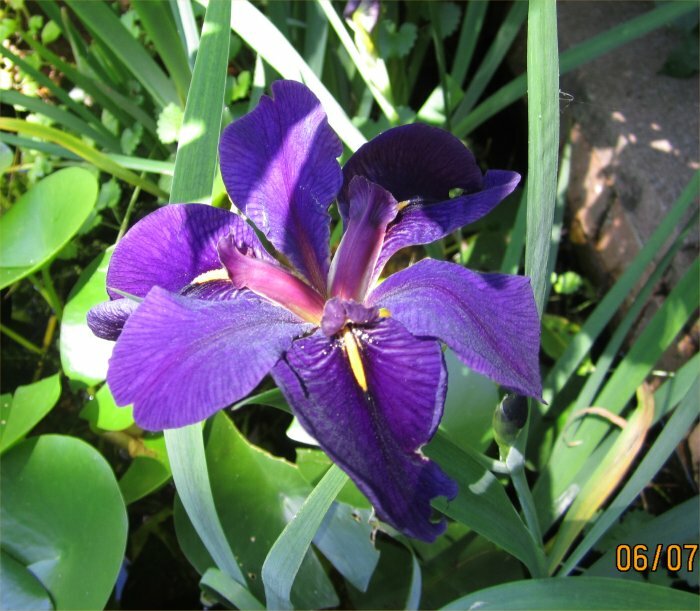 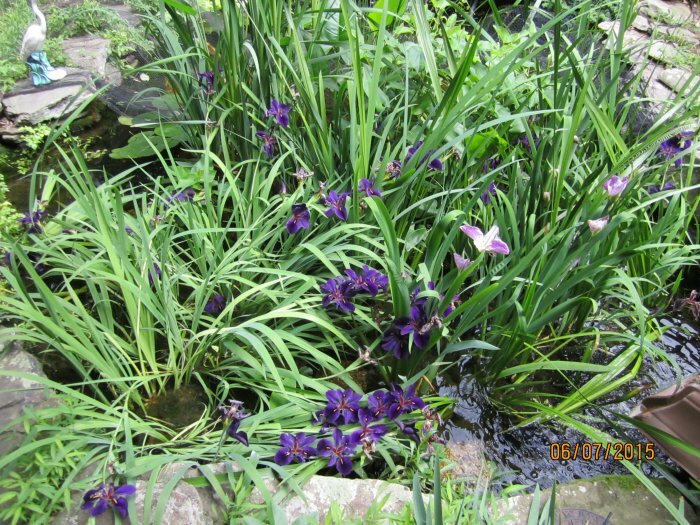 Purple iris in bloom in the 153 gallon pond, close-up. 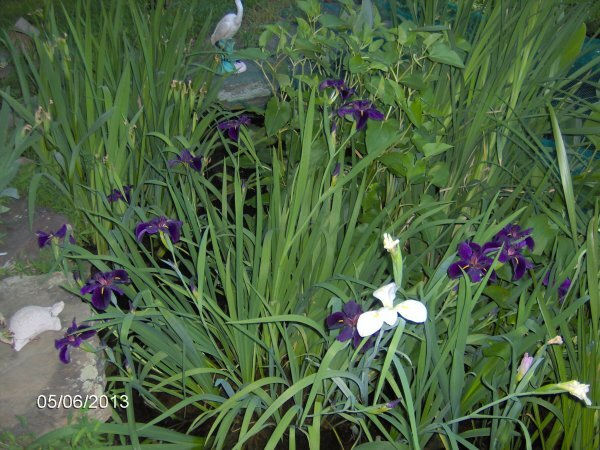 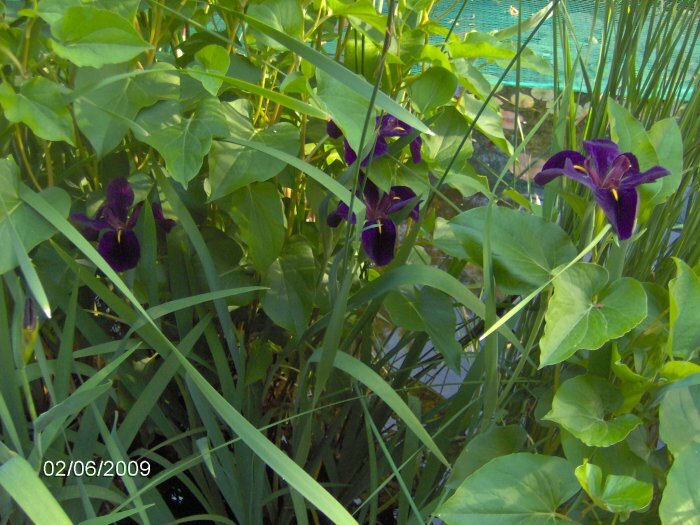 Purple iris in bloom in the 153 gallon pond, from a distance. 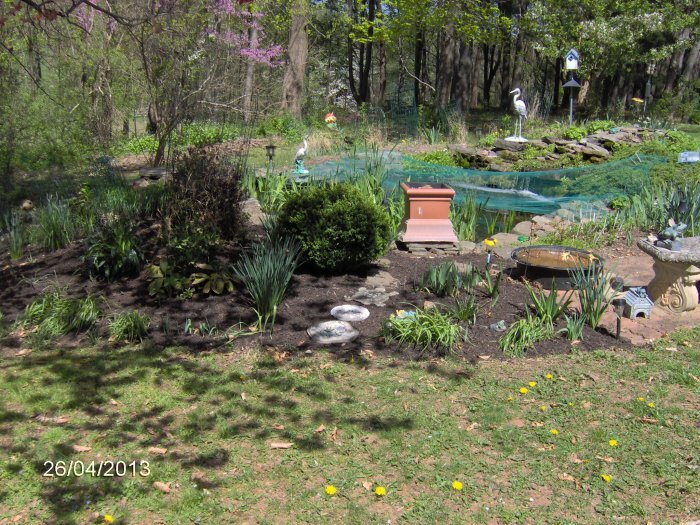 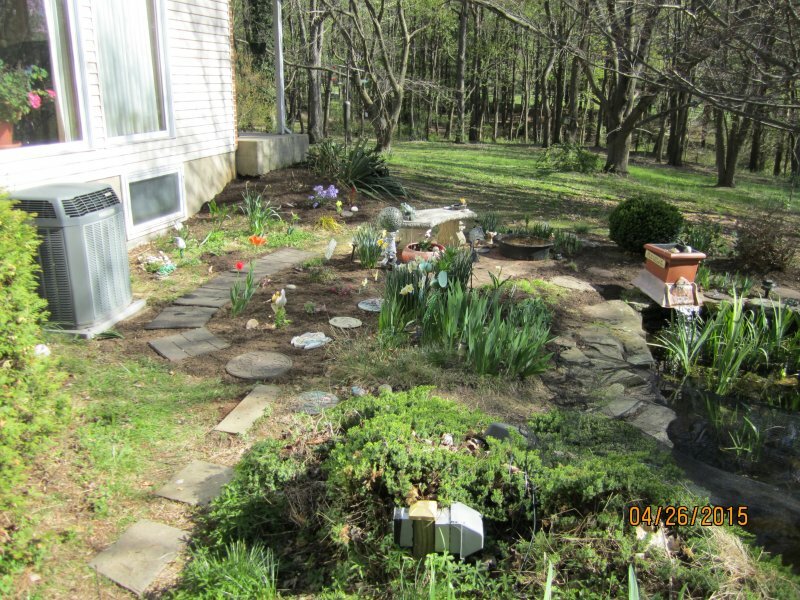 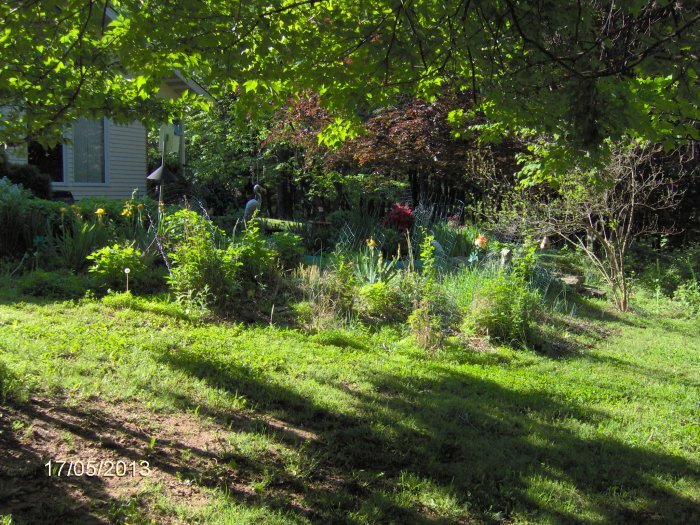 I took these photos on 4/20/14 after I mulched up a new area between the main pond garden and the garden on the side of the house (with a pathway between). 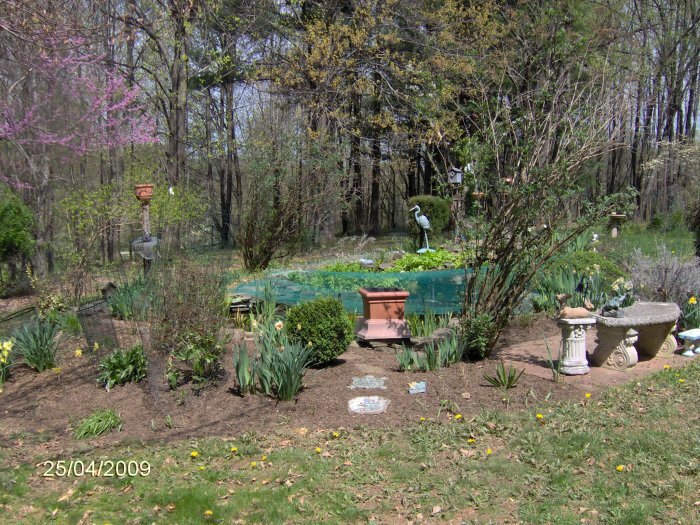 All three photos are facing northwest. 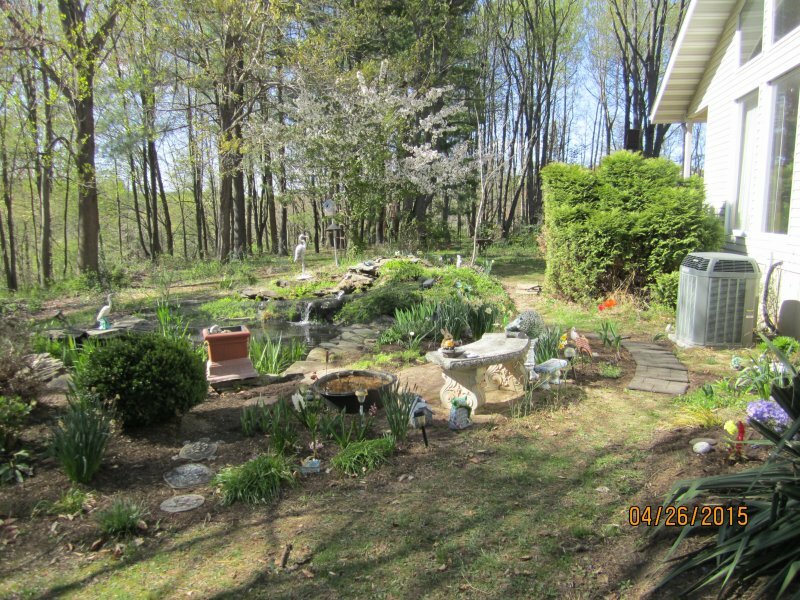 1800 gallon pond facing southwest on 4/10/14. 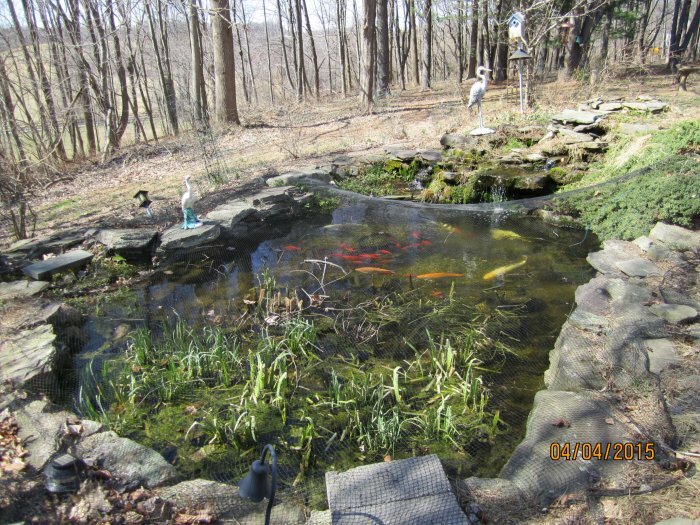 1800 gallon pond facing west on 3/23/14. 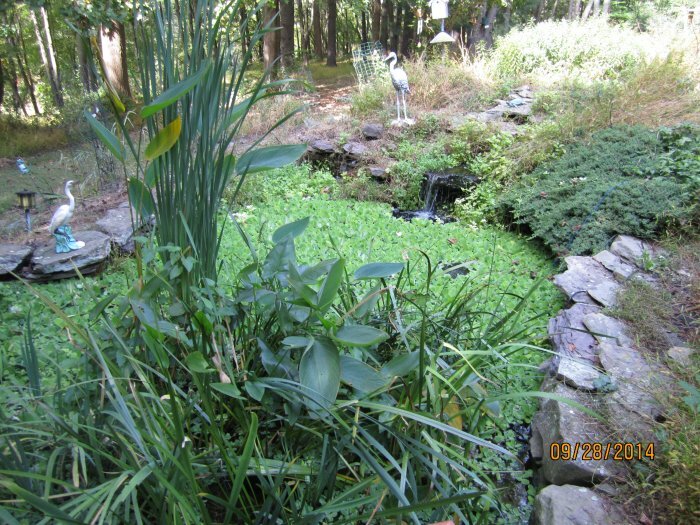 On 9/29/13, I took these photos of the pond. 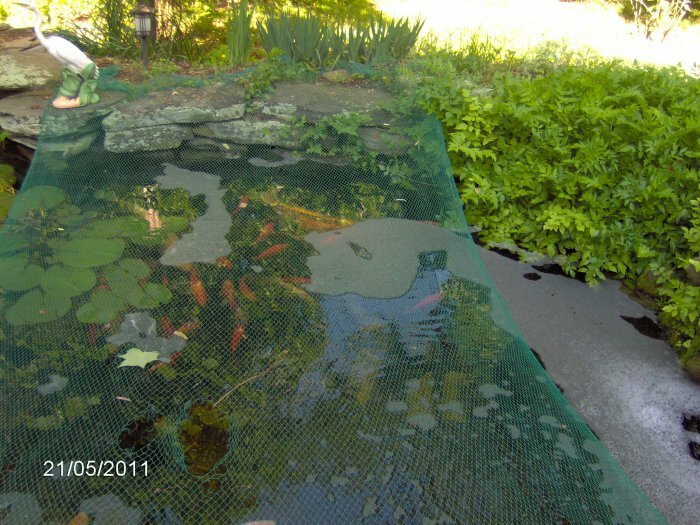 I took the half net off the pond and took these photos before I put on the full net for the fall. 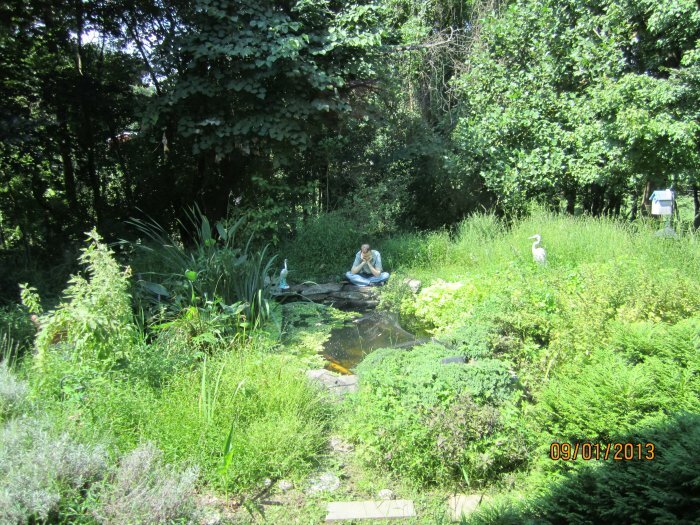 Here are photos of my brother sitting by my pond on 9/1/13. 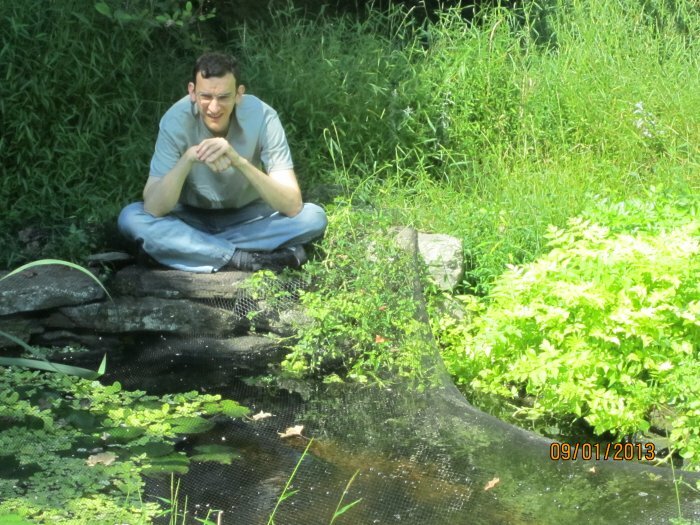 I call him the "Thinking Man" because he seems to be postulating something intense. 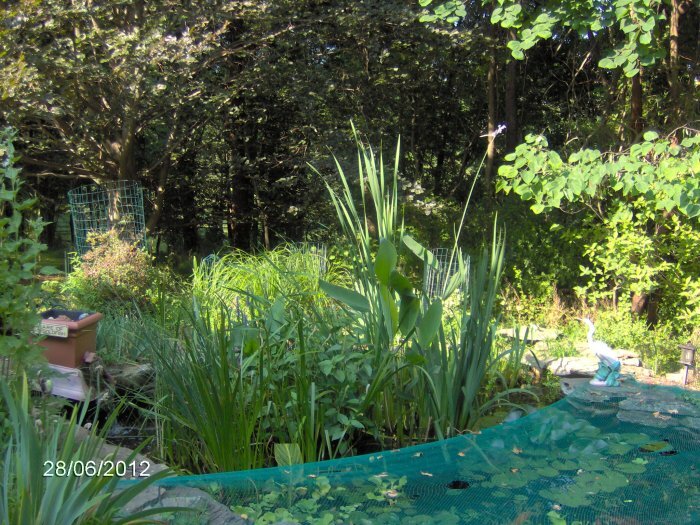 Pond with brother - from a distance. 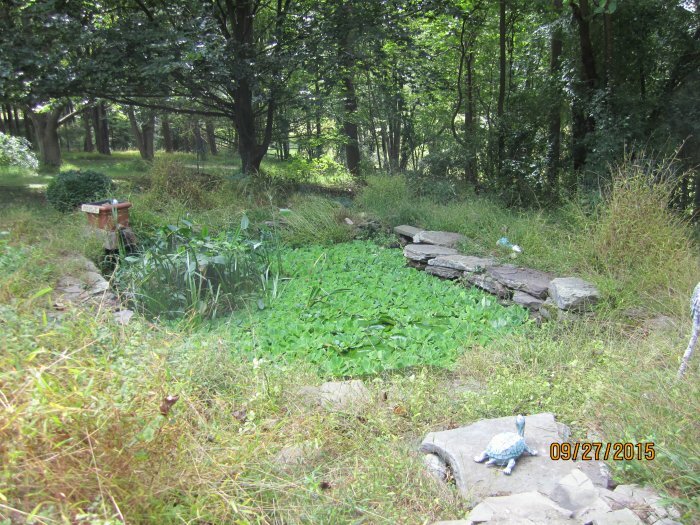 The pond area was completely taken over by weeds! 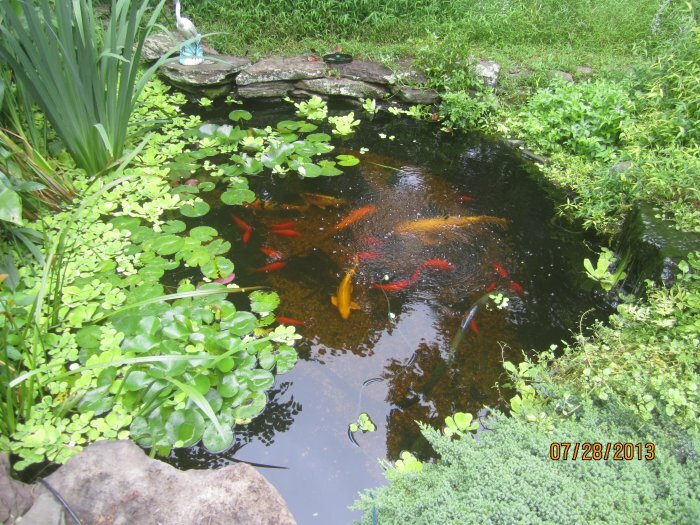 You can see my biggest fish, koi Colin. 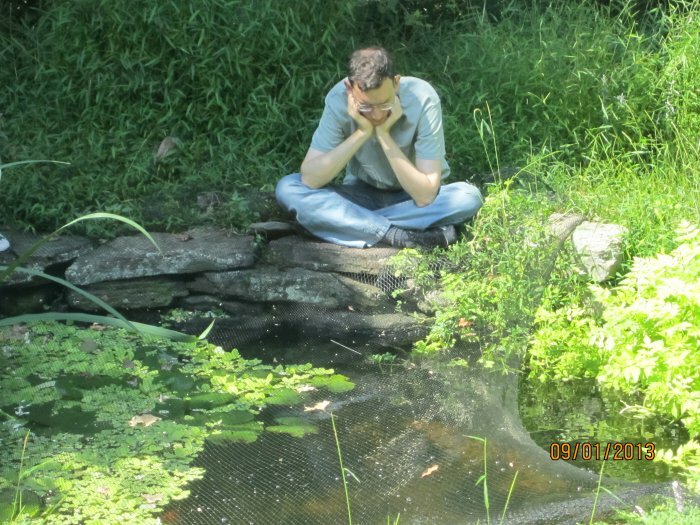 Thinking Man - he does not see me inside taking photos. 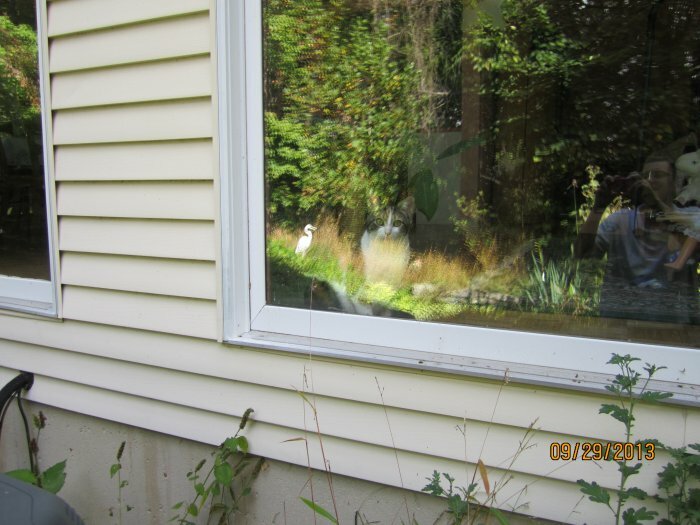 Thinking Man - ut oh, he sees me, and he's not happy! 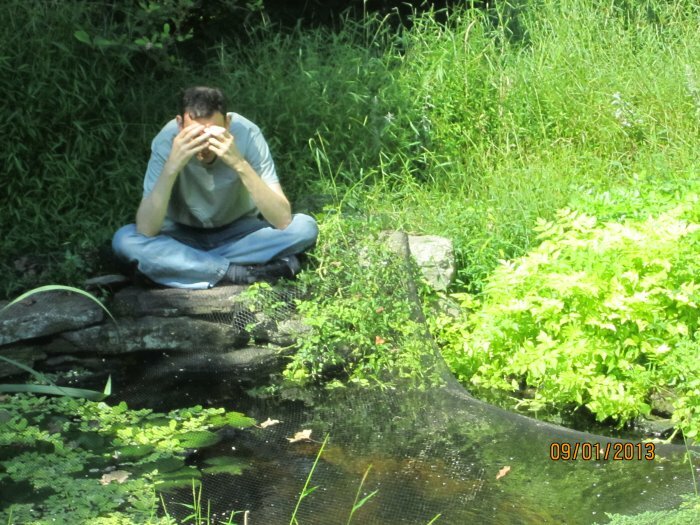 Thinking Man - now he hides. 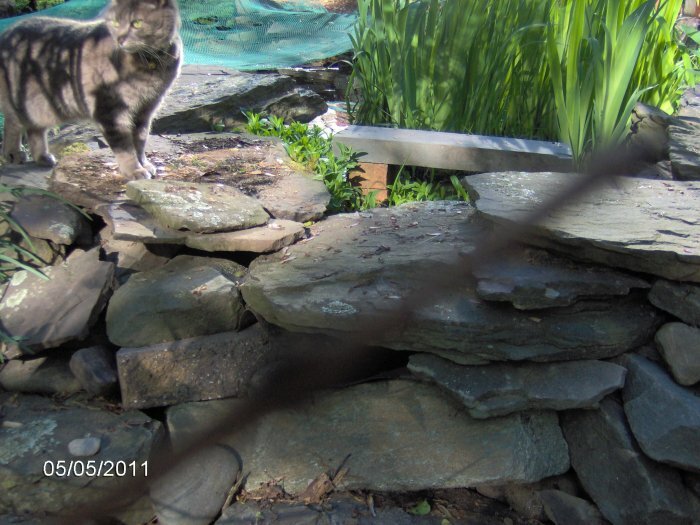 Or, maybe he's doing his impression of "Monkey, see no evil." 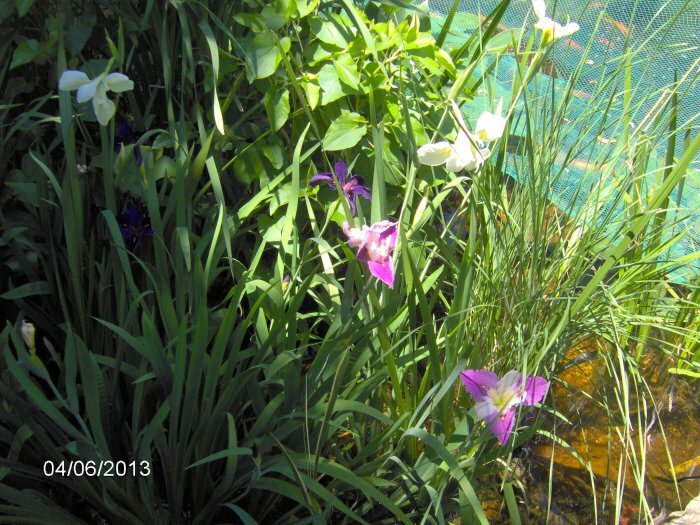 More photos of the pond iris in the big pond in bloom on 6/5/13. 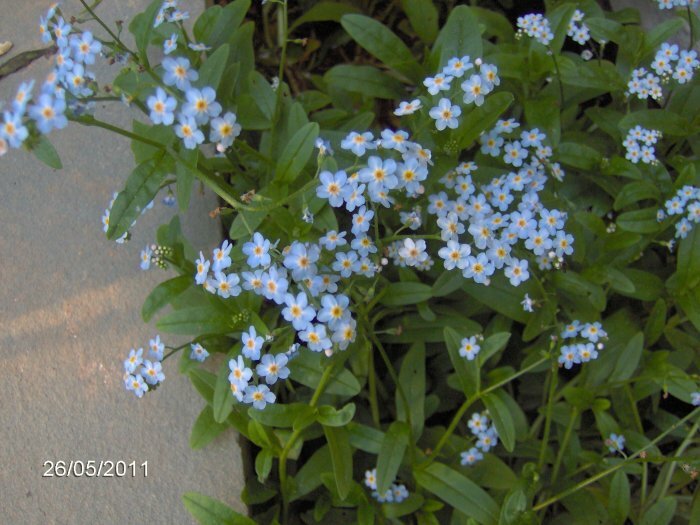 They were so gorgeous! 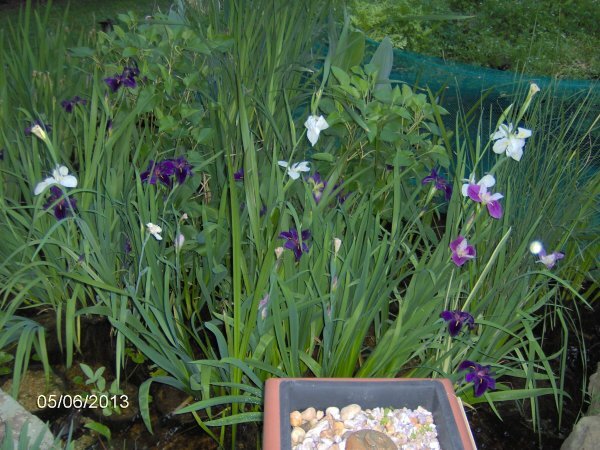 Purple, White, and Colorific Iris - so many blooms! 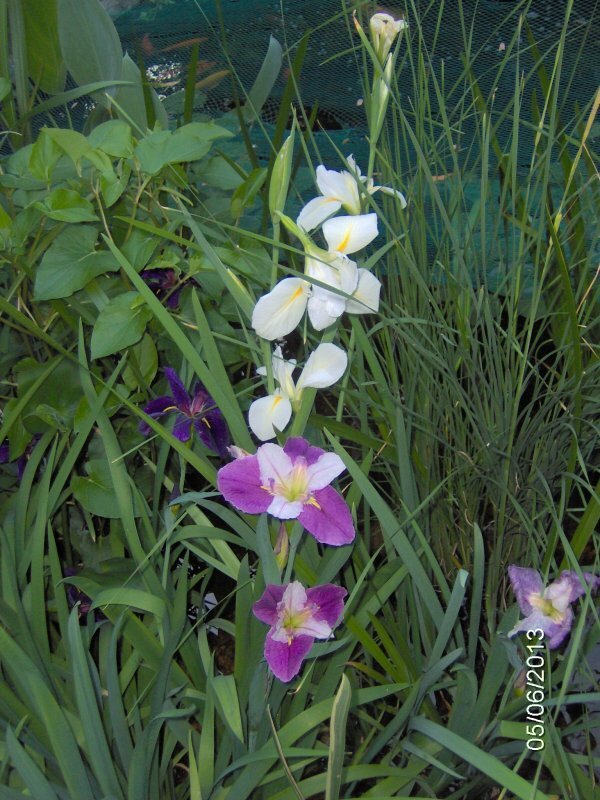 Purple, White, and Colorific Iris - so awesome! 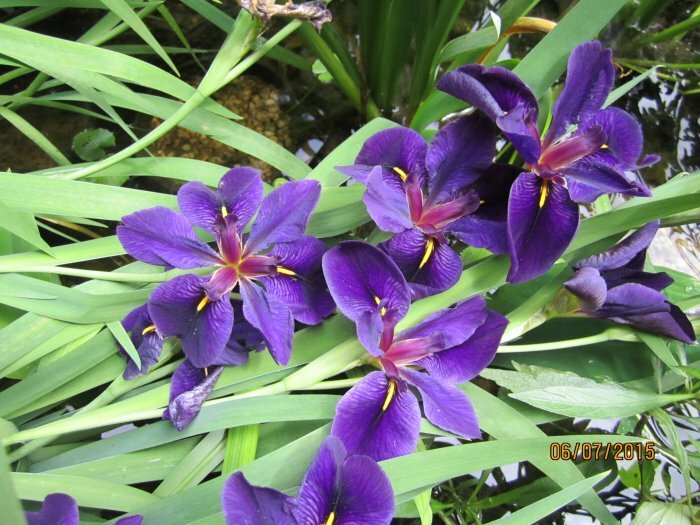 Can you tell I like iris? 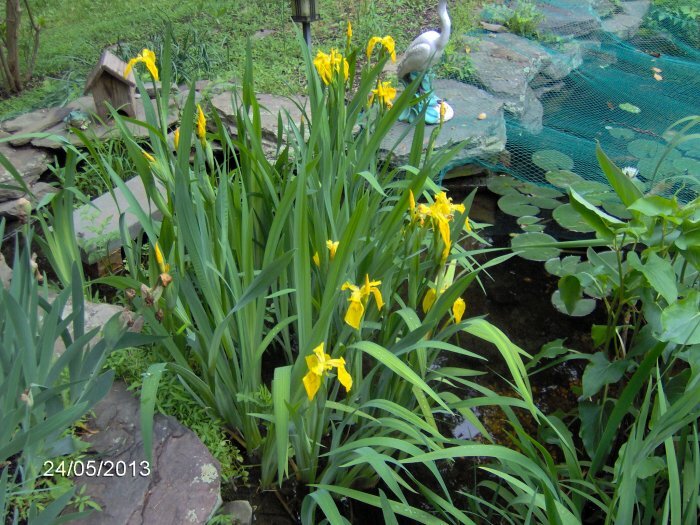 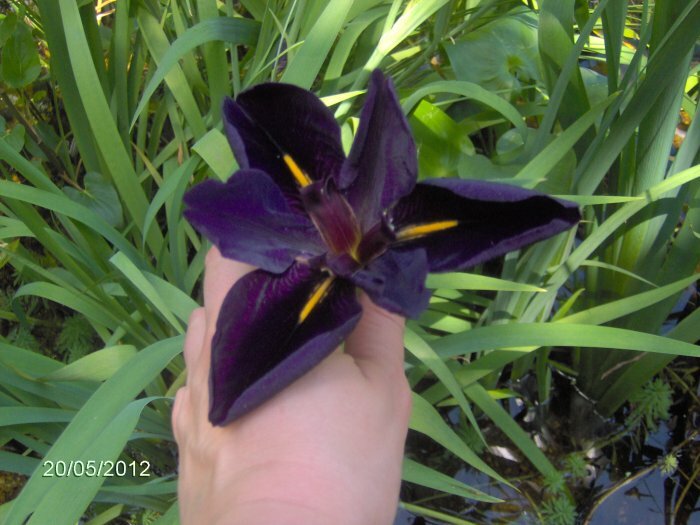 Yellow flag iris blooming in the 1800 gallon pond on 5/24/13. 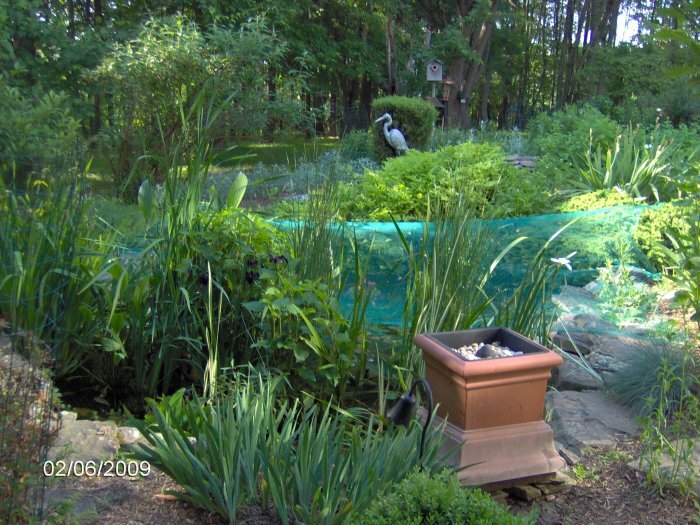 Big pond area - view from below the pond, facing southeast. 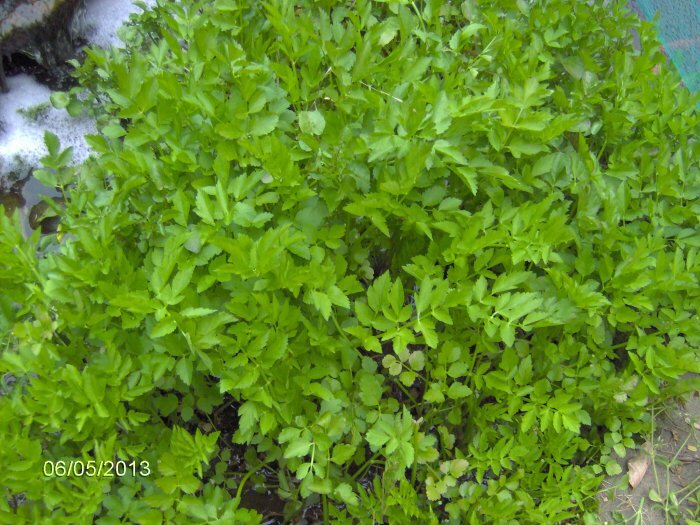 Water celery at the bottom of the waterfall on 5/6/13. 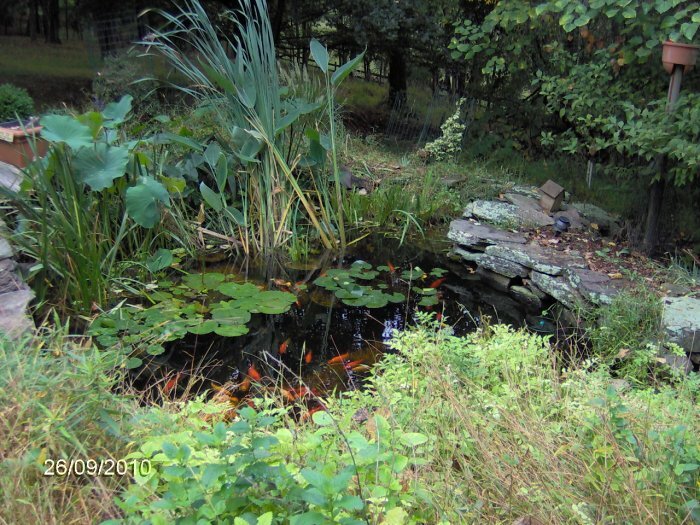 Pond facing northwest. 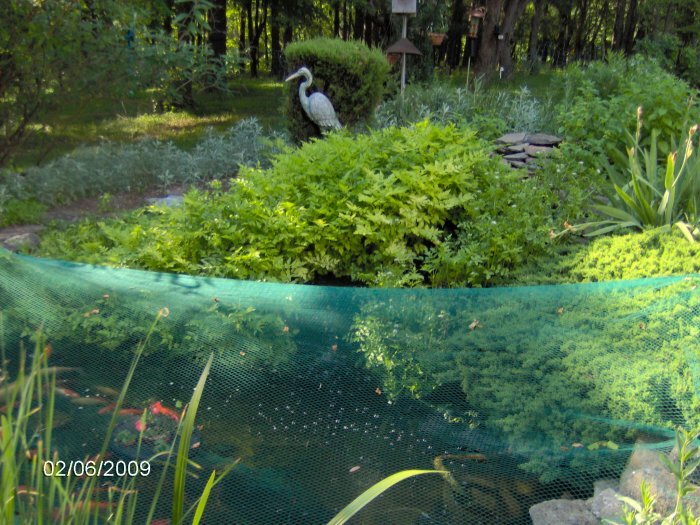 You can see the fish. 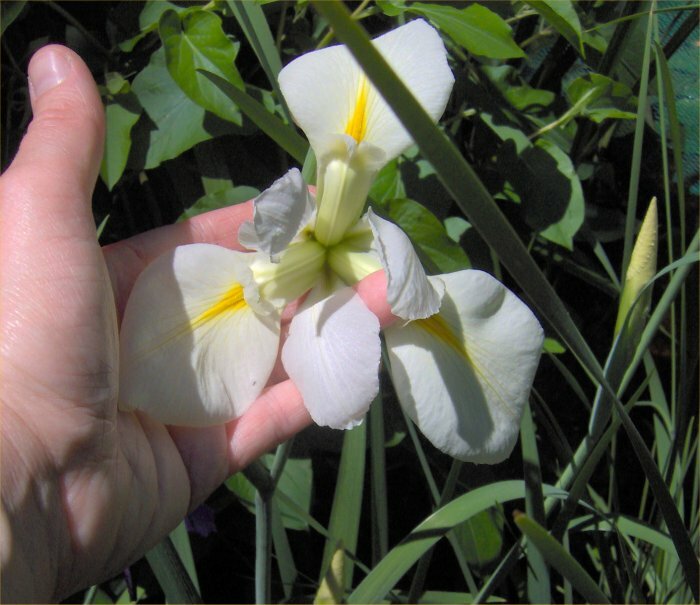 Canna in bloom, close-up of the flowers. 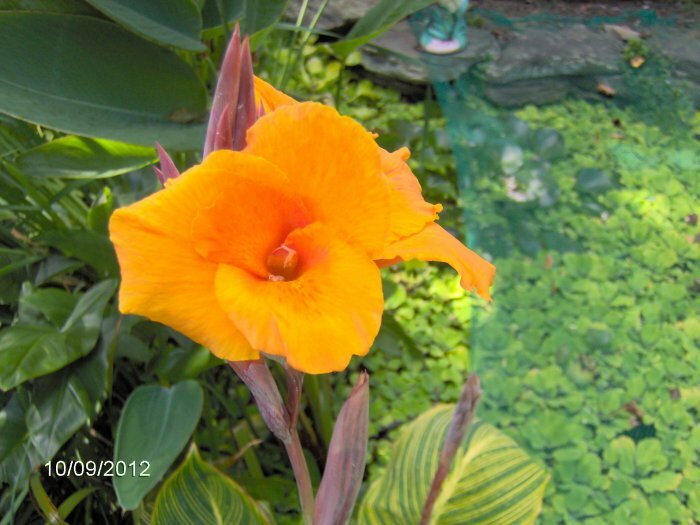 This is an orange variegated tropical aquatic canna. 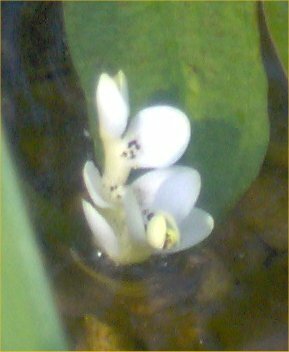 Canna in bloom, from a distance. 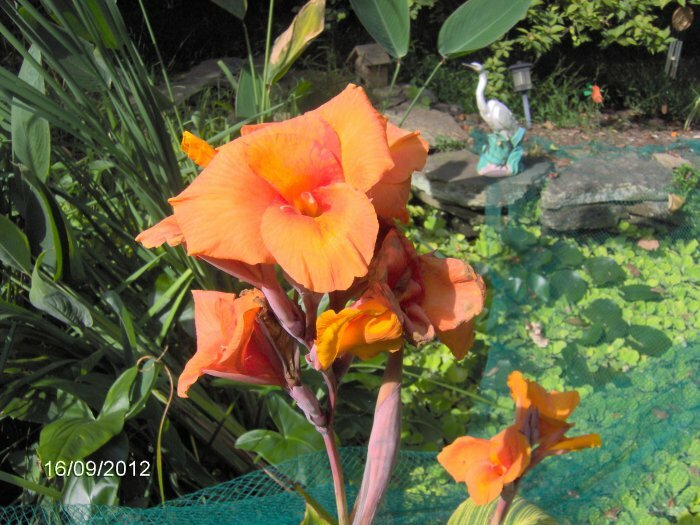 Canna in bloom again. 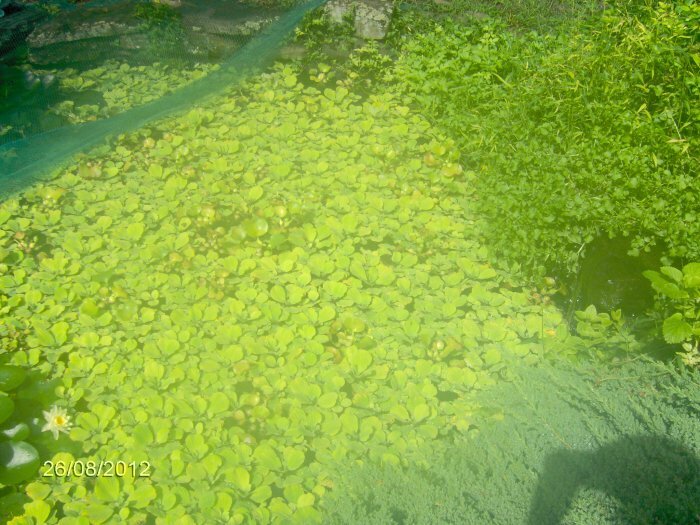 You can also see a lot of water lettuce. 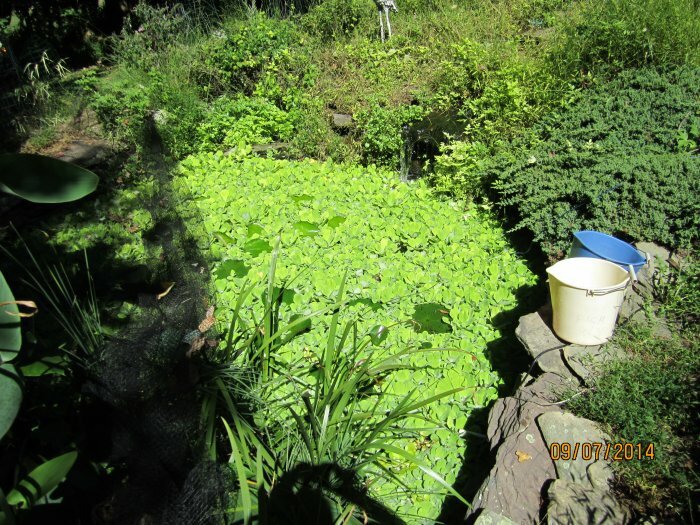 Water lettuce completely covering my 1800 gallon pond. 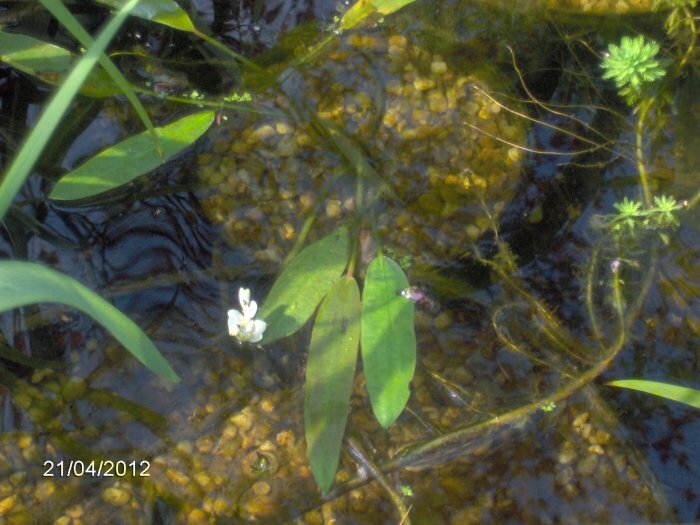 There is also one Chromella waterlily flower at the bottom left. 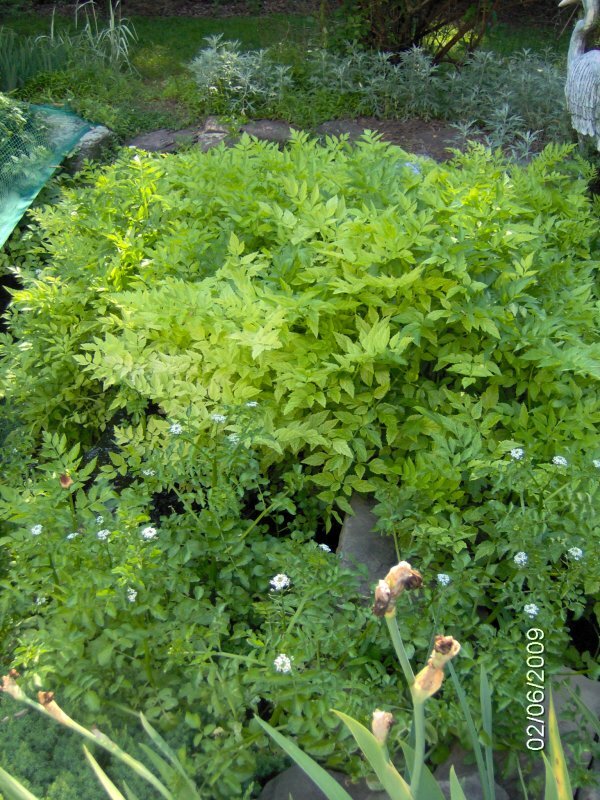 The upper right are is where the waterfalls are which were covered in water celery and watercress. 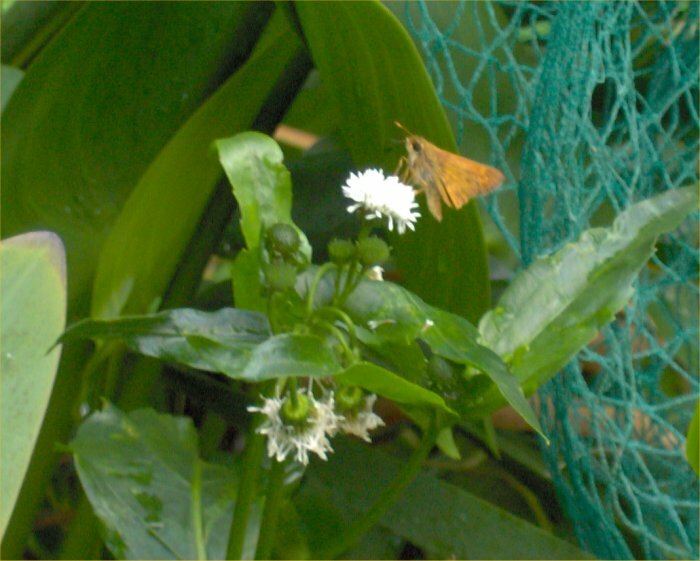 Snowball plant flowers - with a butterfly! 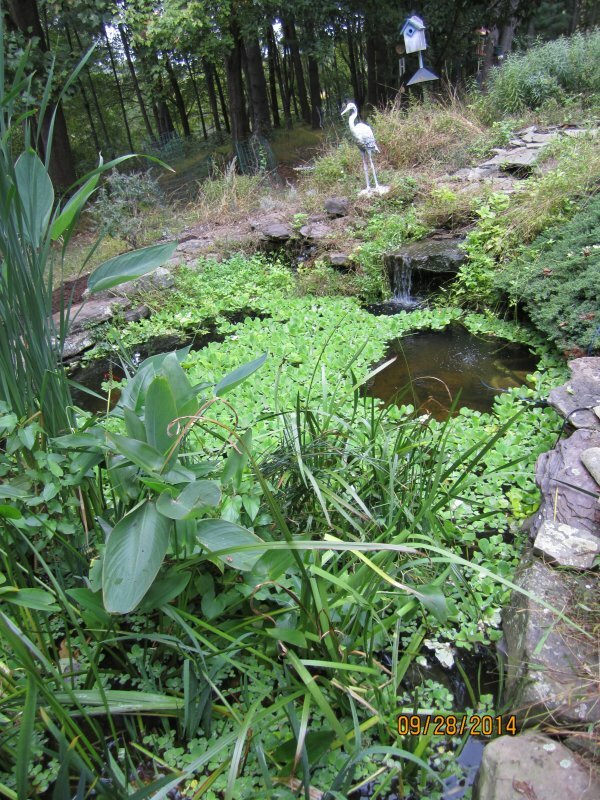 Big pond facing northwest, including flowering pickerel rush. 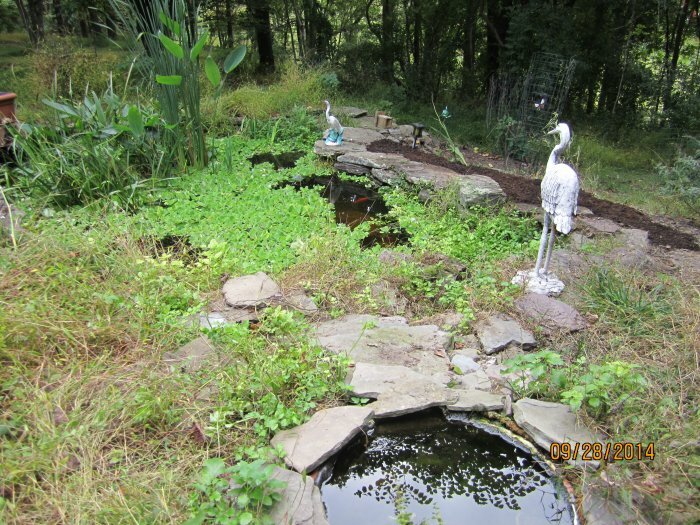 You can see how completely the waterfall and pond are covered in plants by late August. 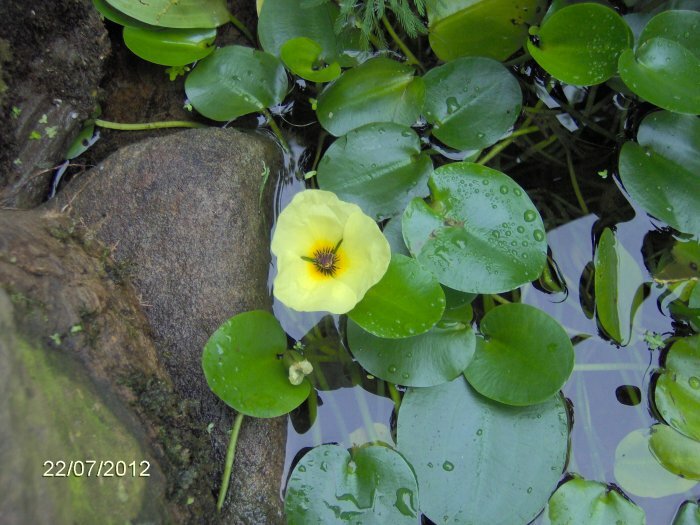 Here are some photos from 7/22/12 of flowering tropical water poppy. 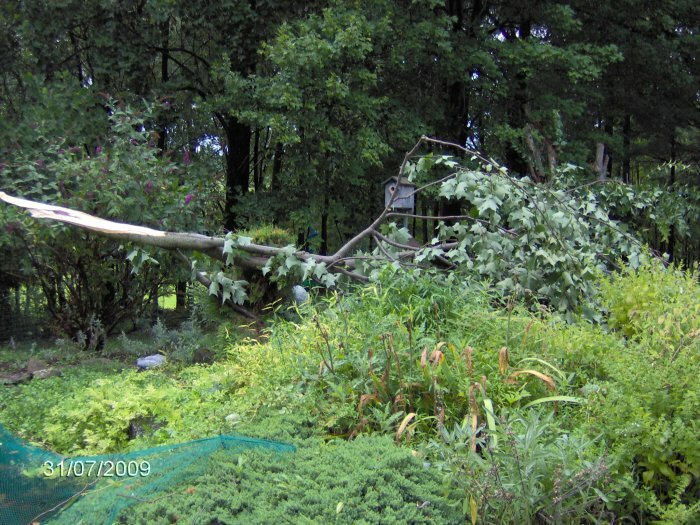 Tree down over the 1800 gallon on 6/30/12. 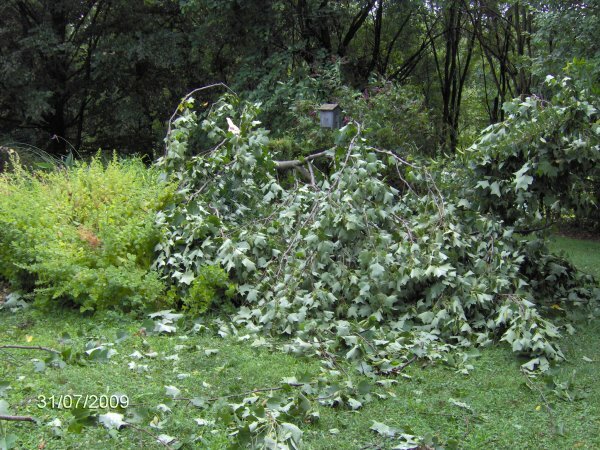 A derecho (massive storm with winds over 60 mph) came through the night before and took down hundreds of trees and branches. 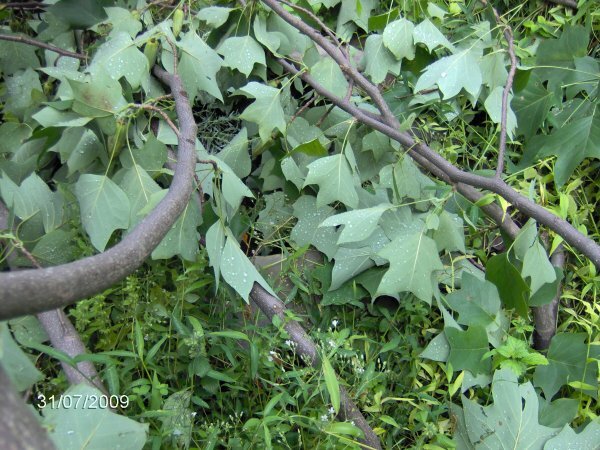 A series of large tulip poplar branches fell on the west side of the pond but missed going in the pond. 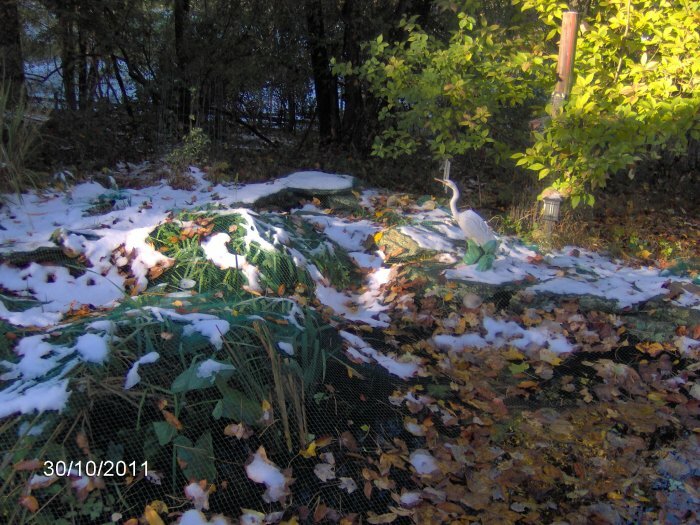 It does not look like much in that photo but it took a few weeks just to clear that pile. 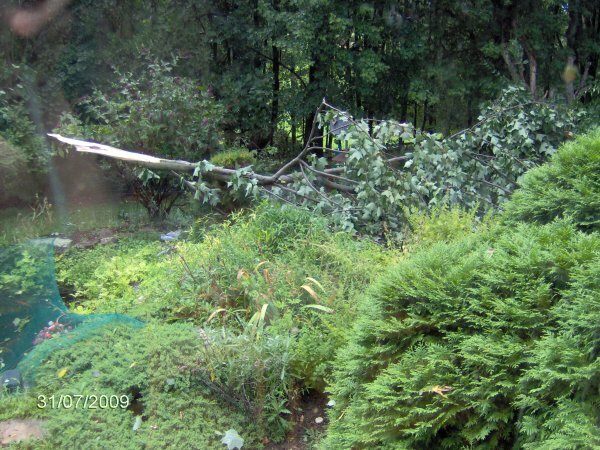 As of 9/27/12 (today), we are still clearing trees that were toppled in the derecho, and we will never finish. 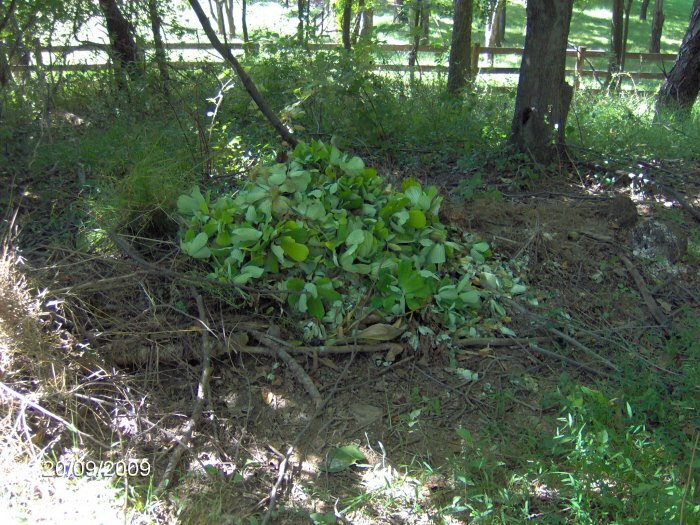 My father has been counting loads of tree debris to the dump, and I think he is up to 30. 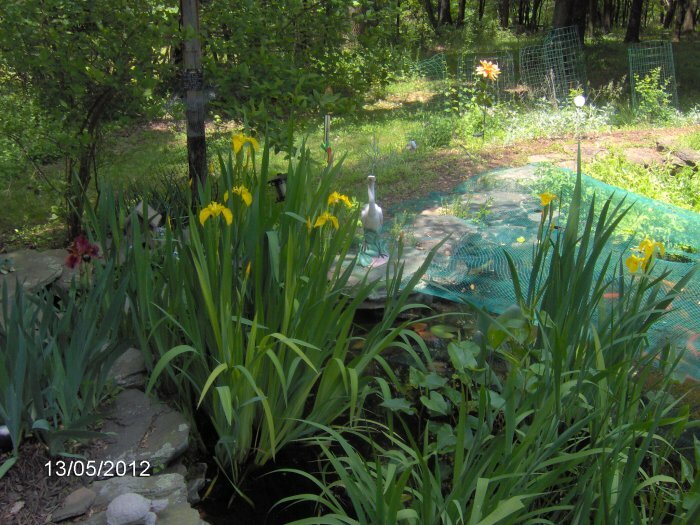 Pond facing southwest on 6/28/12. 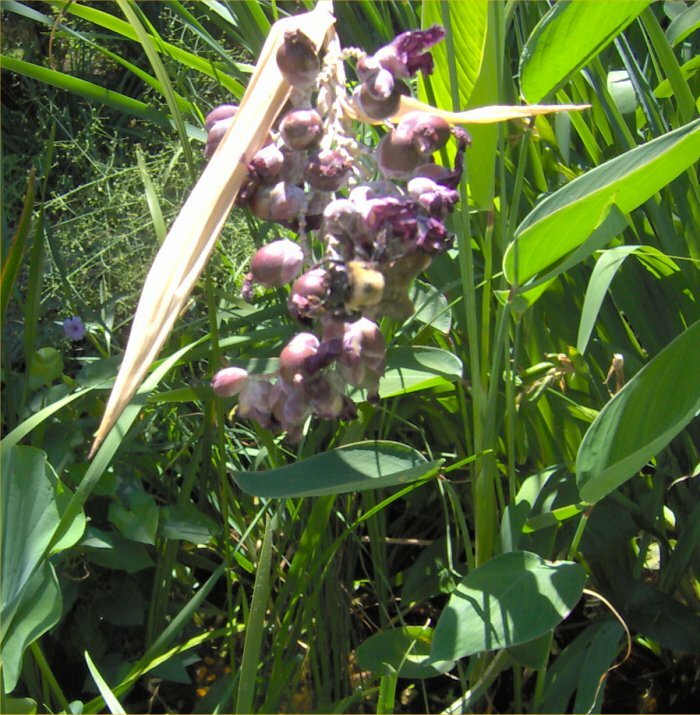 Flowering pickerel rush and lizard tail in the marginal area of the big pond. 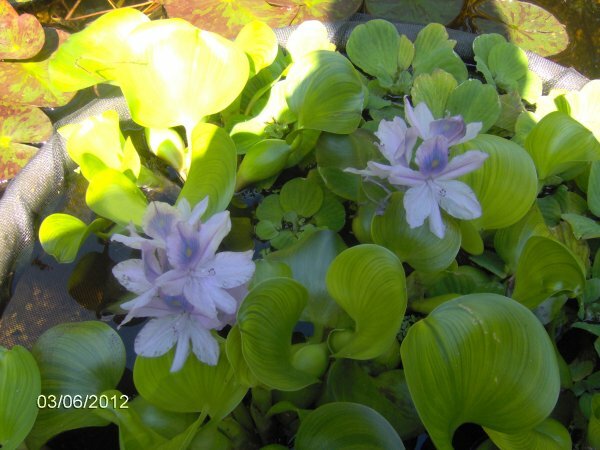 On 6/3/12, my water hyacinth actually bloomed for the first time in years! 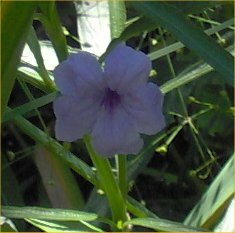 They were in a hoop, and I had not had them for long. 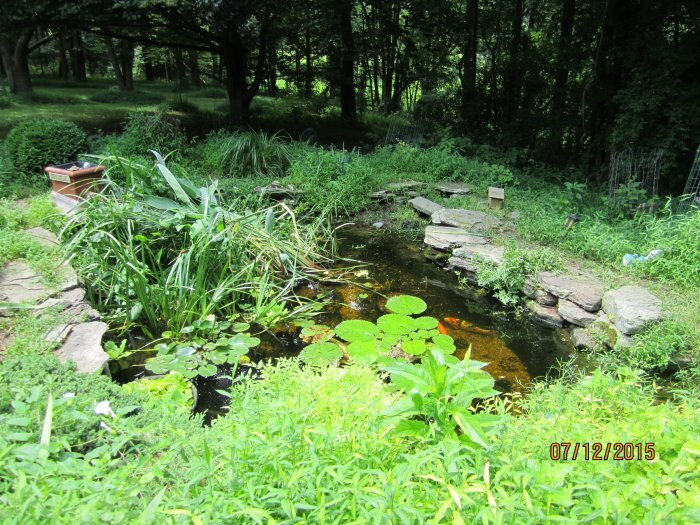 Pond facing northwest. 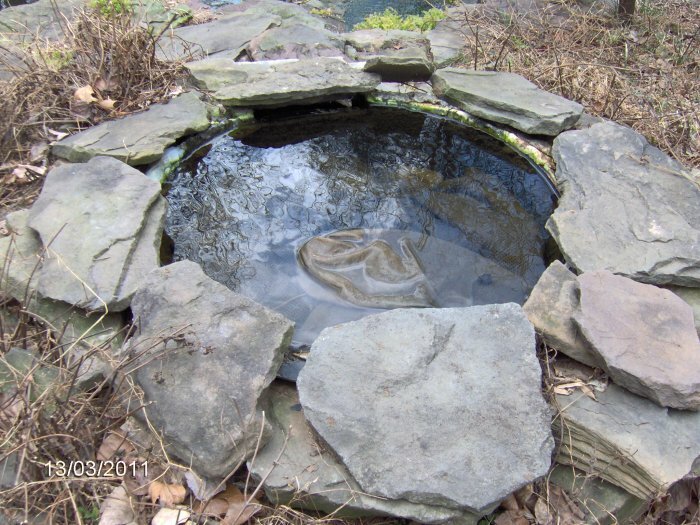 The lotus tub pond can also be seen. 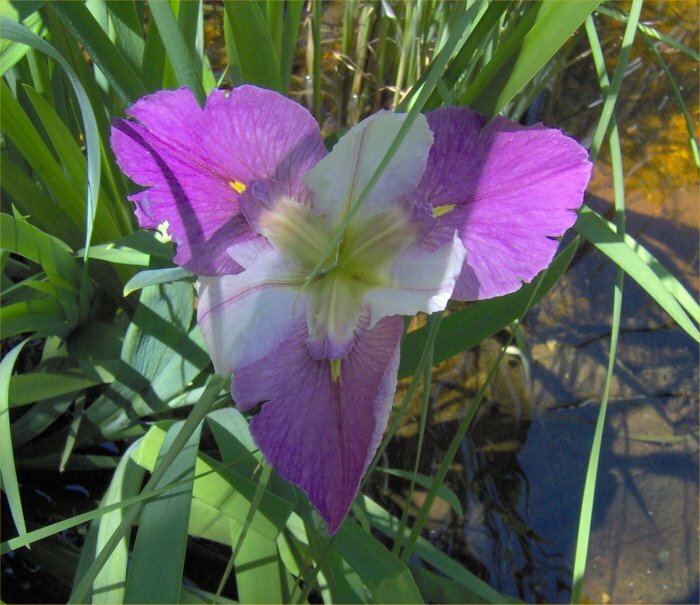 Flowering iris in the 1800 gallon pond, flowering purple iris and yellow flag iris in the marginal area. 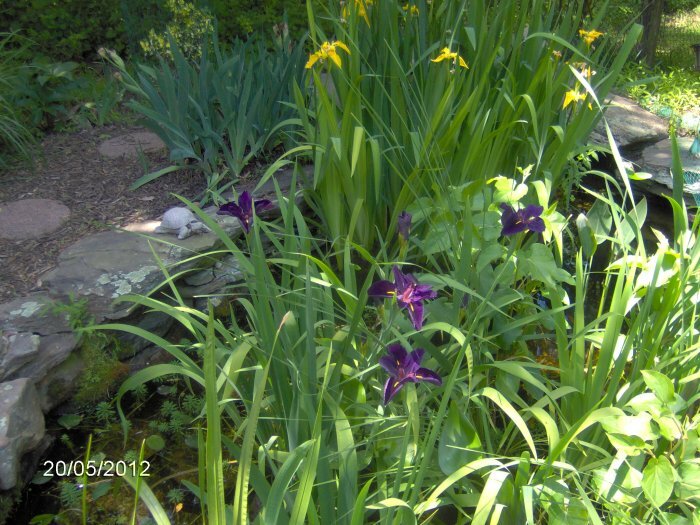 Flowering iris in the 1800 gallon pond, flowering purple iris and yellow flag iris in the marginal area, facing south. 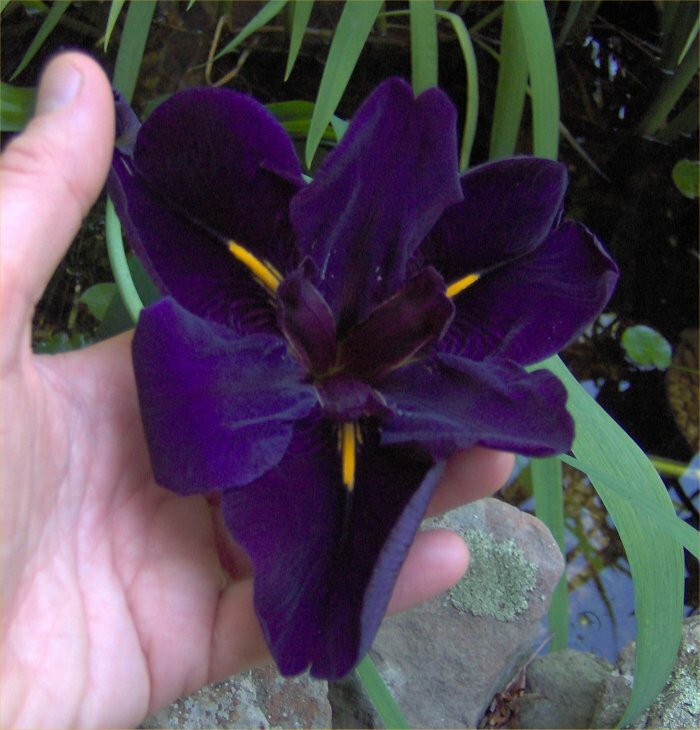 Blue standard iris, facing southeast. 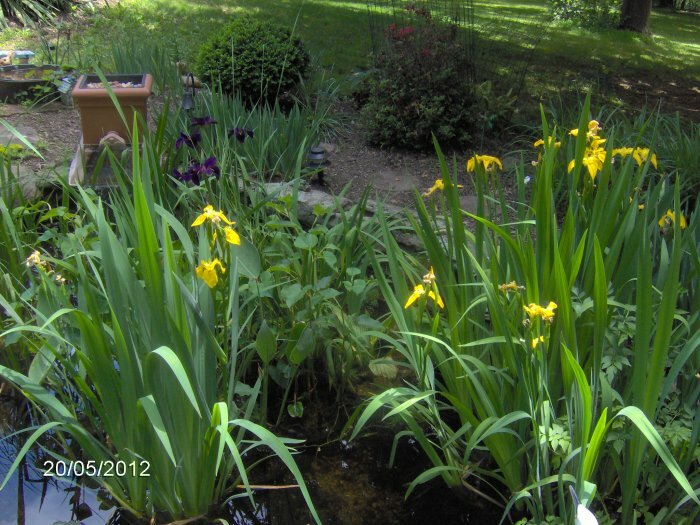 Yellow flag iris flowering in the big pond, facing northwest. 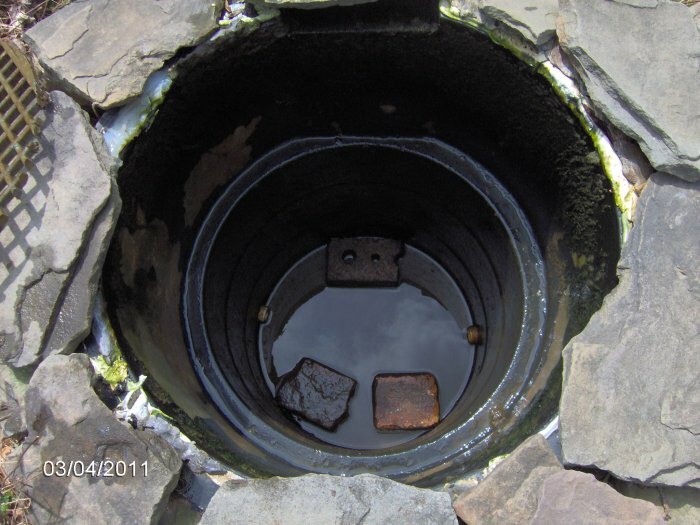 Crushed pump pre-filter - inside view of the inlet filter for the PondMaster Mag Drive Pump Model 12; it collapsed due to heavy debris during spawning. 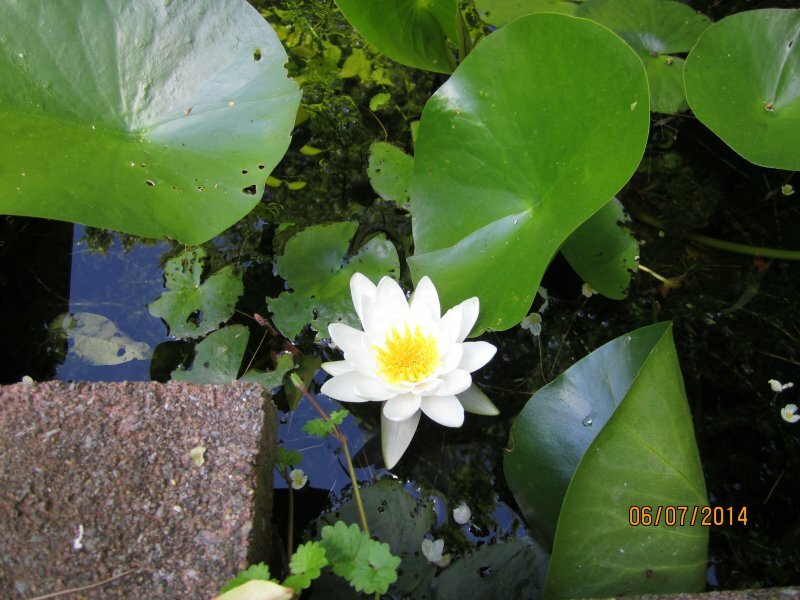 I bought a new one. 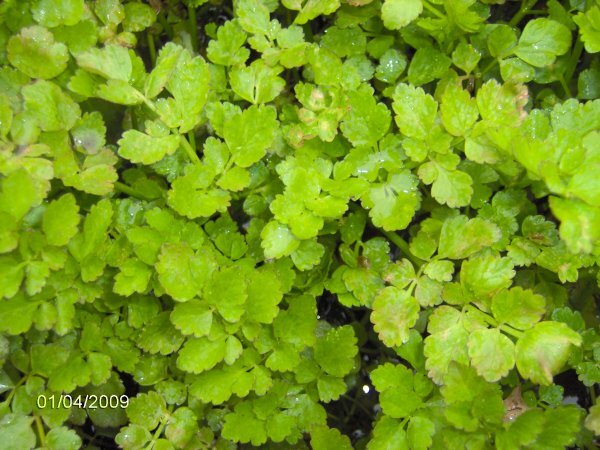 Water hawthorn - close- up of the flower from the previous photo. 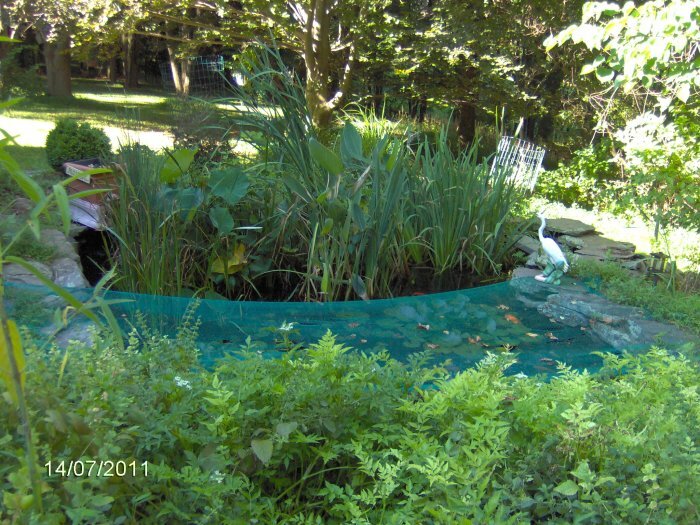 1800 gallon pond - net on, facing southwest. 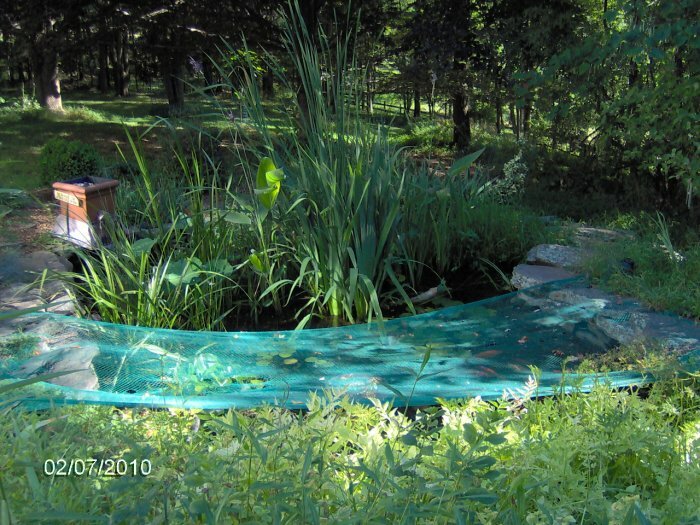 1800 gallon pond - net off, facing southwest. 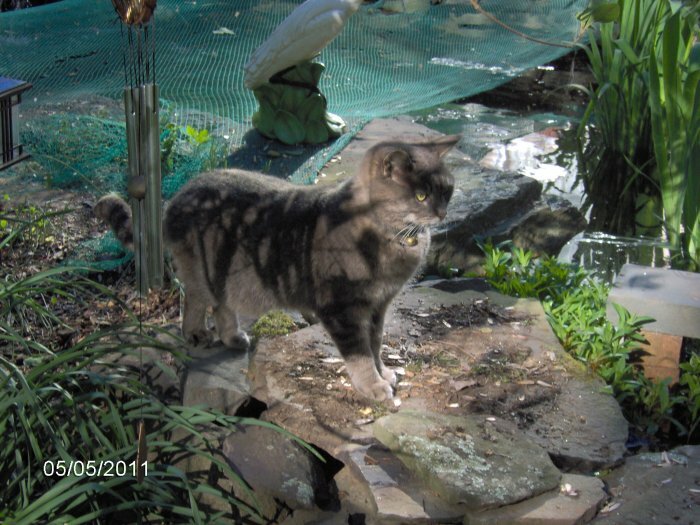 The foaming is from MelaFix. 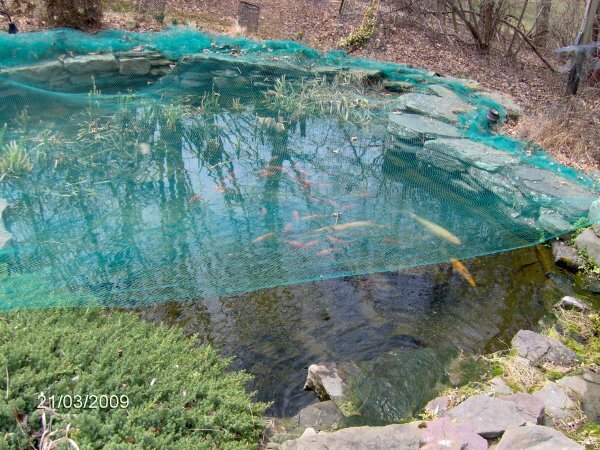 1800 gallon pond - net off, closer in, facing southwest. 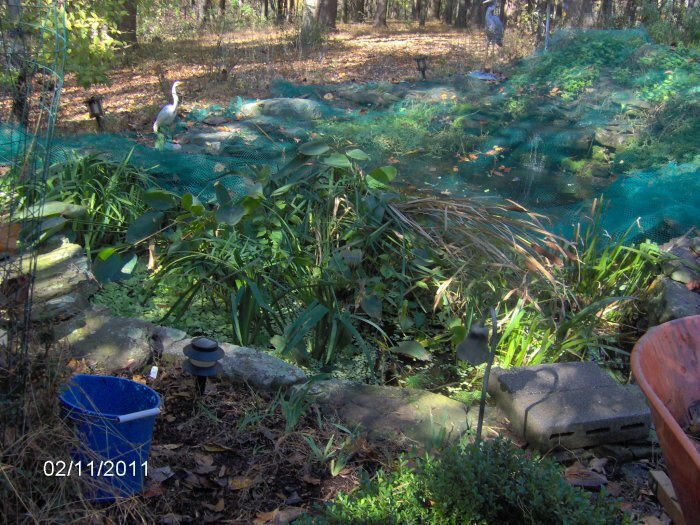 These photos are from 11/2/11 when I cut down the majority of the marginals in the 1800 gallon pond. 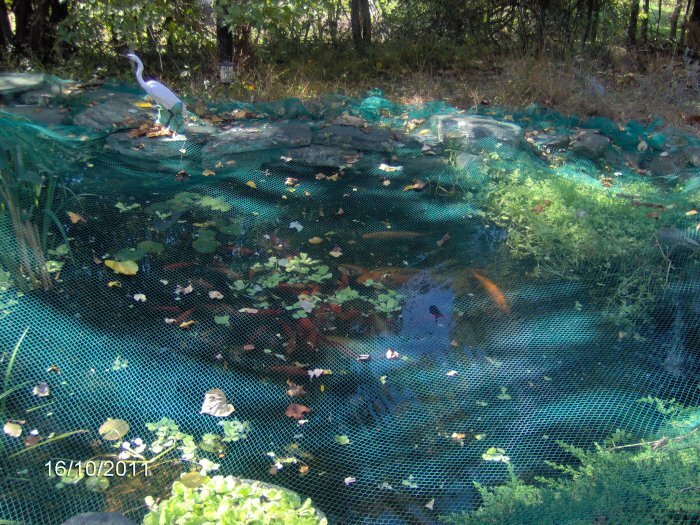 1800 gallon pond - facing west; note all the leaves on the net. 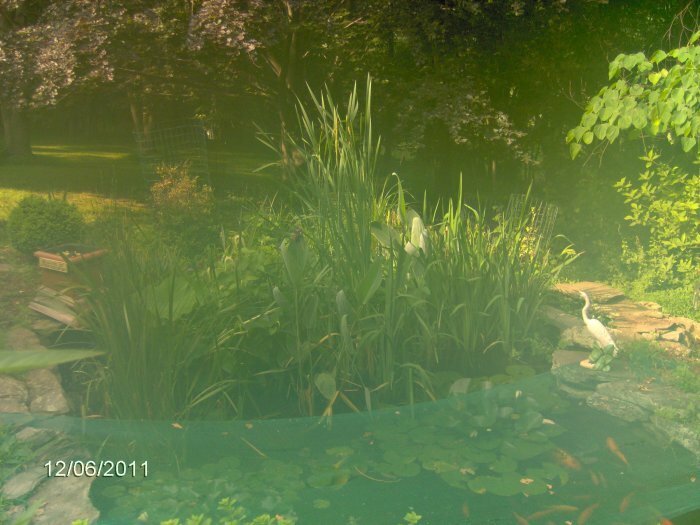 These photos are from my pond on 10/16/11. 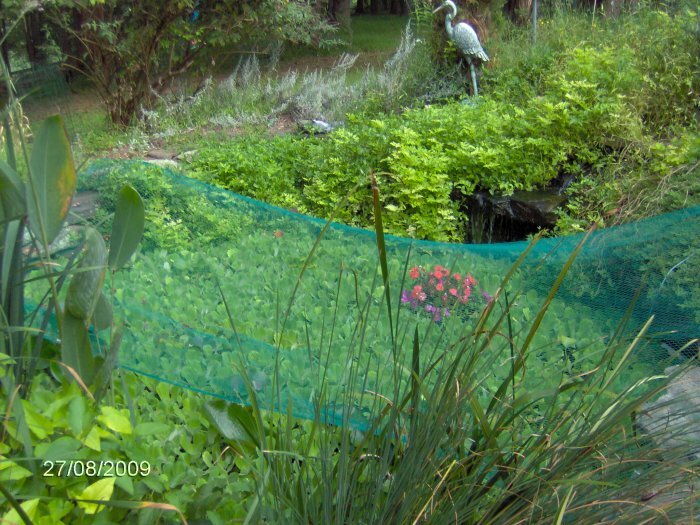 The nets were on. 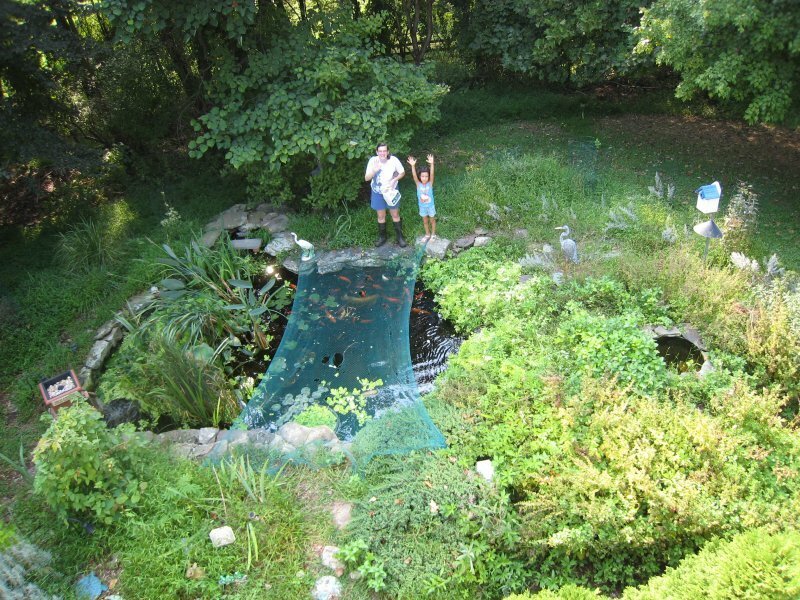 My brother took these photos of my pond on 9/4/11 from the roof! 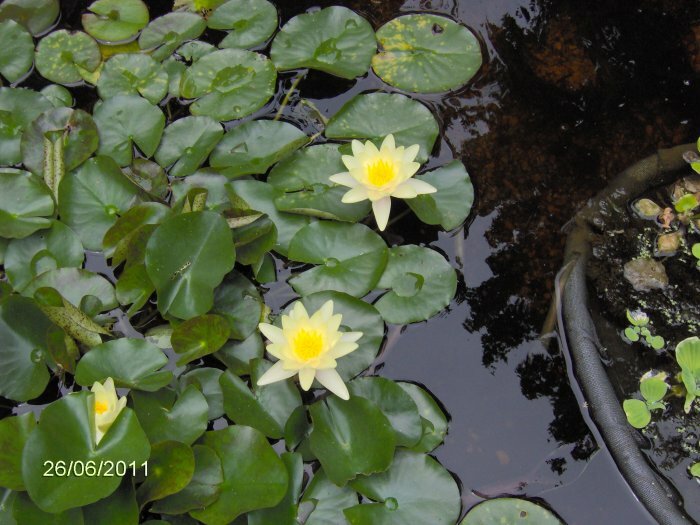 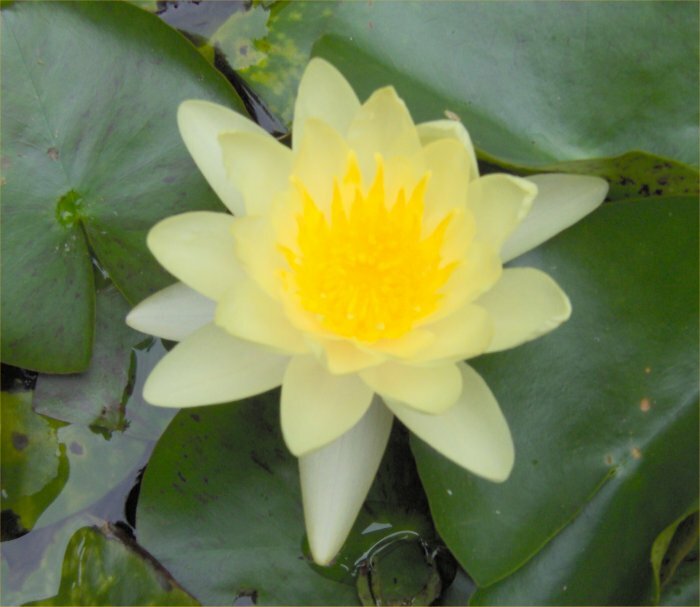 Waterlilies - one Chromatella (yellow) flower and one James Brydon (red) flower in bloom. 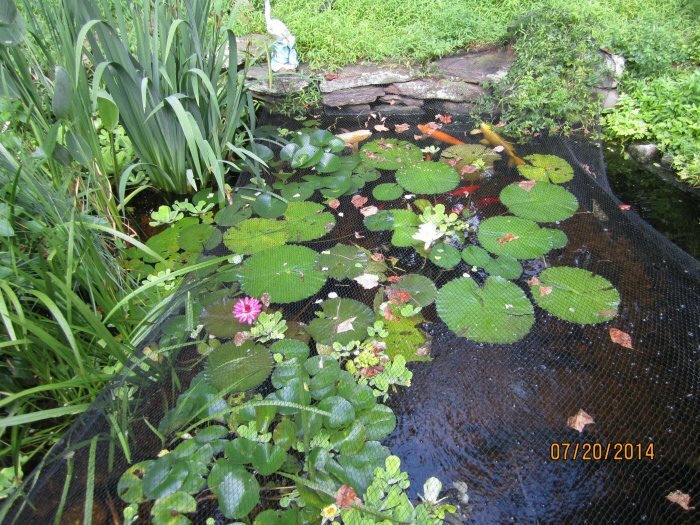 1800 gallon pond deep end. 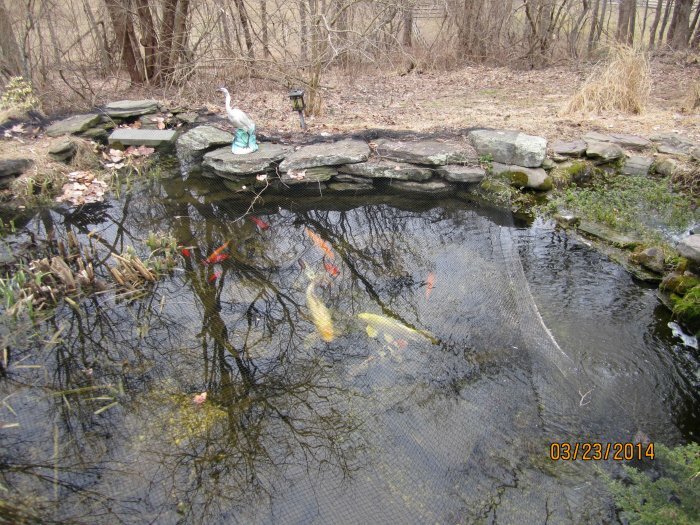 You can see the water celery flowering, my big koi Maggie (biggest orange fish), orfe, goldfish, and some plants. 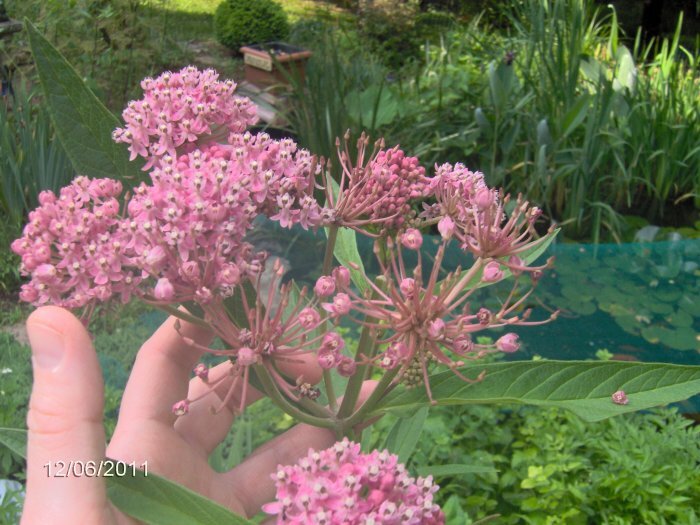 Milkweed in flower. 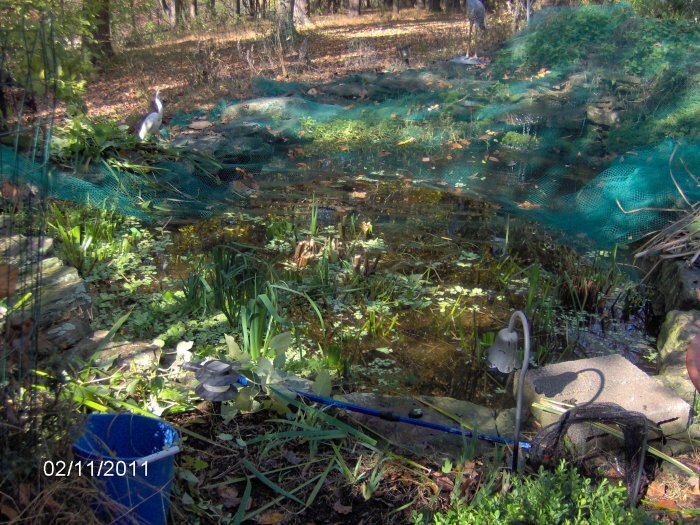 This also turned out to be a good overall 1800 gallon pond photo in the background. 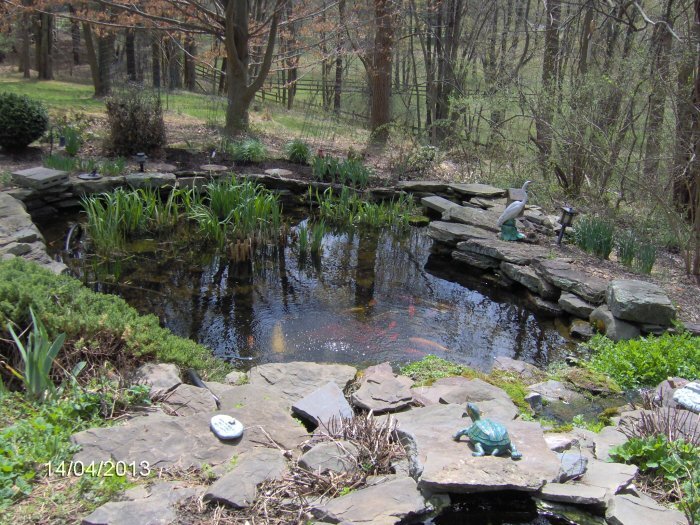 Pond facing south. 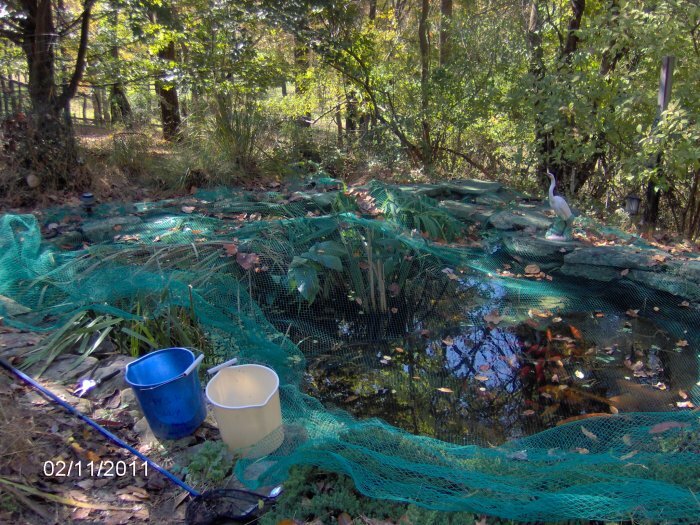 This shows the marginal area and some fish. 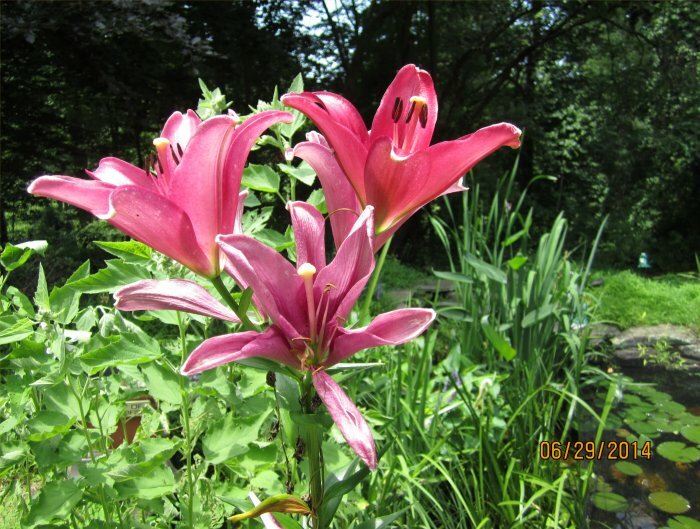 I do not know why the photo is washed out. 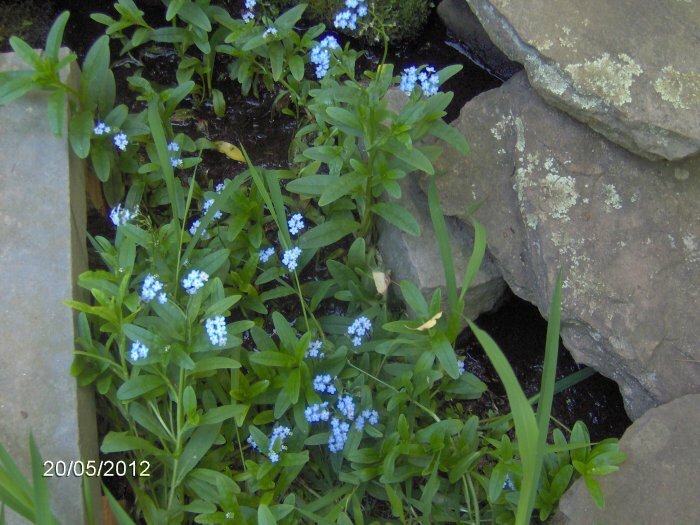 Flowering forget-me-nots in the 1800 gallon overflow on 5/26/11. 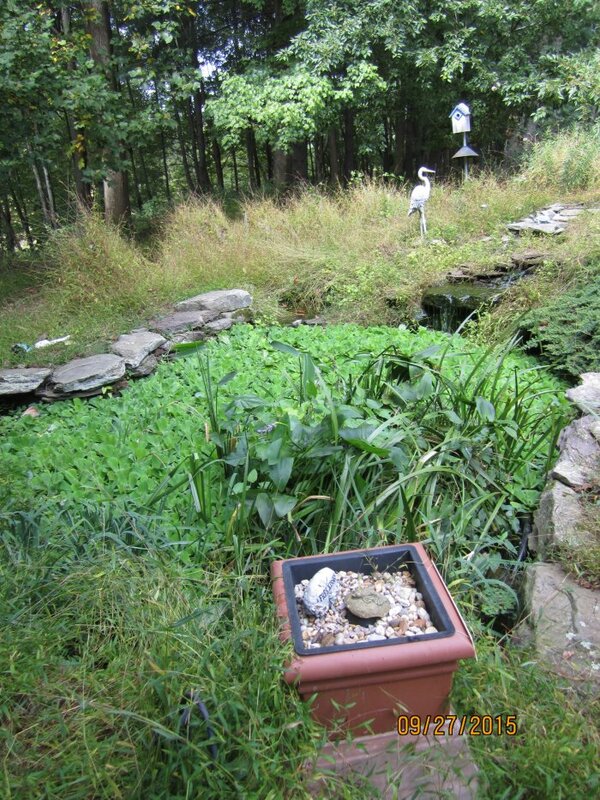 Sick pond - the 1800 gallon pond on 5/21/11 when it was being treated with MelaFix (hence the foaming), facing southwest, water celery at the top right of the photo. 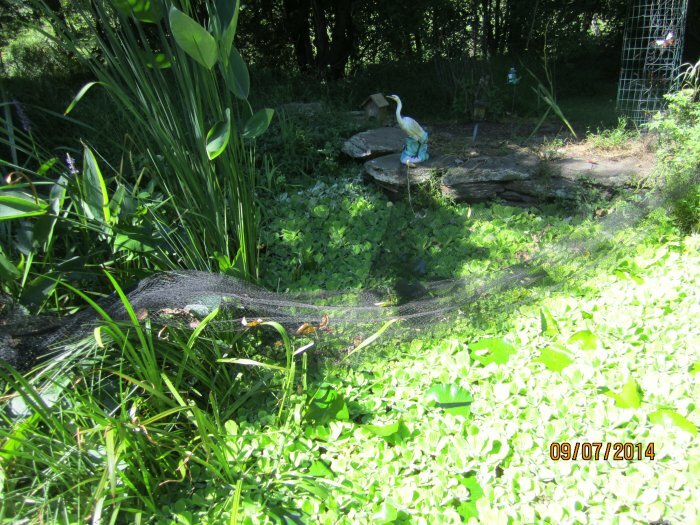 These two photos taken on 5/21/11 are of the new walkway that my brother and I put in alongside the east side of the pond. 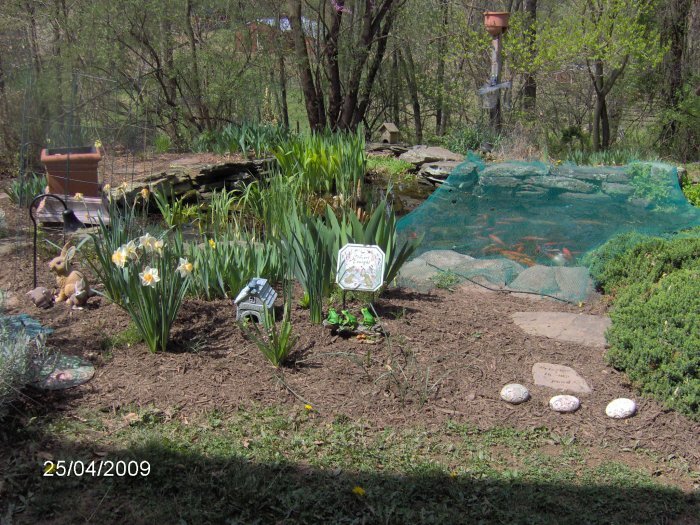 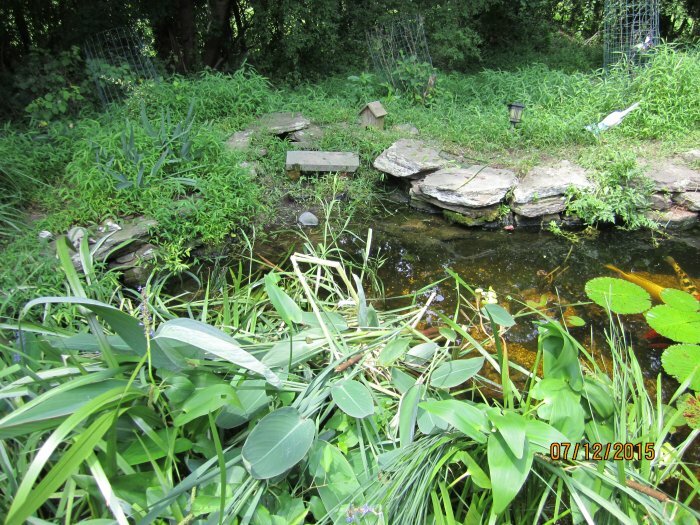 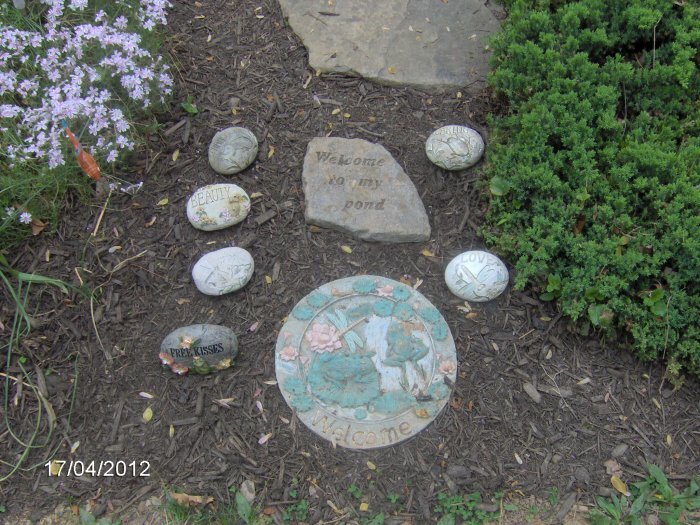 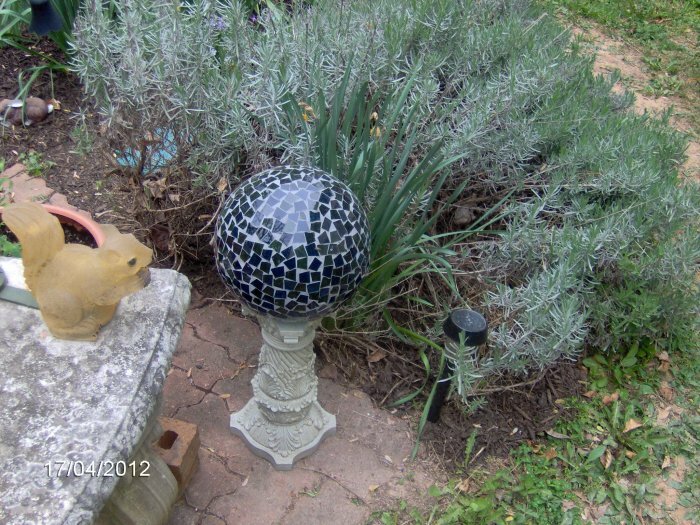 These photos from 5/5/11 show the redone main pond overflow that my brother helped me do. 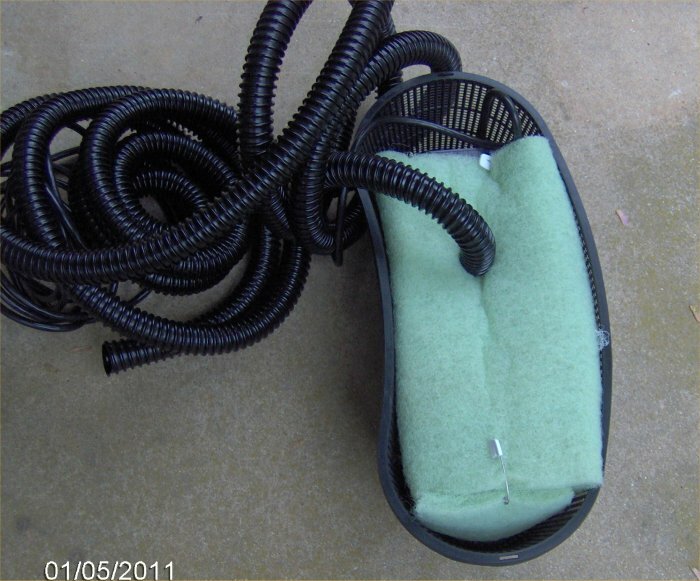 New pump with basket and filter material (floss), diaper pins hold on the end piece. 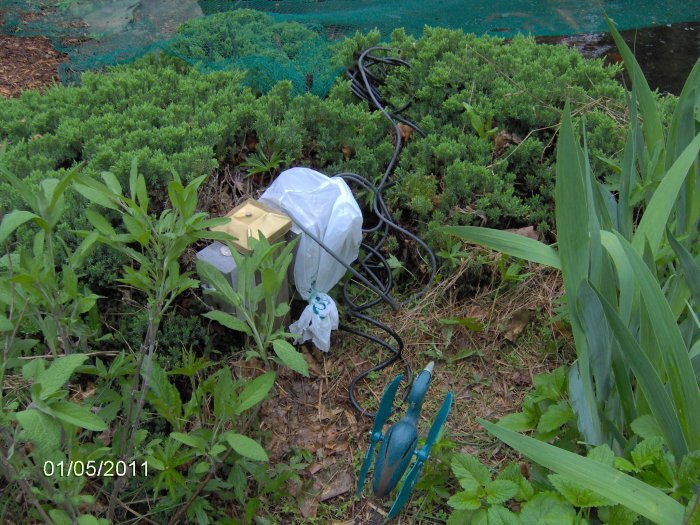 Electrical outlet with a plastic bag on it since it will not close. 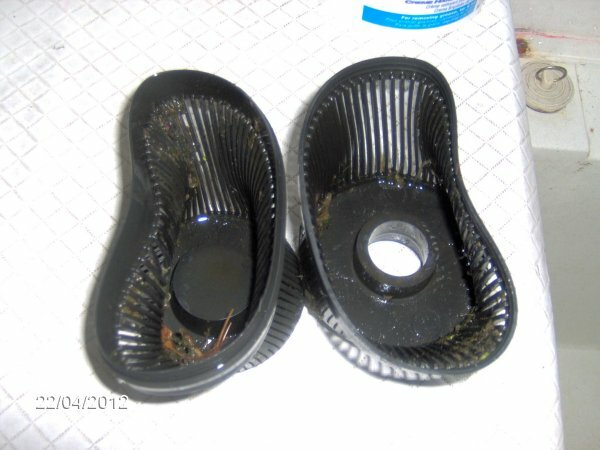 Nobody will fix it for me. 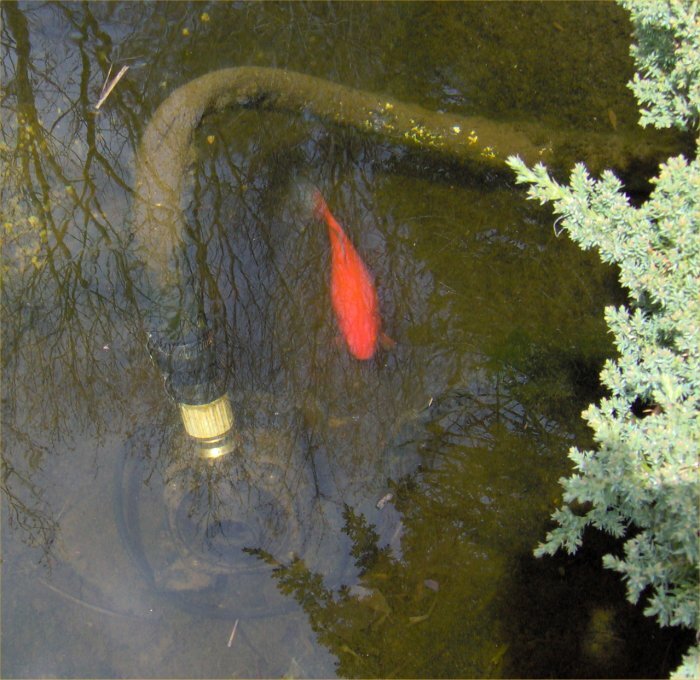 New pump situated in to the pond. 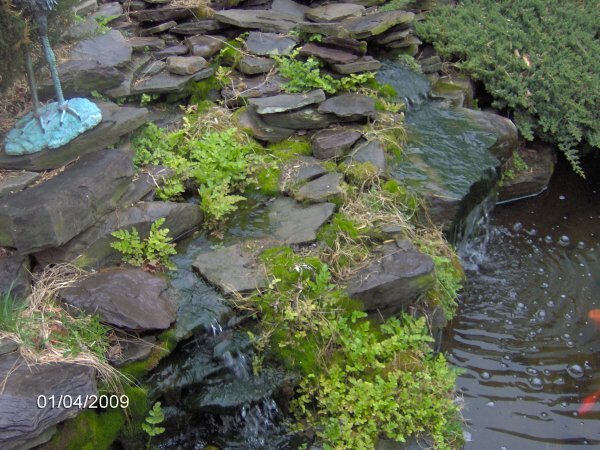 Waterfall facing northwest with the added flow. 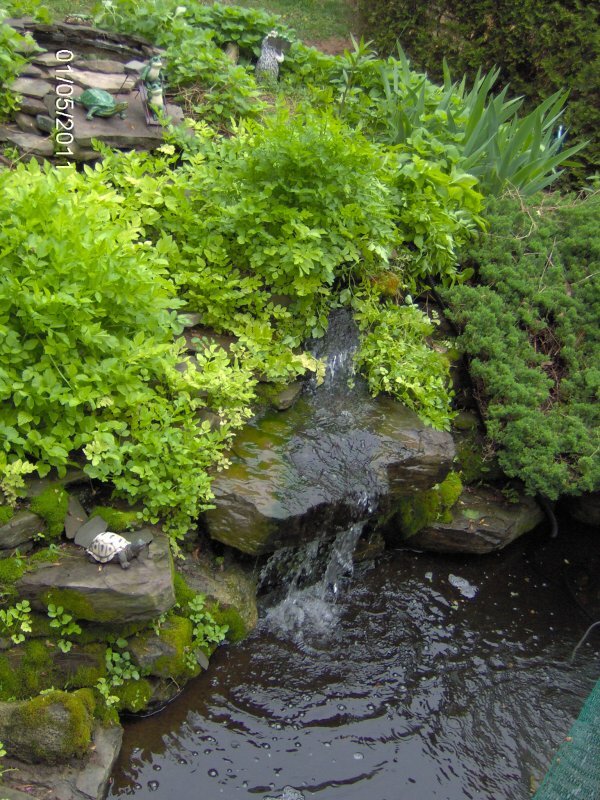 Waterfall facing northeast with the added flow. 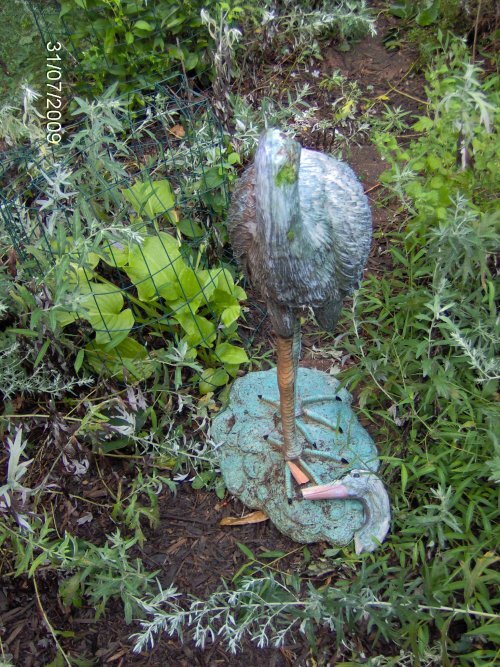 Previous to the new pump, the water drizzled. 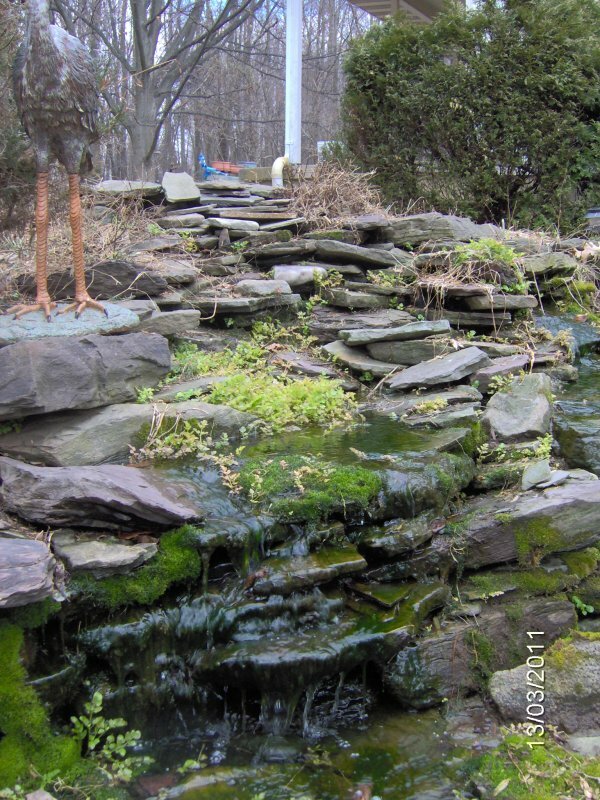 New waterfall rock looking down the falls. 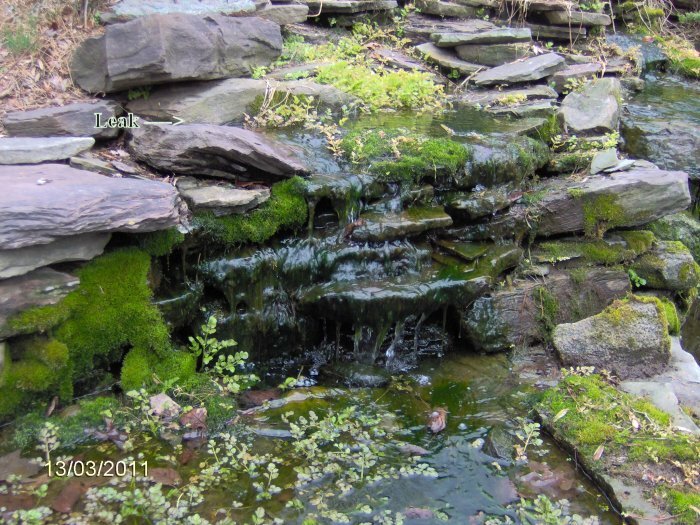 New waterfall rock looking up the falls. 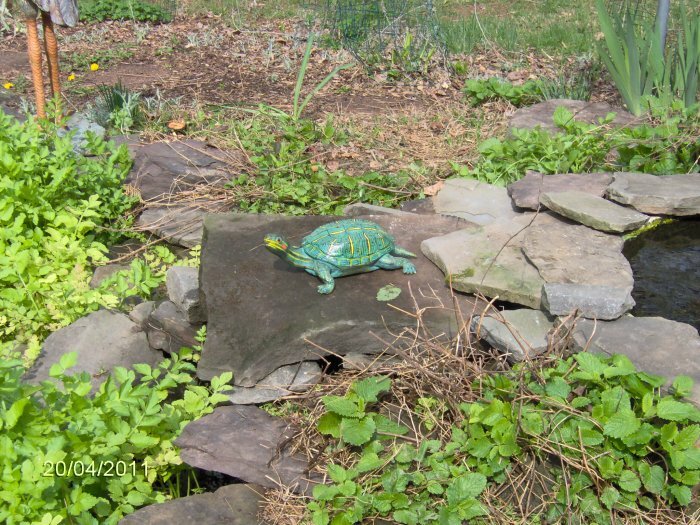 New waterfall rock from the side with a fake turtle on it. 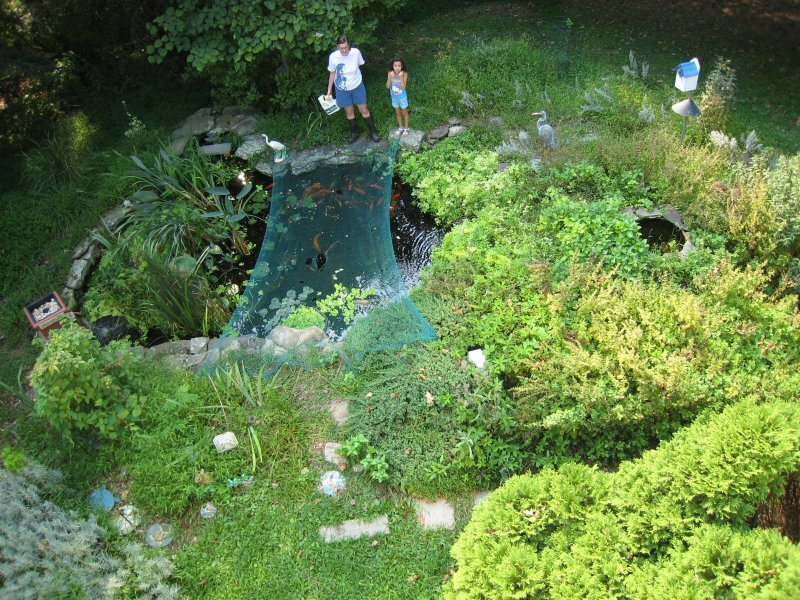 Waterfall viewed from above with the rocks removed. 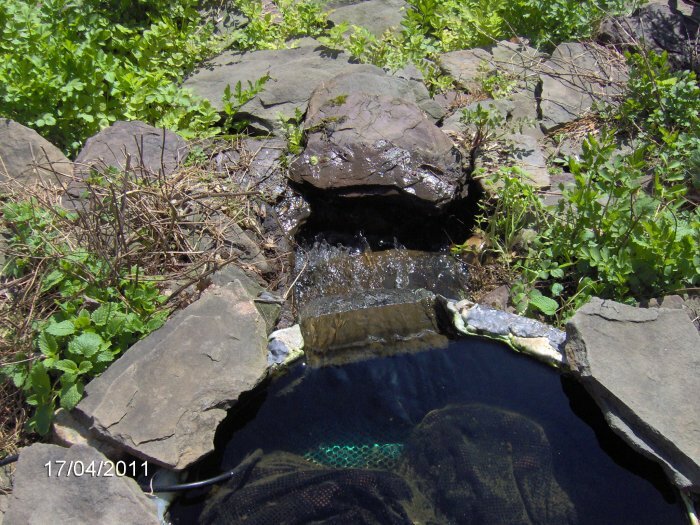 Waterfall - outflow of the biofilter viewed from the side with the rocks removed. 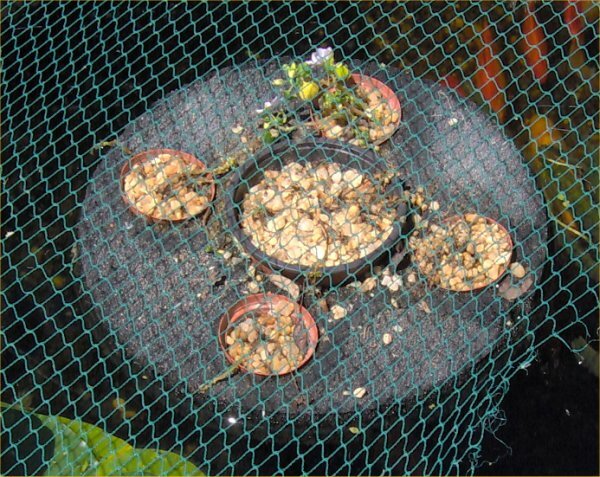 Notice the large foot drop from the biofilter down to the liner. 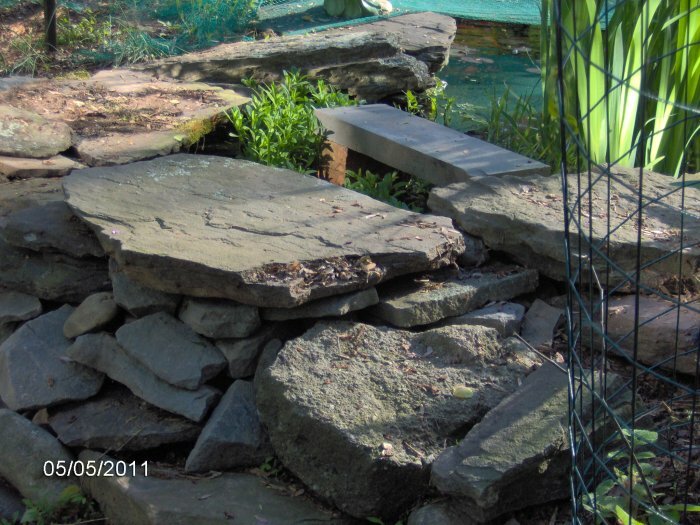 That is all collapsed hill. 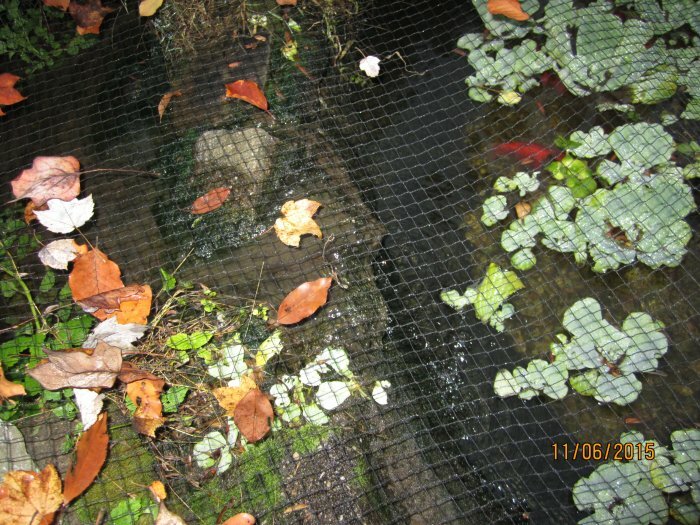 The water coming out of the biofilter used to touch the liner in 1997. 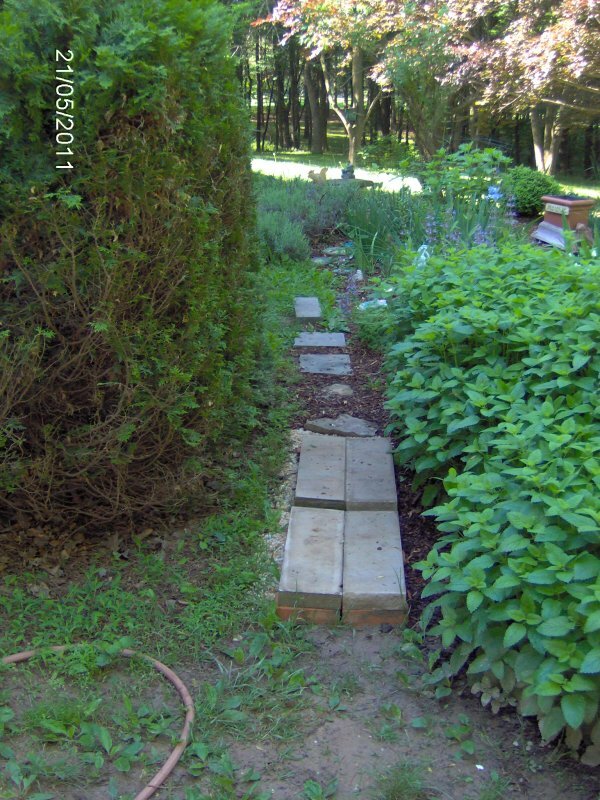 No Cedar - the same photo after I cut down the poor cedar. 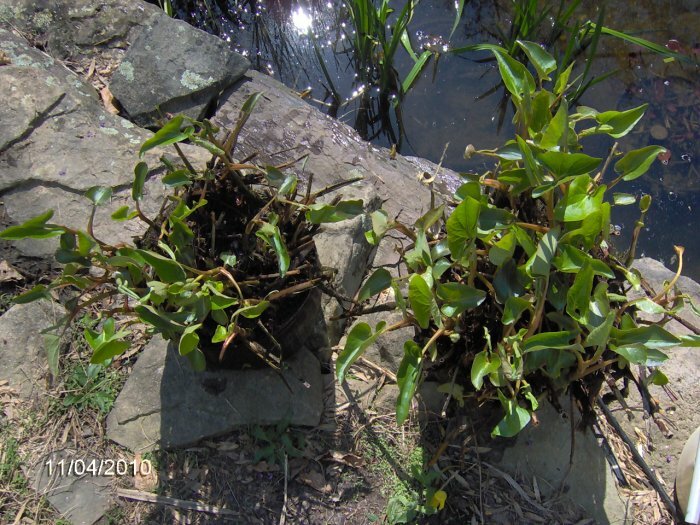 It was half dead, and people were worried about the roots damaging the liner. 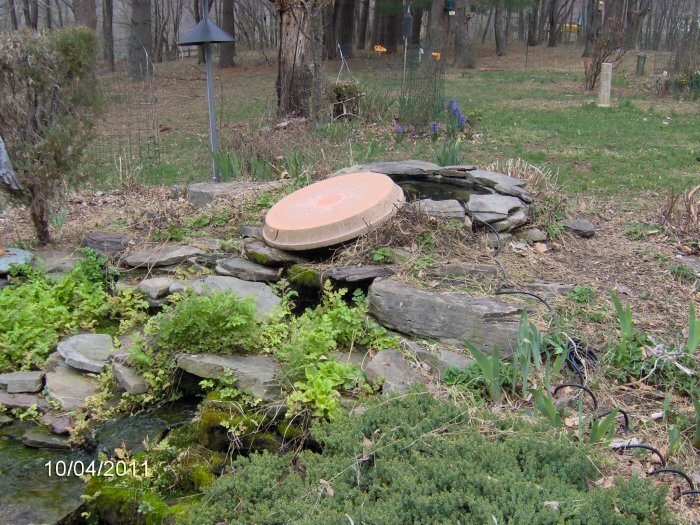 Waterfall on 4/10/11 showing how I put the busted plastic bird bath (really a plant drip tray) over the hole in the falls. 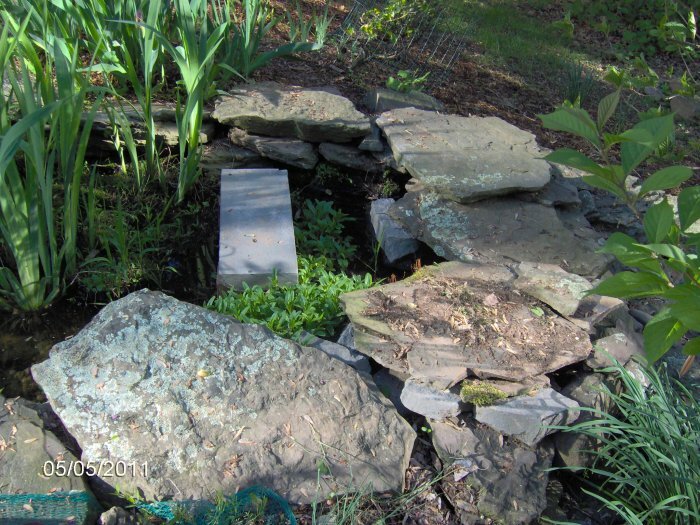 I had removed some rocks to rearrange them and could not get them back! 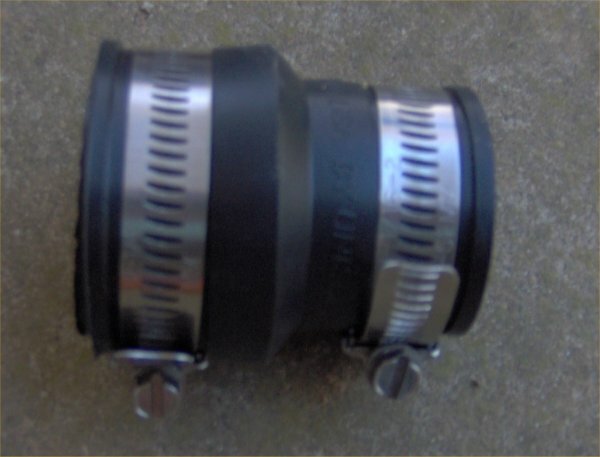 Drain Trap Connector - the gasket thing that finally stopped my pump from popping off the line! 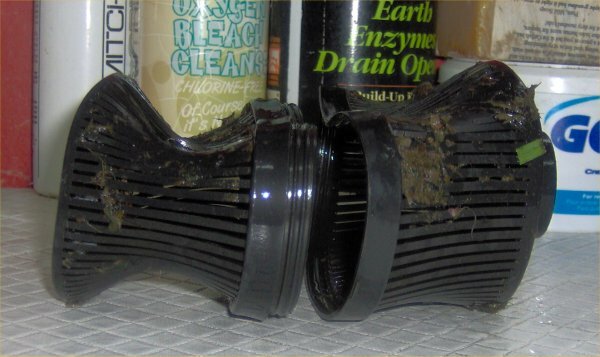 Pump connected to the tube with the new connector with the intake grate off as well as the pre-filter off. 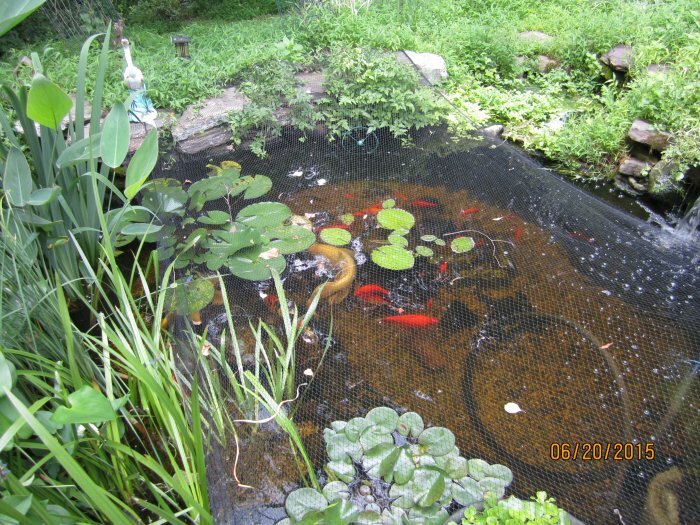 There is a single goldfish in the photo too. 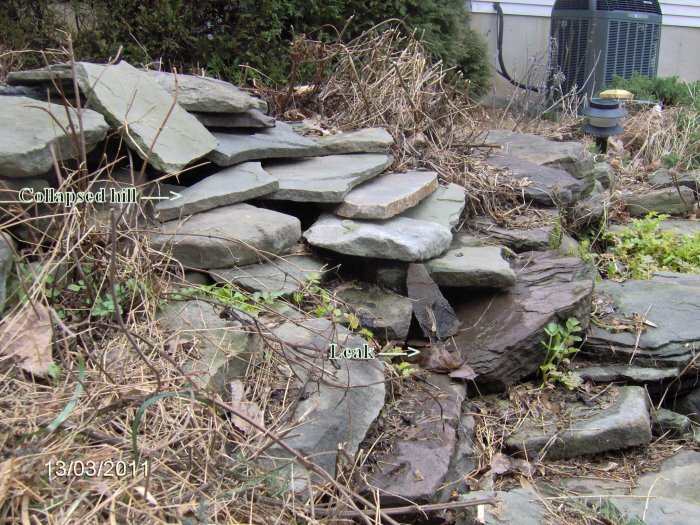 Biofilter - this shows the biofilter and how the cap stones are all loose, and the caulking is all worn off. 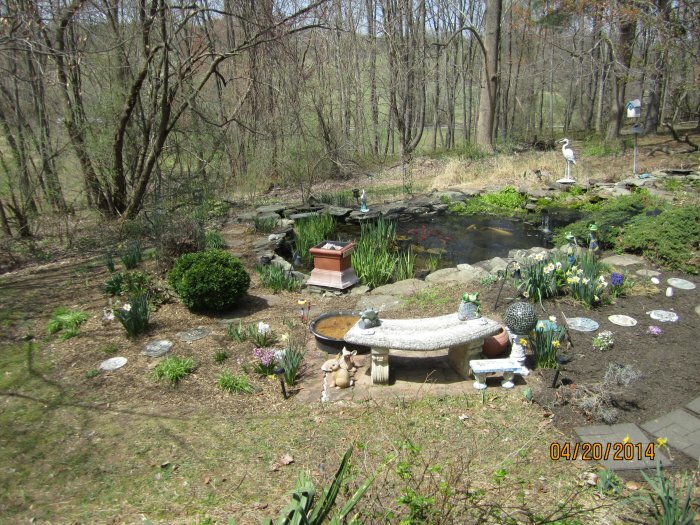 Waterfall - facing east. 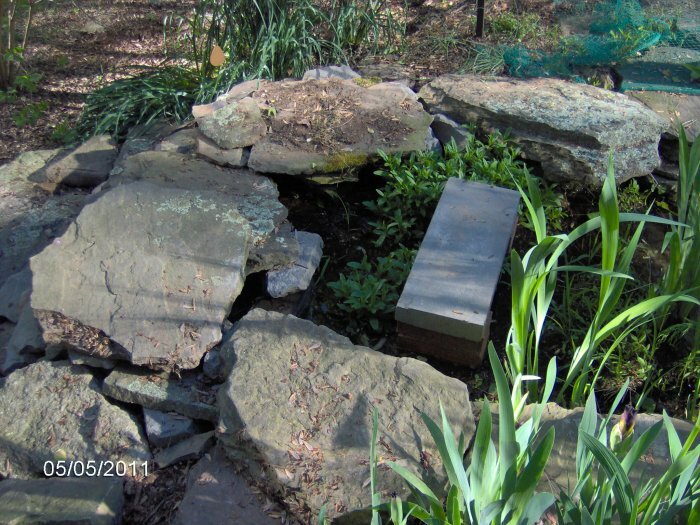 This is the top of the falls and shows how the rocks are all out of place, the hill has collapsed, and water is leaking. 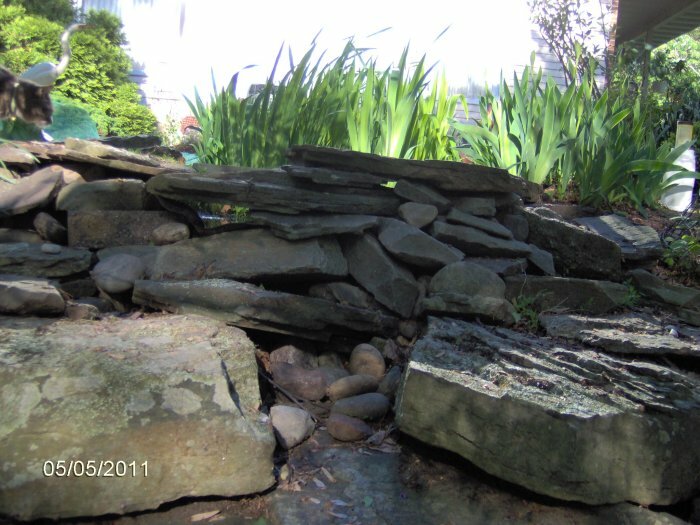 Waterfall - entire falls, facing northeast. 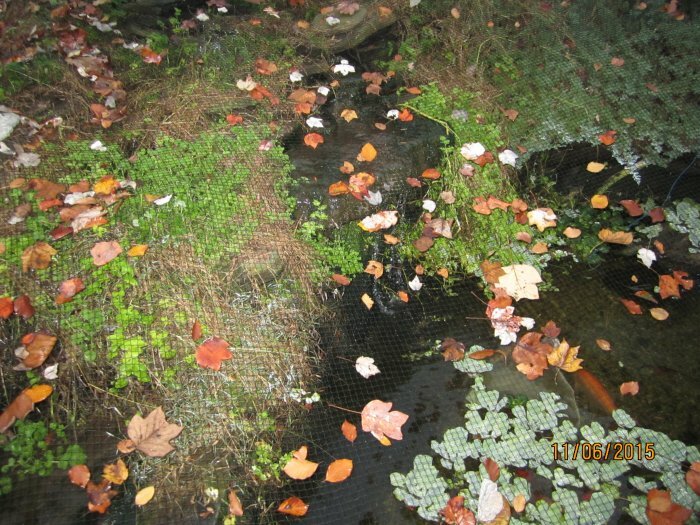 Waterfall - base of the falls that go in to the swampy area. 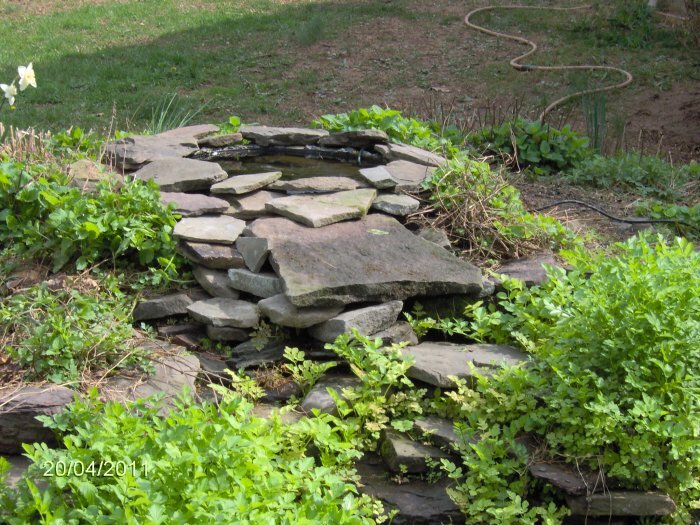 An area indicates one location where water goes outside of the lined area. 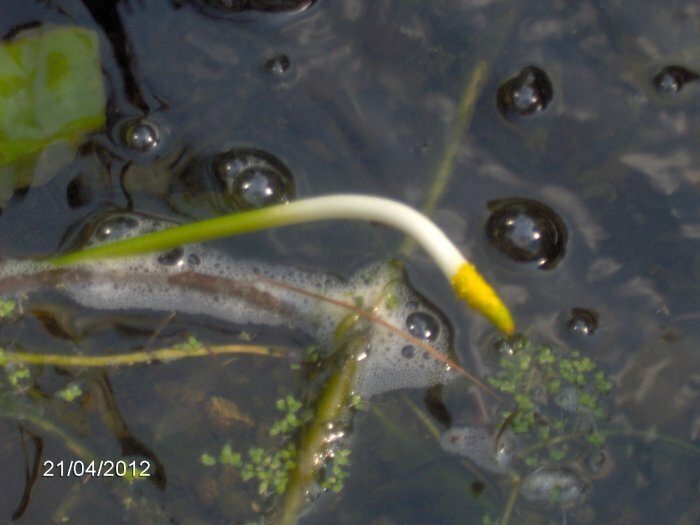 The water celery was just starting to sprout. 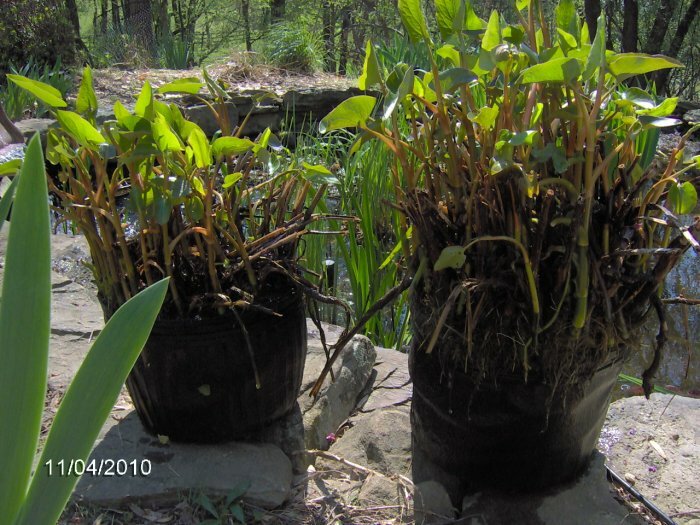 Pink tropical pickerel rush out of the pond to be brought in on 10/21/10. 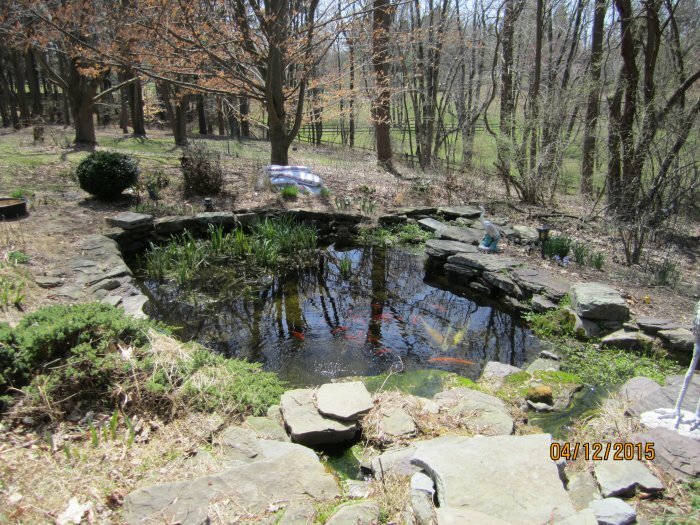 1800 gallon pond facing southwest. 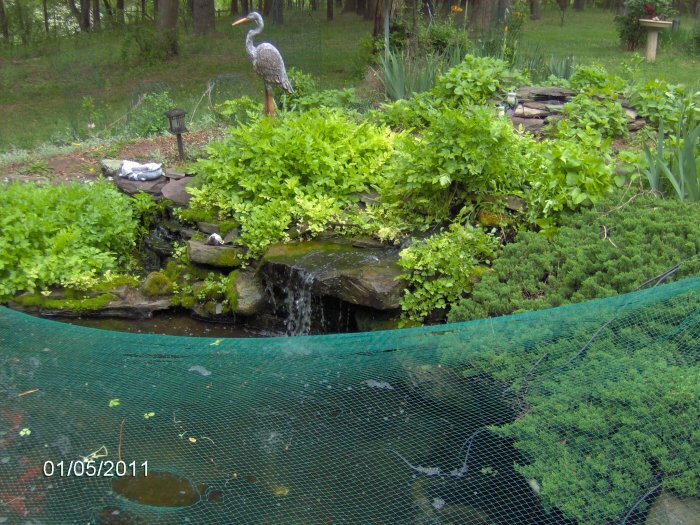 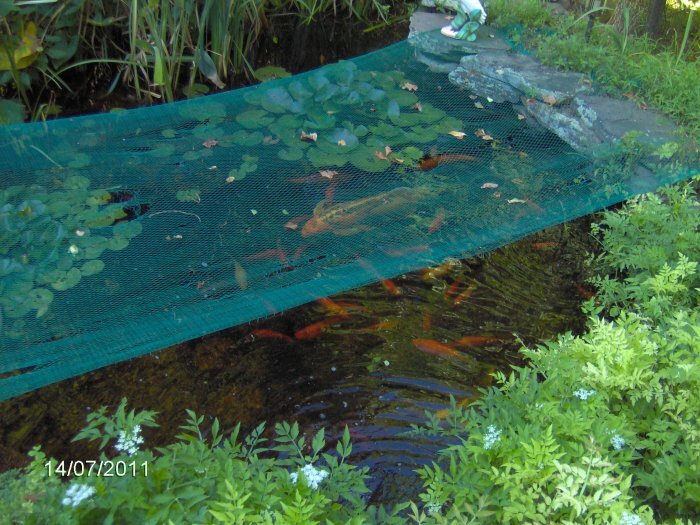 1800 gallon pond netted with the full leaf net, facing southwest. 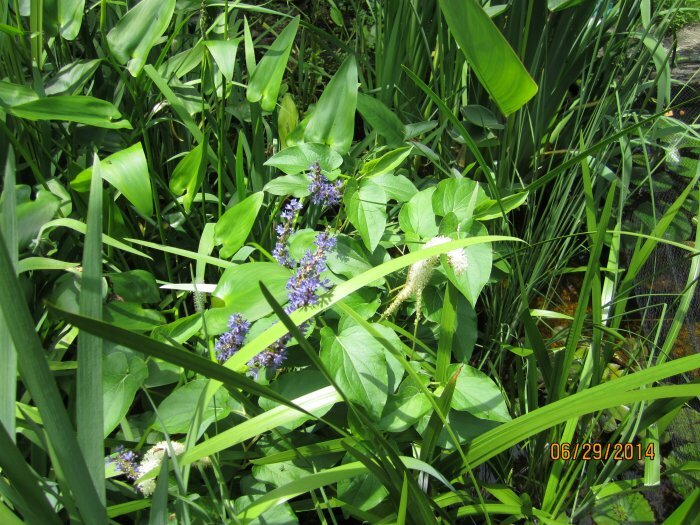 Here are some photos taken 9/3/10 of the flowering bluebells and purple pickerel rush. 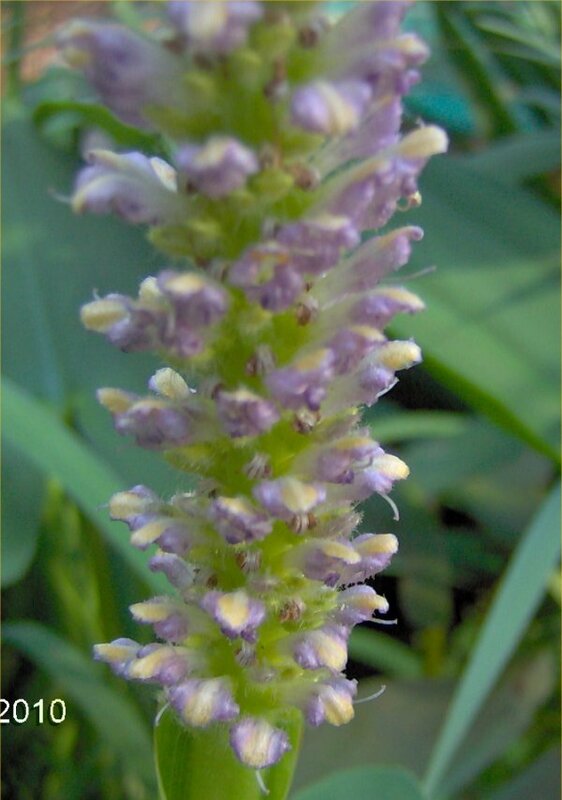 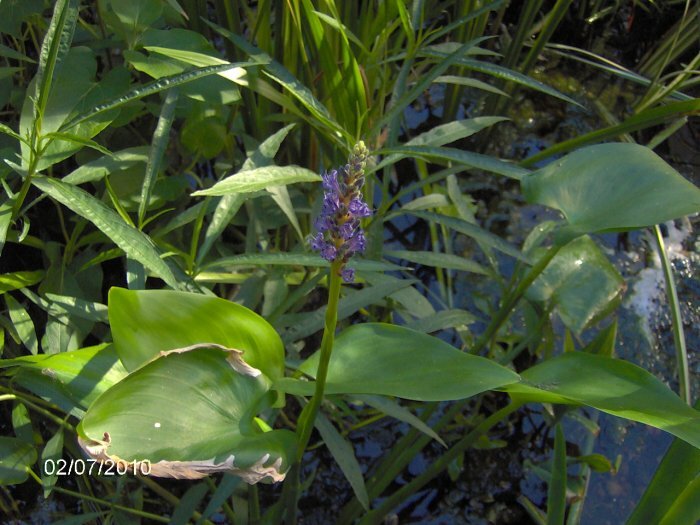 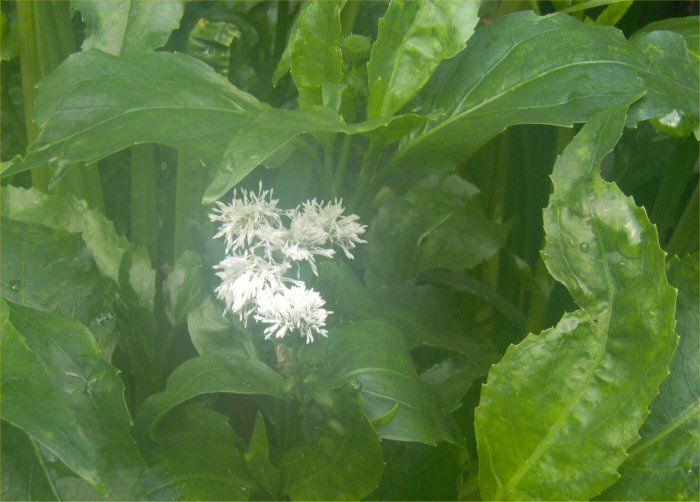 Pink pickerel weed flower on 8/16/10. 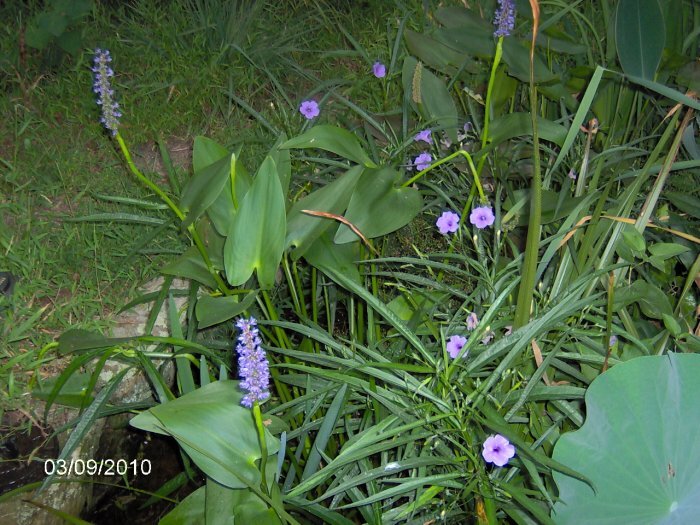 This spire on my first tropical pickerel weed was on its second day of blooming so it was not as open as on the first day. 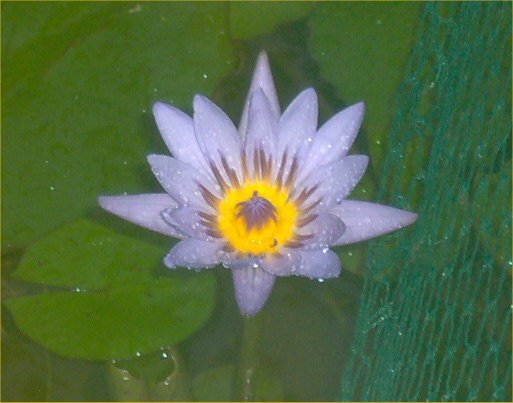 Tropical waterlily flower (Blue Beauty) on 8/15/10. 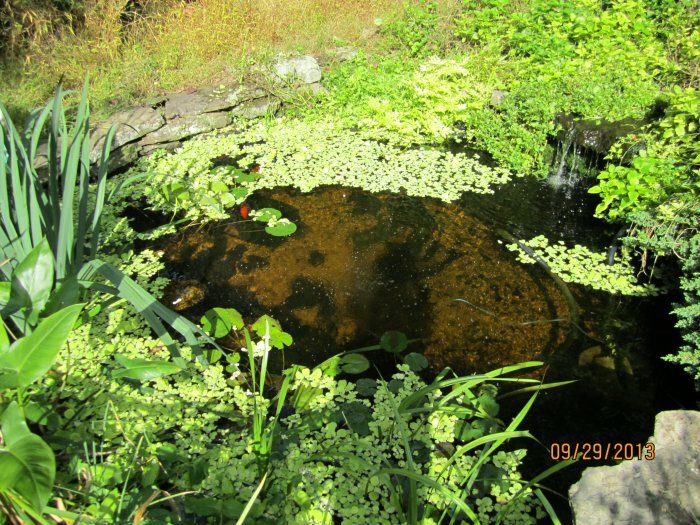 Big pond marginal area on 8/11/10. 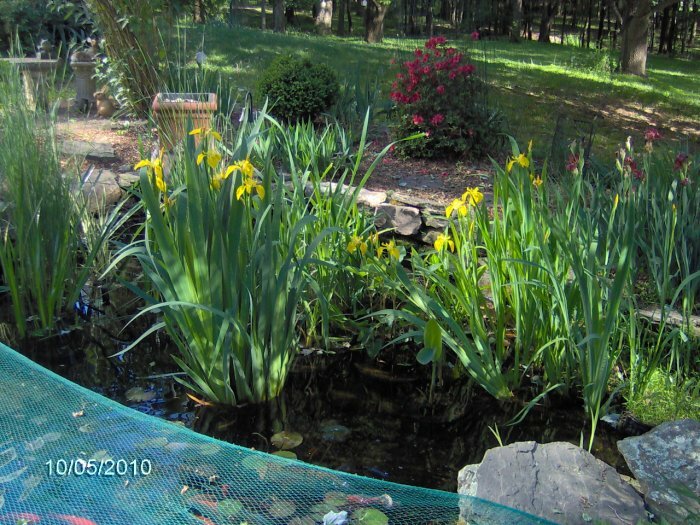 You can see the Cyprio filter, the net over the deep end, and the marginal area which includes huge lotus, cattails, hardy canna, and yellow flag iris. 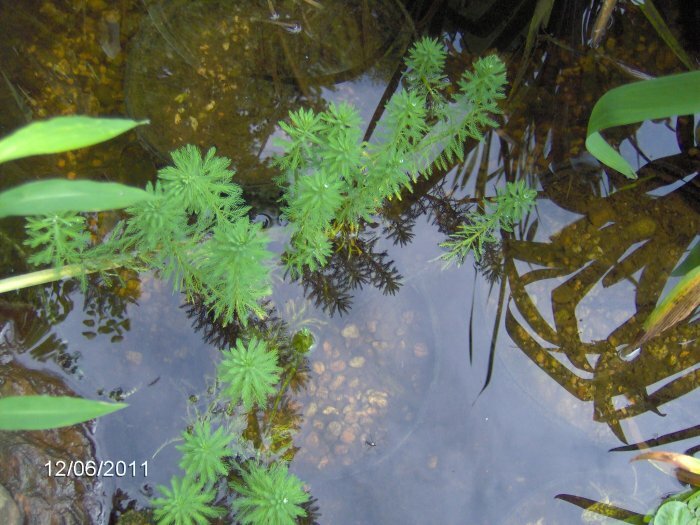 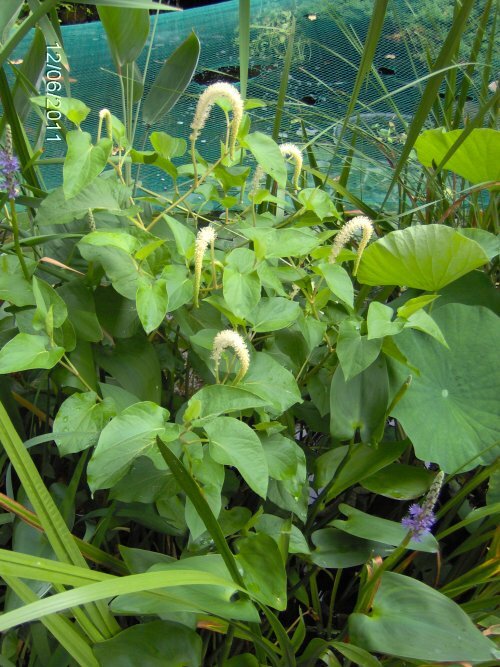 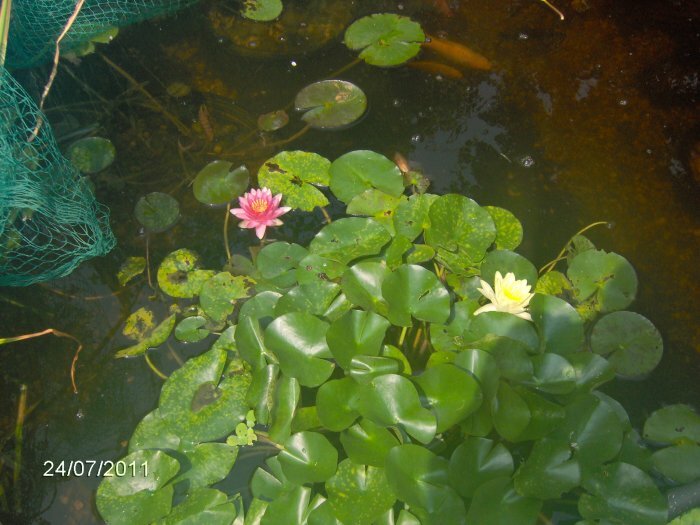 Some plants in the pond on 7/11/10. 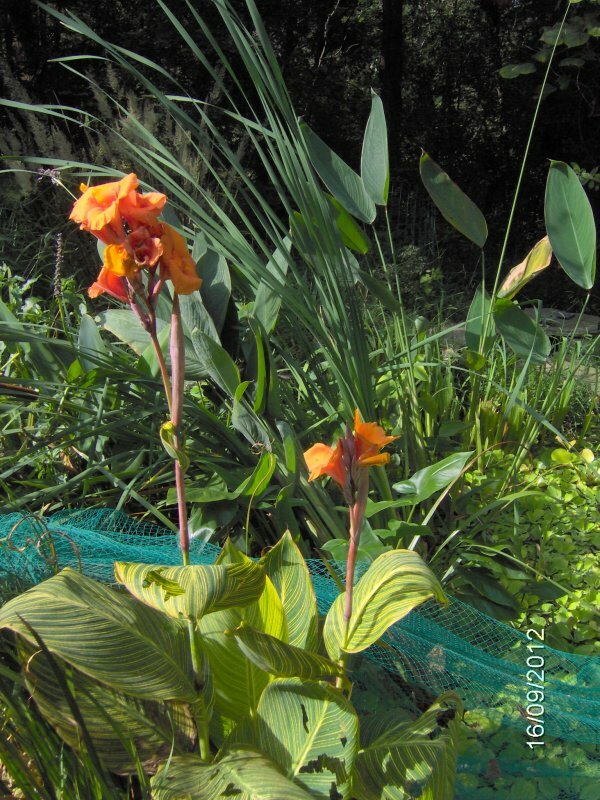 Hardy canna flowers already going to seed; bumblebee on them. 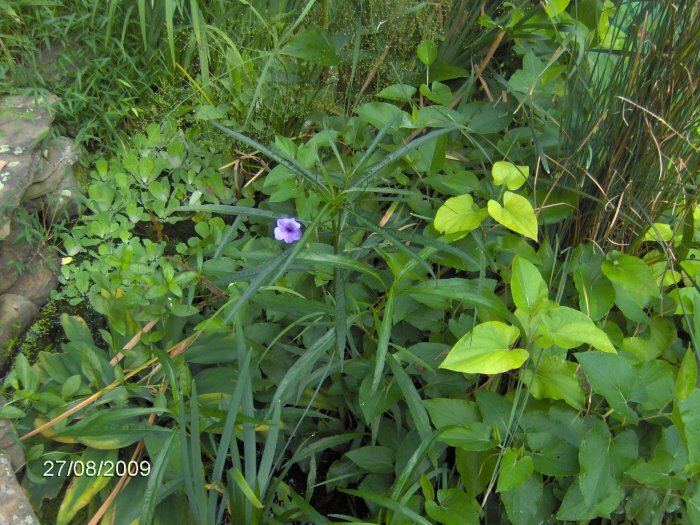 These photos were taken on 7/4/10. 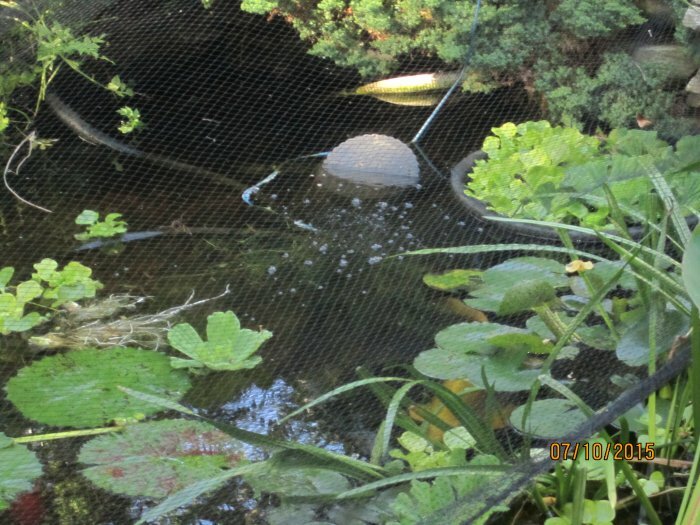 Floating impatiens island - only one barely alive! 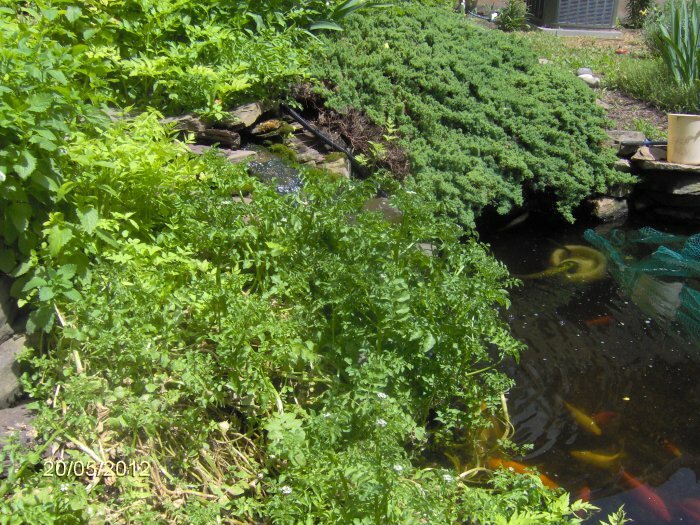 You can also see some goldfish down there. 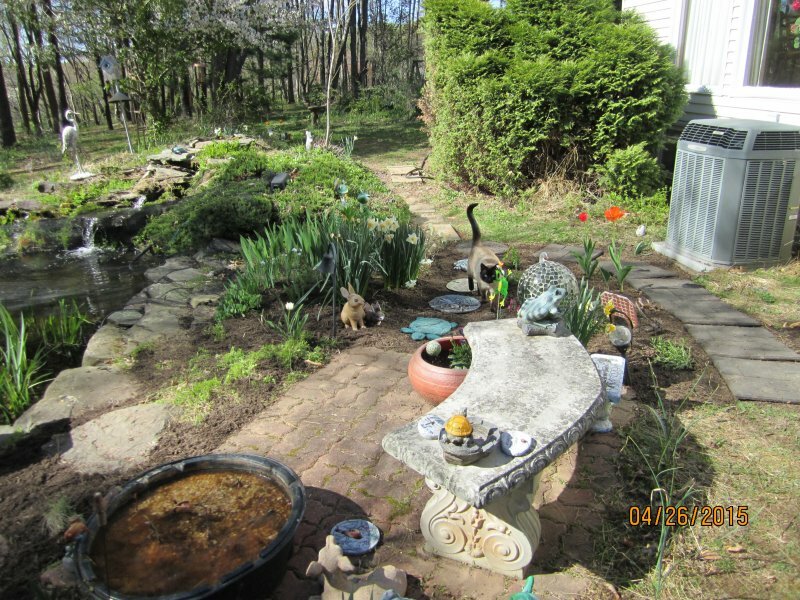 What a difference a year makes! 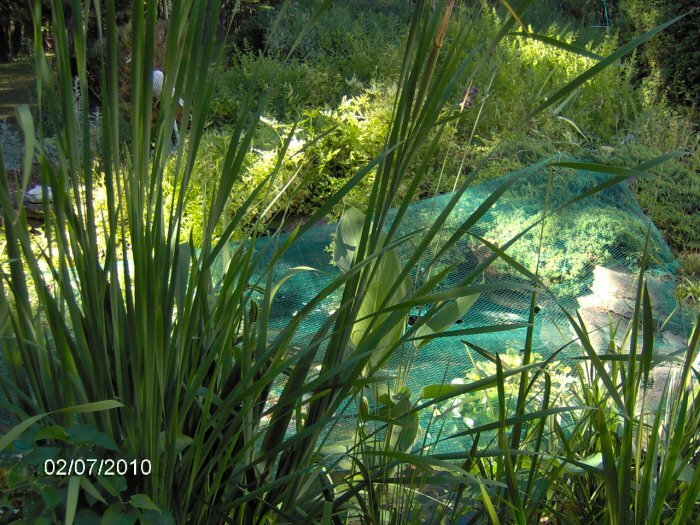 This is the same floating island on 7/12/10. 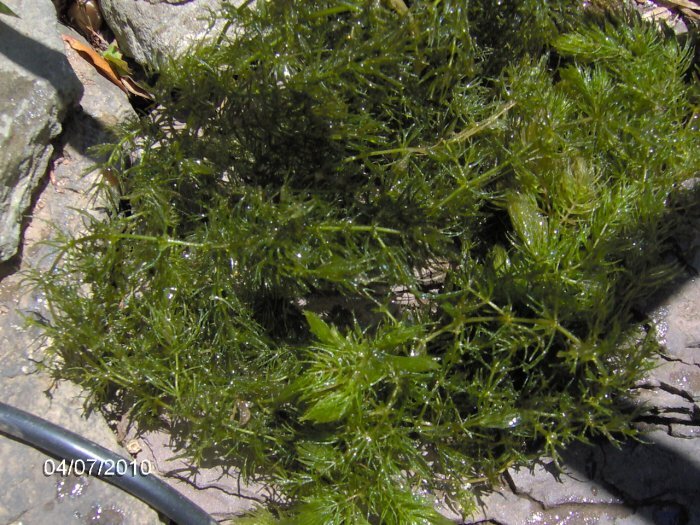 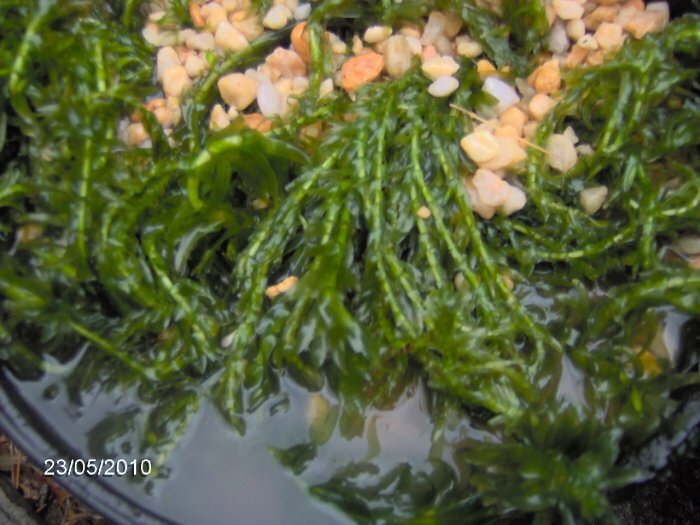 Hornwort - I took out a wad for a photo op on land (just for a second) since I have no good hornwort photos. 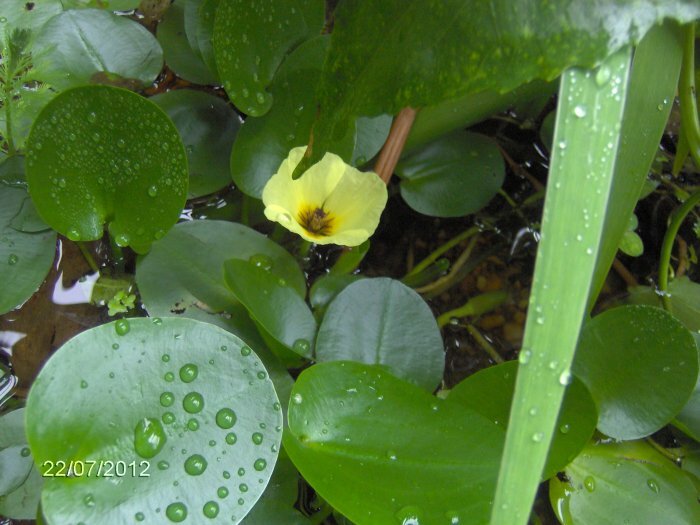 Chromatella yellow hardy waterlily flower close-up. 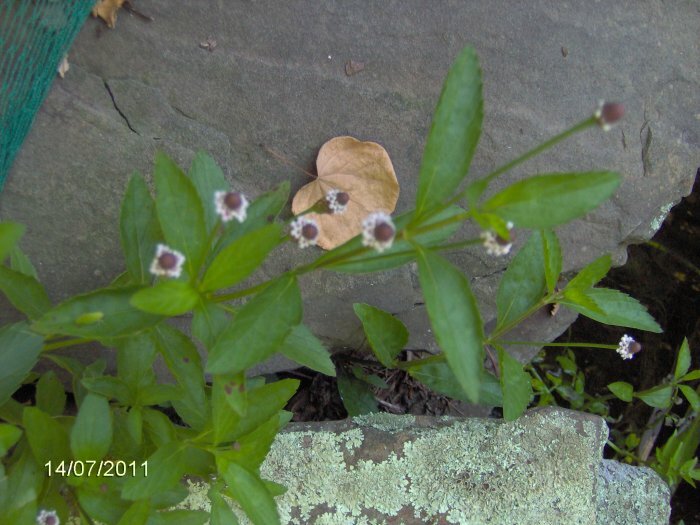 These photos were taken on 7/3/10. 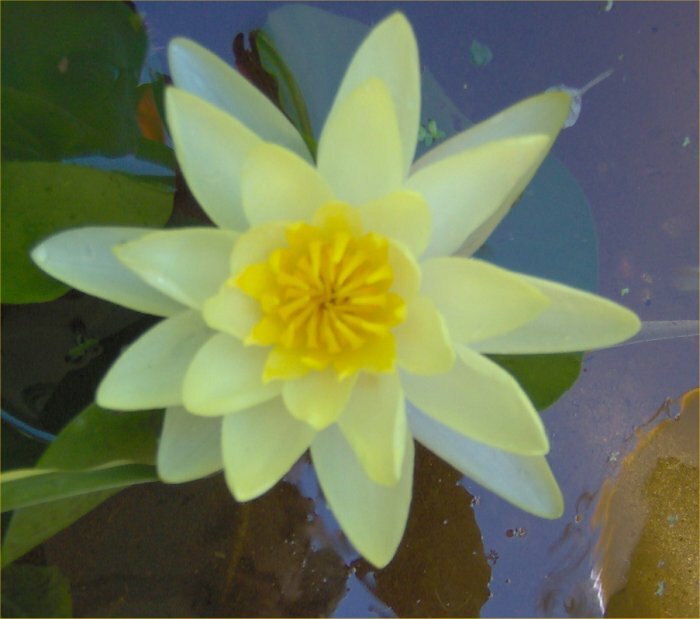 Chromatella yellow hardy waterlily flower. 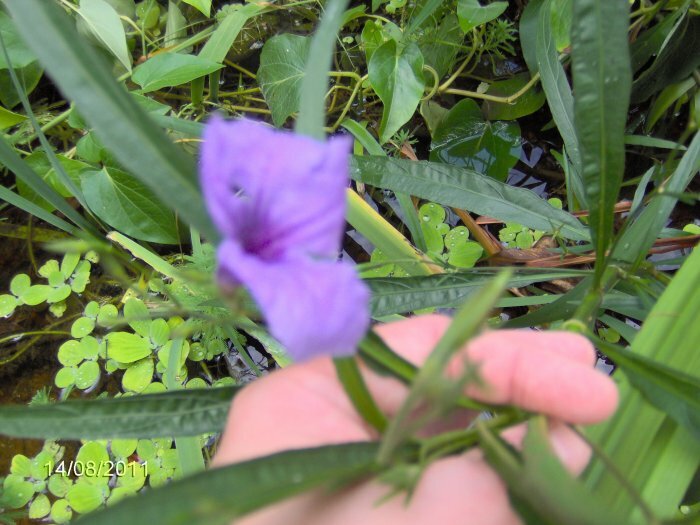 You can also see the dying water hyacinth on the right. 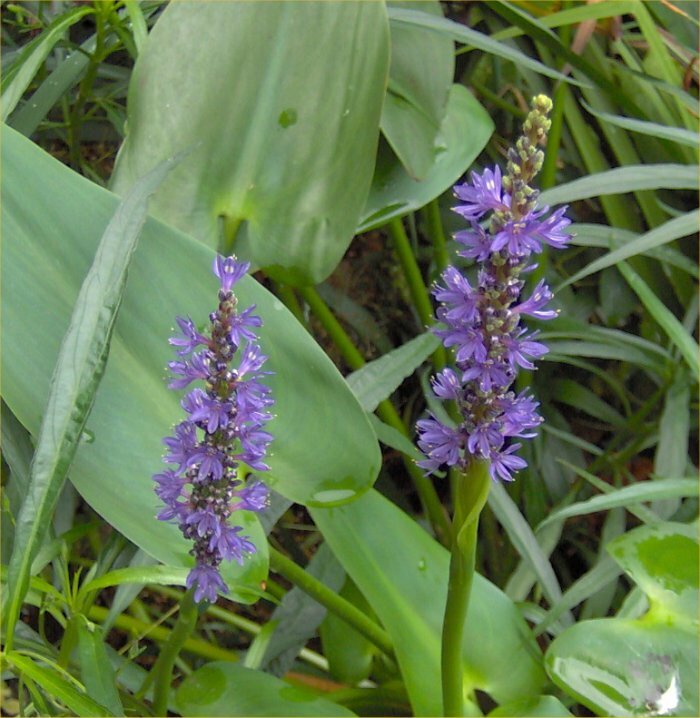 Purple pickerel rush in flower. 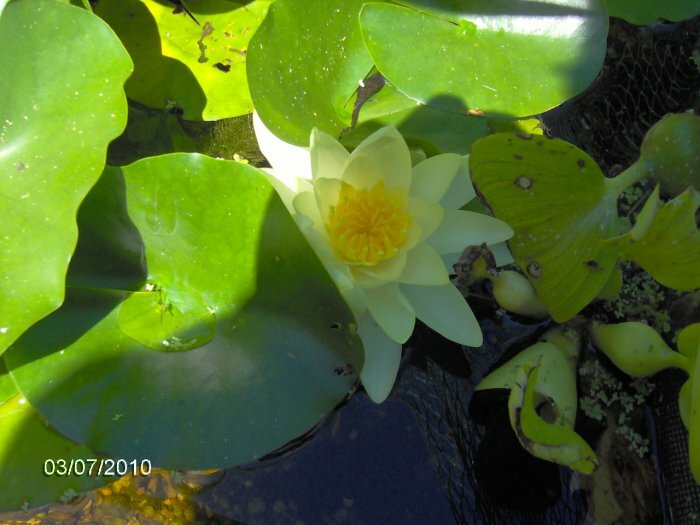 These photos were taken on 7/2/10. 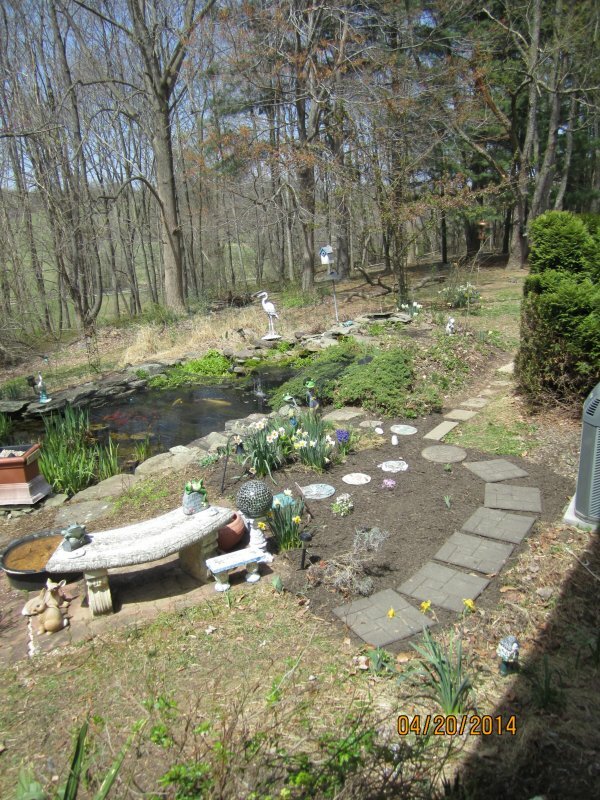 Big pond area garden - facing southwest. 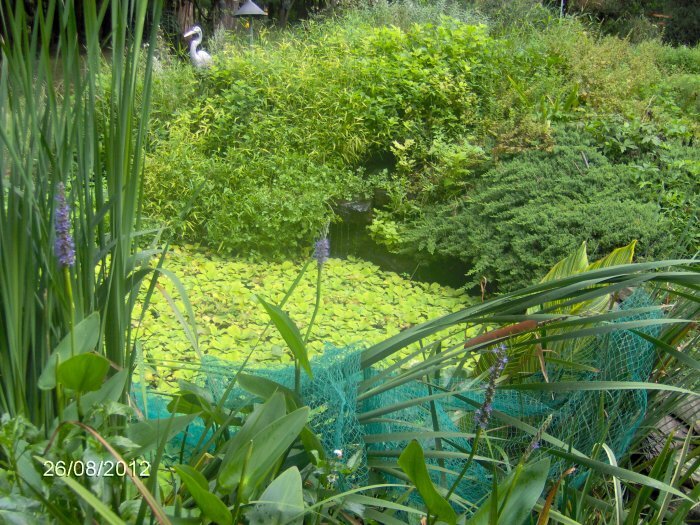 Yep, there is a pond down there but you cannot see it! 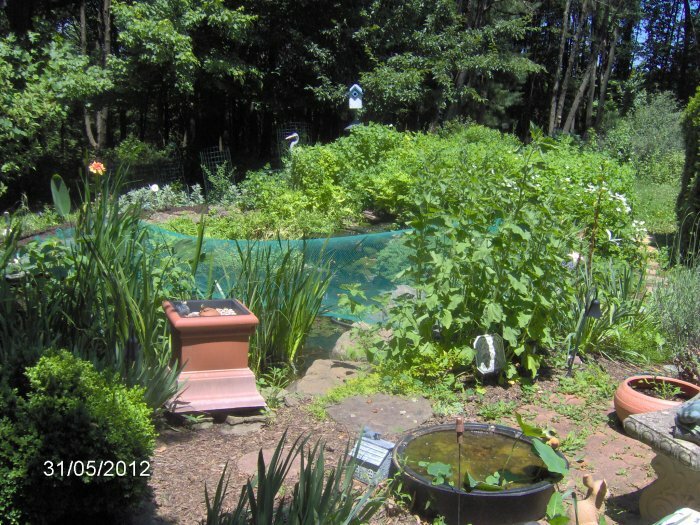 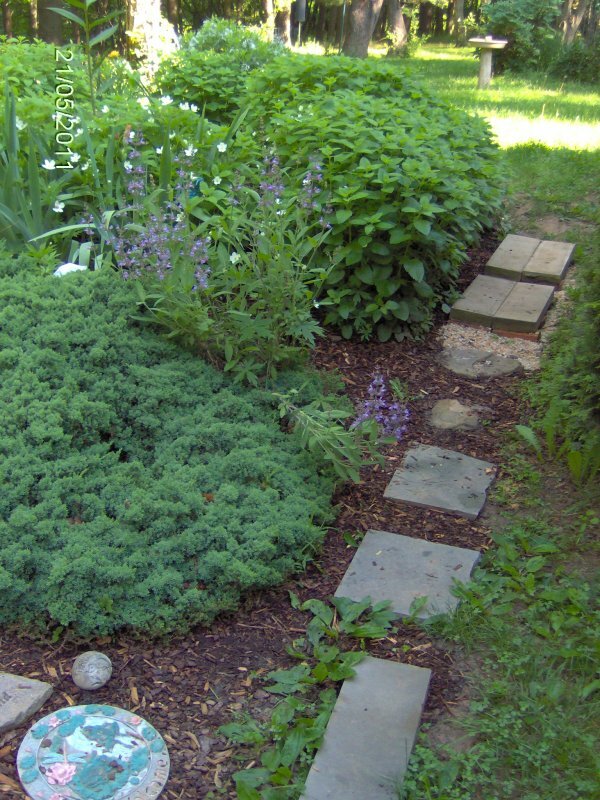 Lemon balm in the foreground obscures most of the scene. 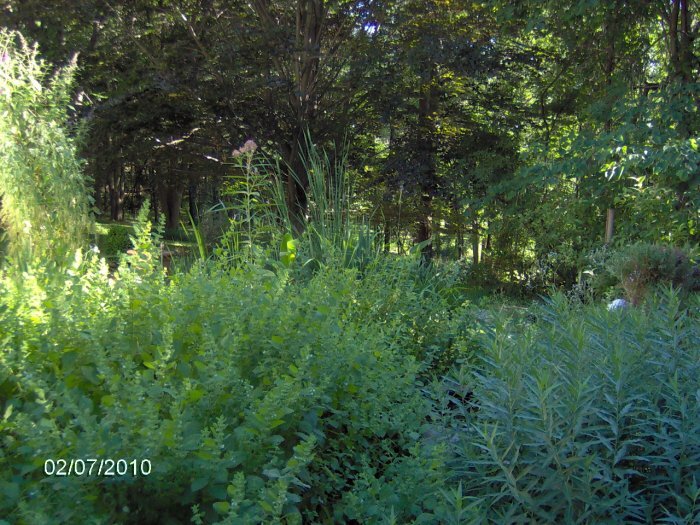 The tall plant at the top is milkweed. 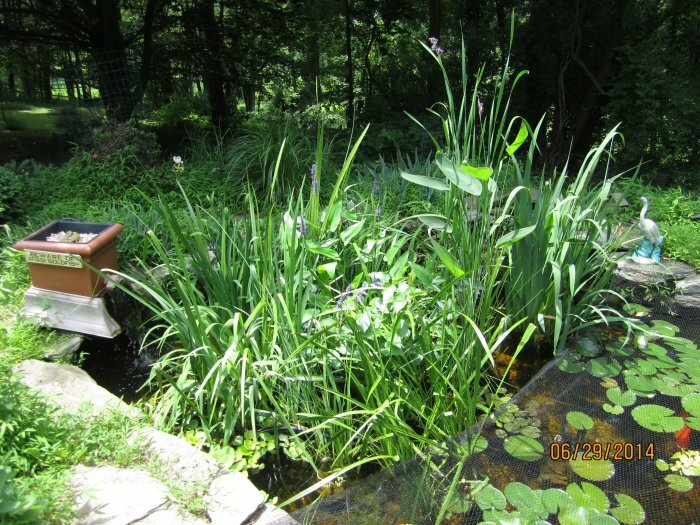 The common cattails in the pond are visible, and that is about it. 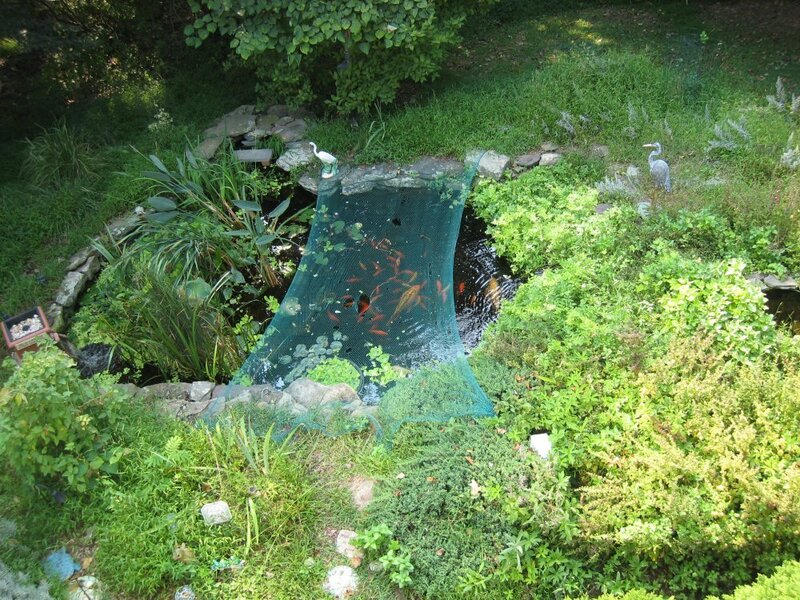 Big pond as seen from the top of the waterfall, facing soutwest. 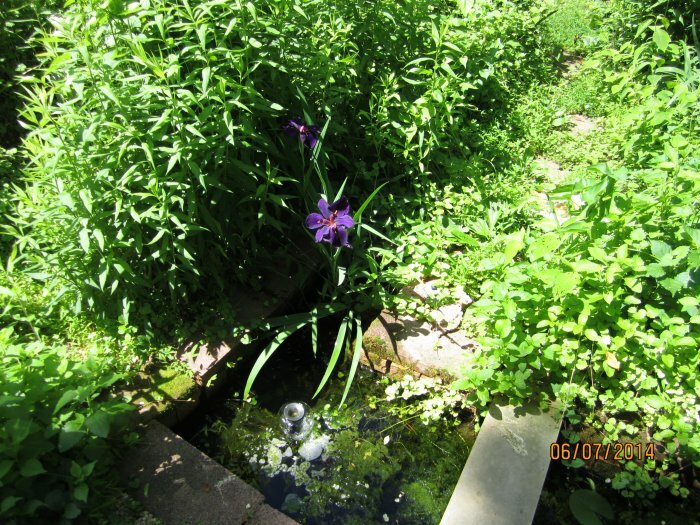 It is lush with plants. 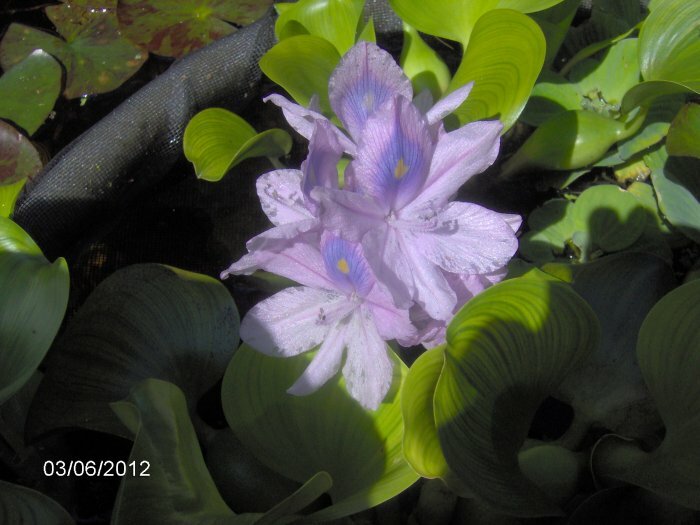 Purple pickerel rush in flower. 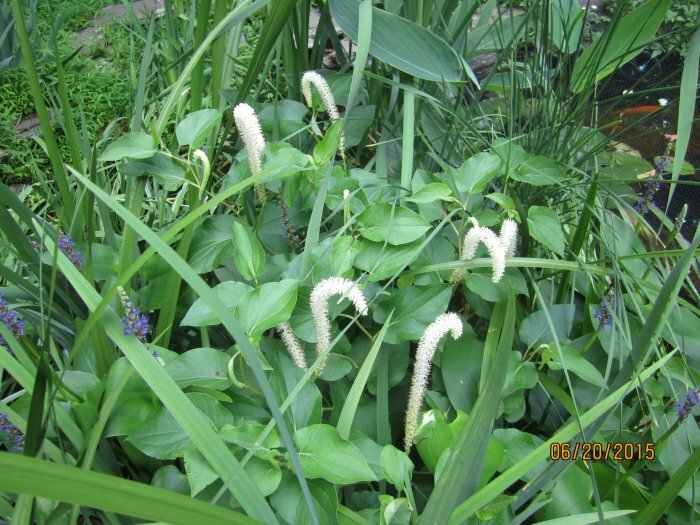 The "white rush" I ordered came with a label of "white pickerel rush" but I got neither! 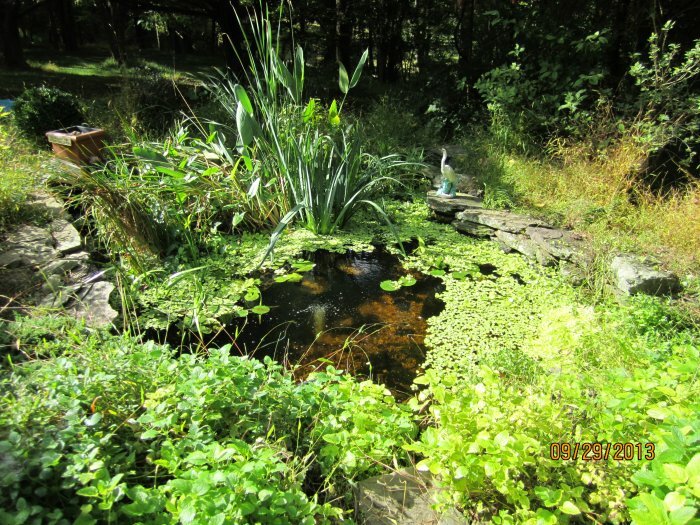 Big pond facing north through the marginals. 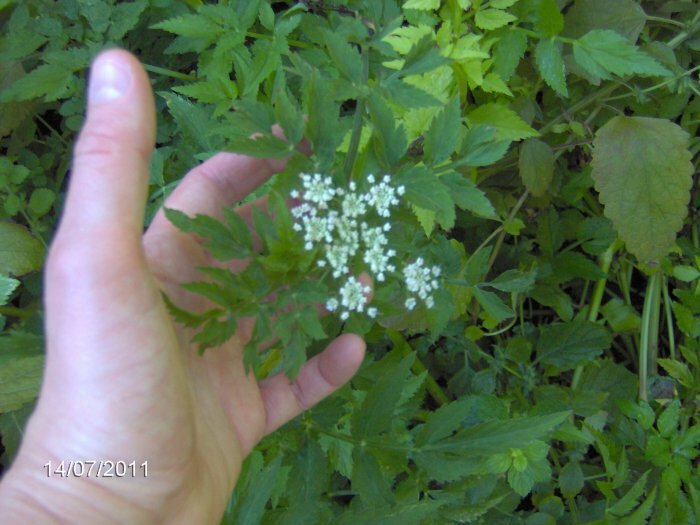 These photos are from 5/23/10. 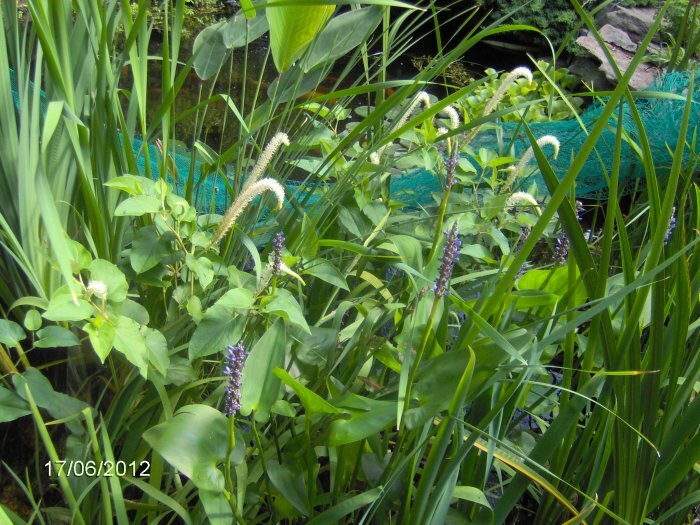 Anacharis and Jungle Valisneria potted up to go in the 1800 gallon pond. 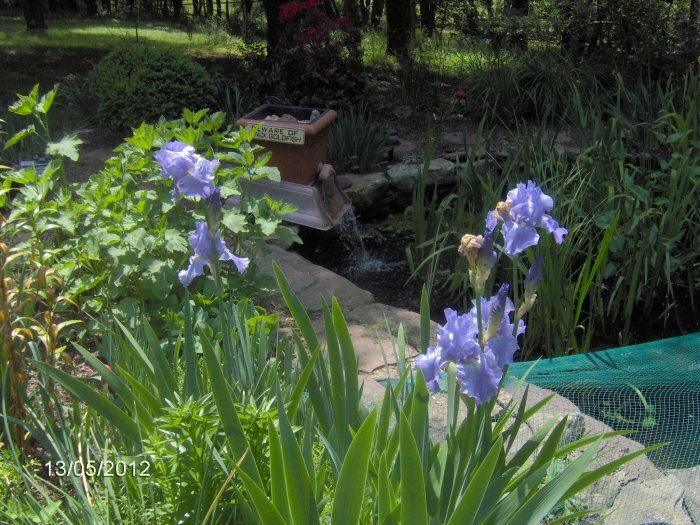 Water wisteria that I would put in the pond four days later. 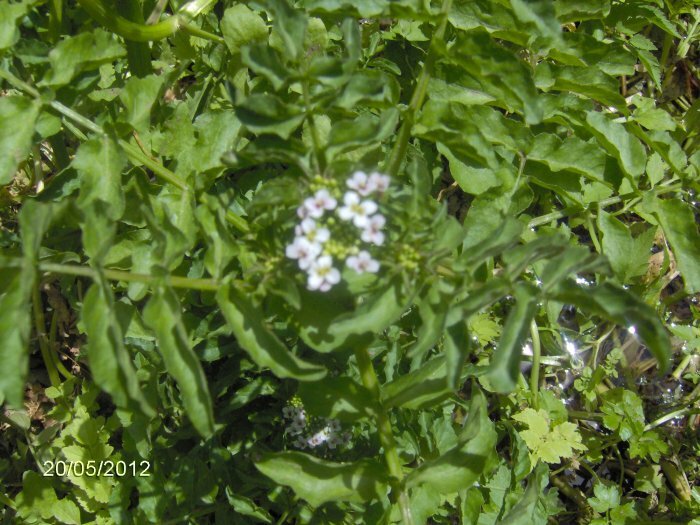 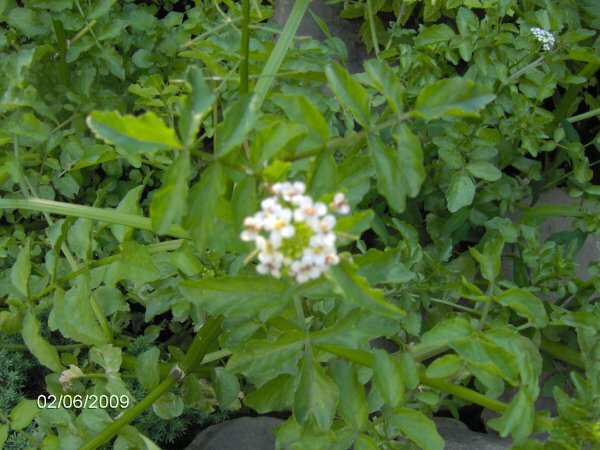 White watercress in flower. 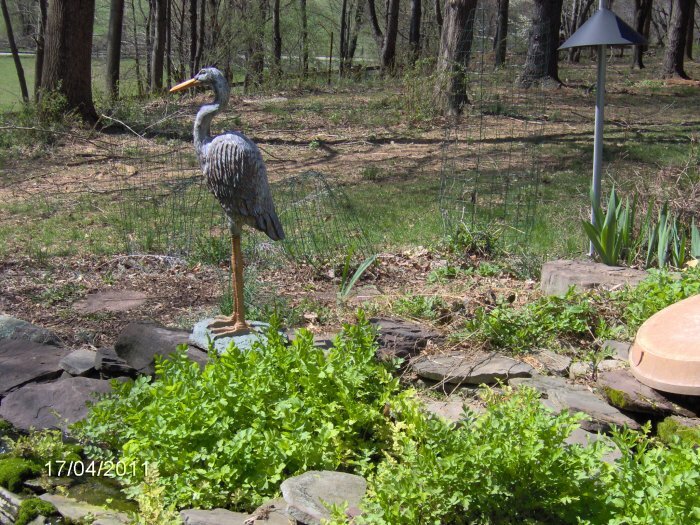 Water celery is in the background. 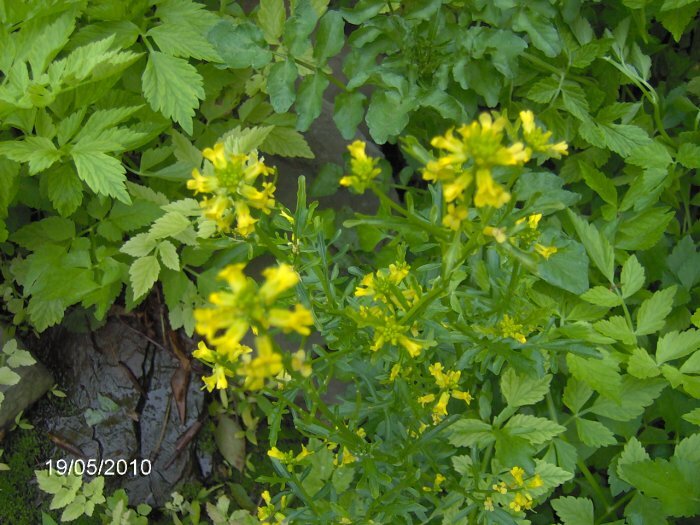 Yellow watercress in flower. 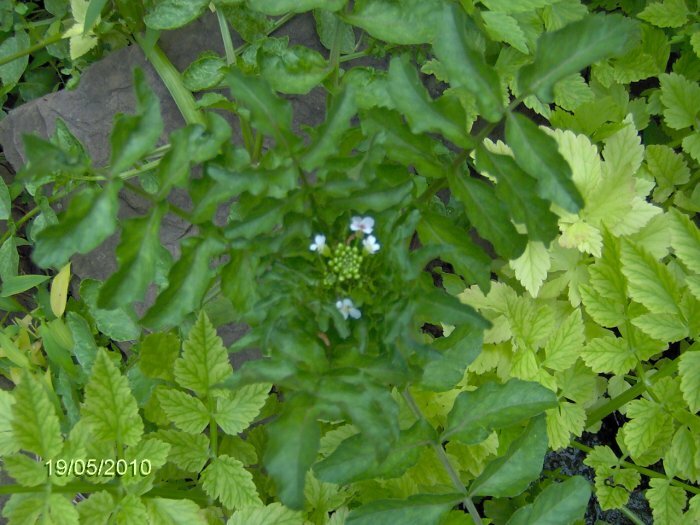 Water celery is in the background. 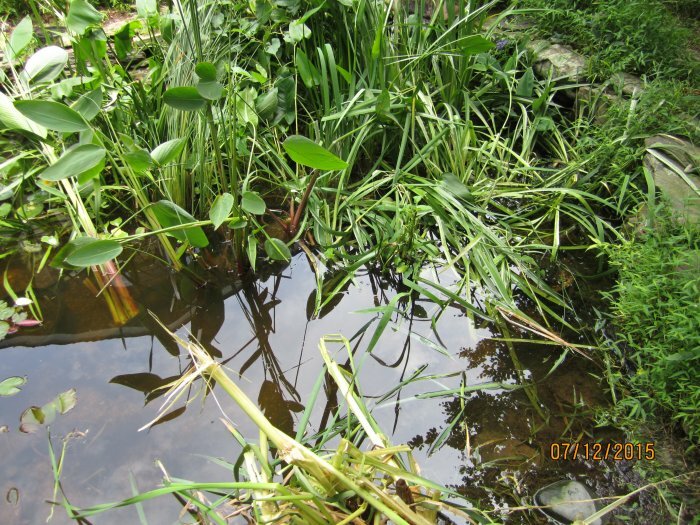 Big pond on 5/10/10, shallow area, facing south. 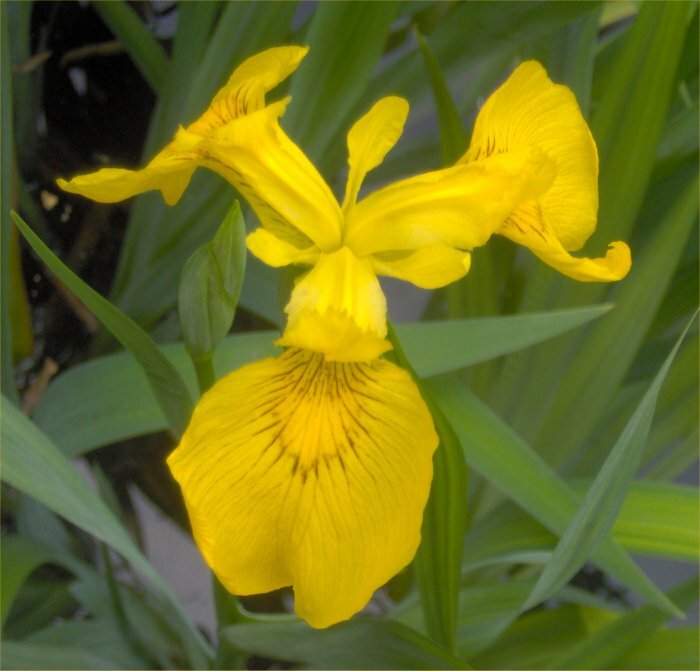 The yellow flag iris were in bloom. 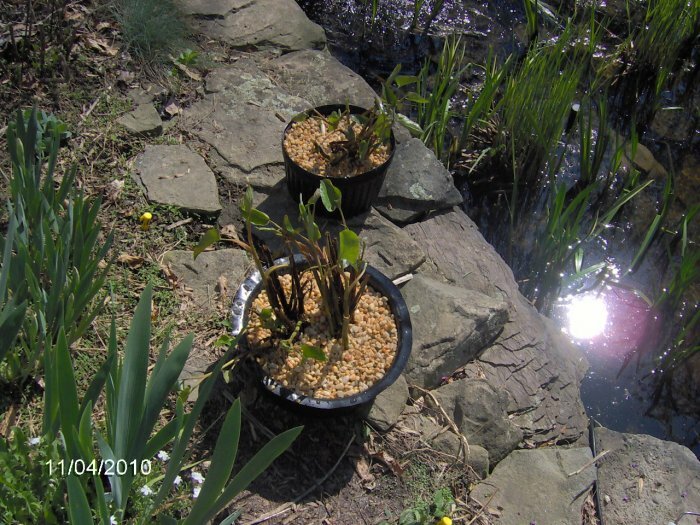 Lizard tail - before repotting, side view of the two two gallon pots. 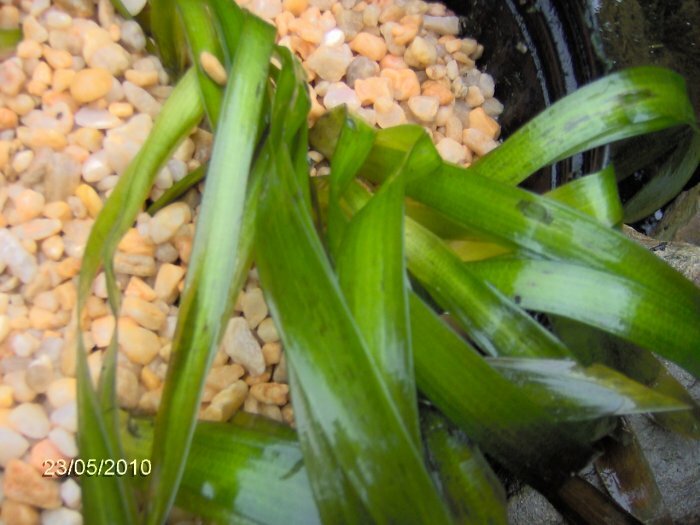 Lizard tail - before repotting, top view of the two two gallon pots. 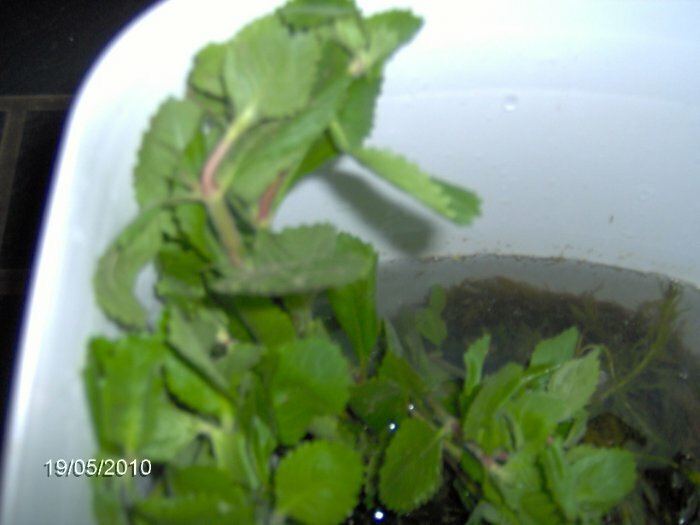 Lizard tail - after repotting, top view of the two two gallon pots. 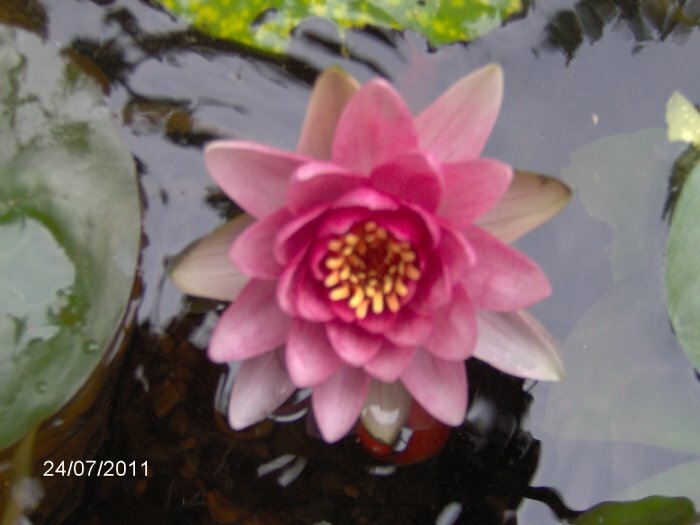 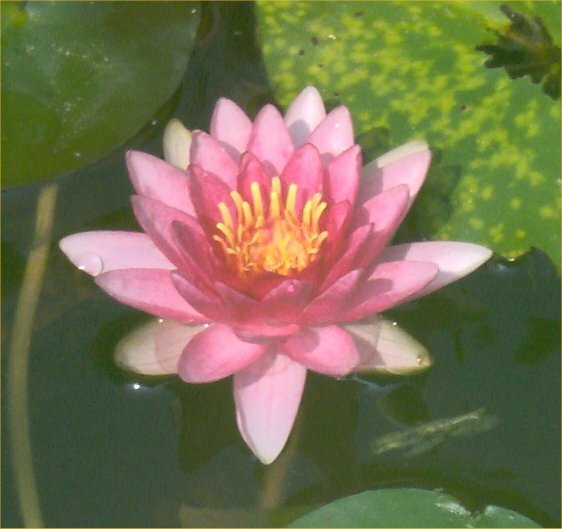 When I pulled out my new tropical waterlily from the pond on 11/15/09, I found that it had two little nut tubers which I put in damp sand. 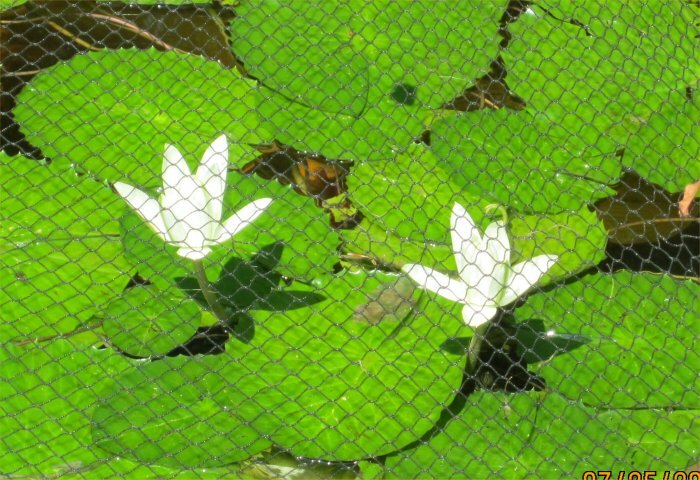 Perhaps they will make it! 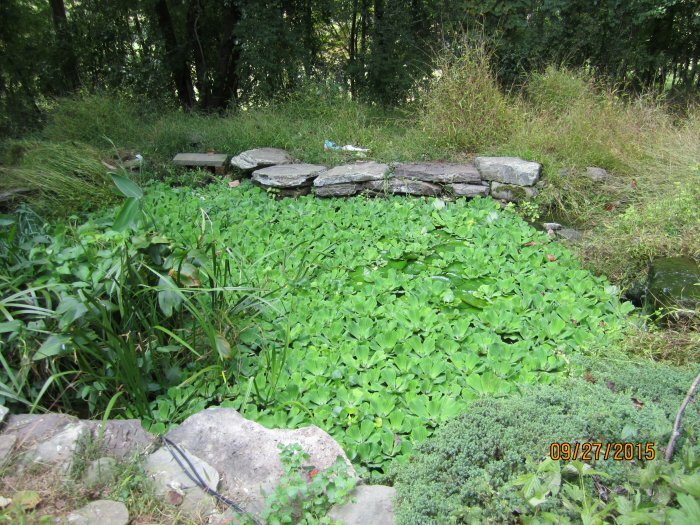 I also saved the growing part and put that in my basement pond. 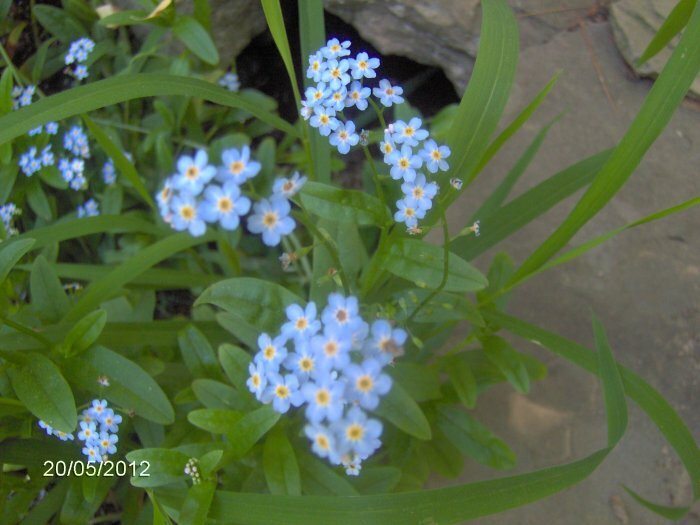 Here is a photo of them. 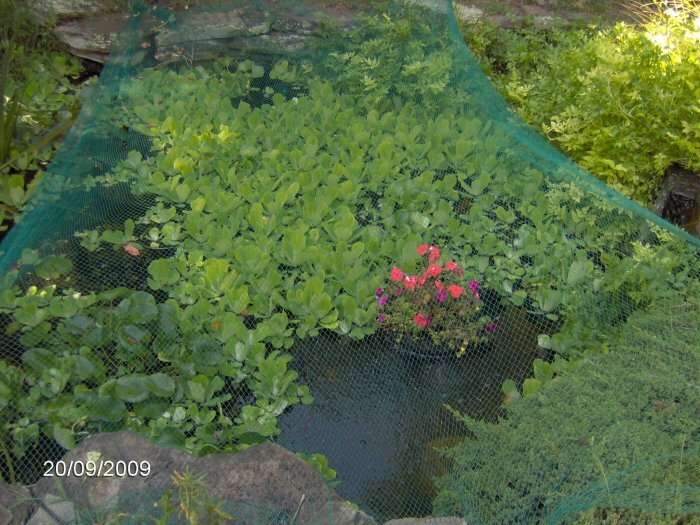 Big pond facing west, covered in water lettuce even after removing a ton of it; water celery on the falls to the right; impatiens blooming in the floating island; half net on. 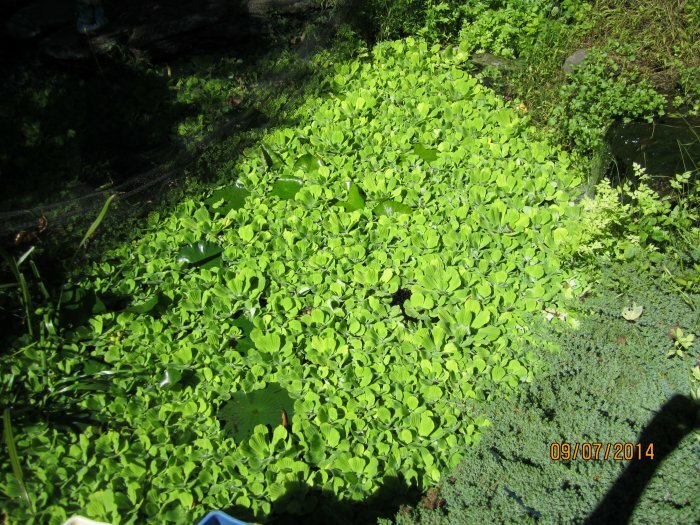 Pile of water lettuce - the mounting pile of discarded water lettuce. 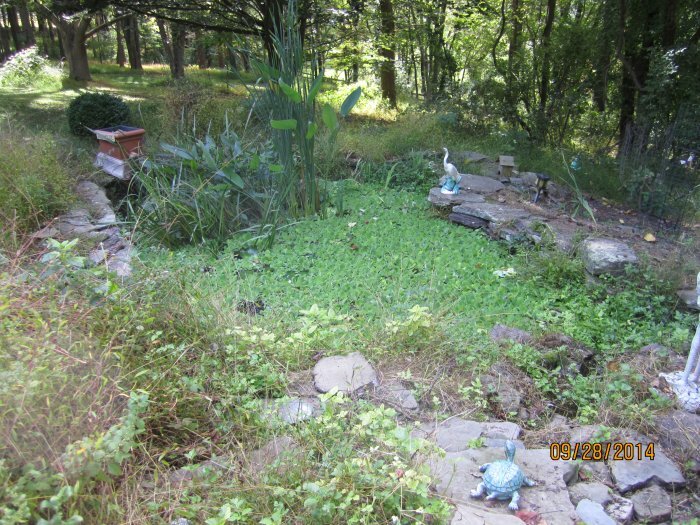 I also noticed on the right in that photo are remnants of a pond plant repotting from at least a year ago. 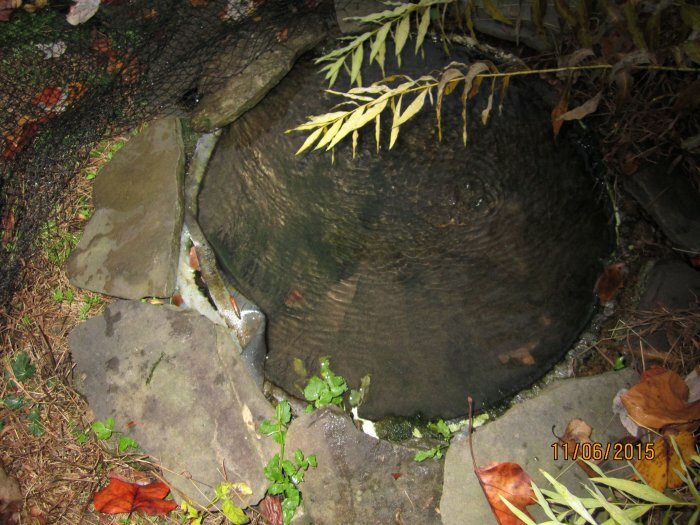 The roots hold the ball of rocks and dirt together for a long time. 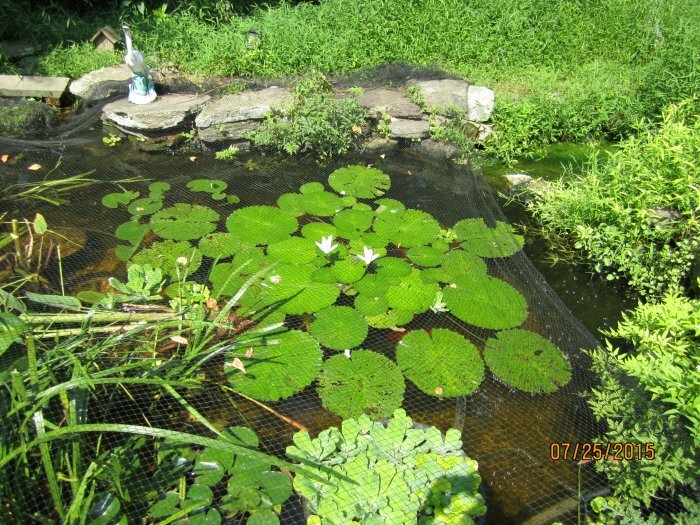 Big pond facing northwest completely covered in water lettuce. 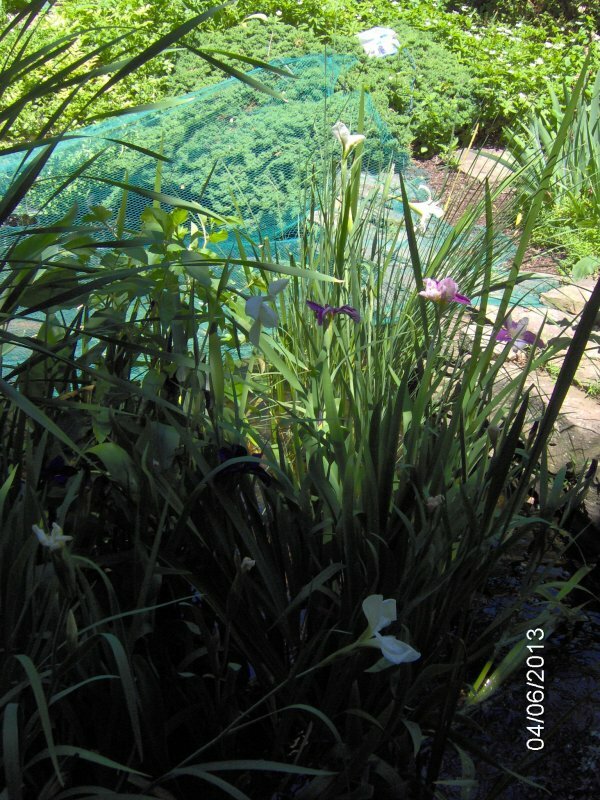 Marginal area including blooming bluebells. 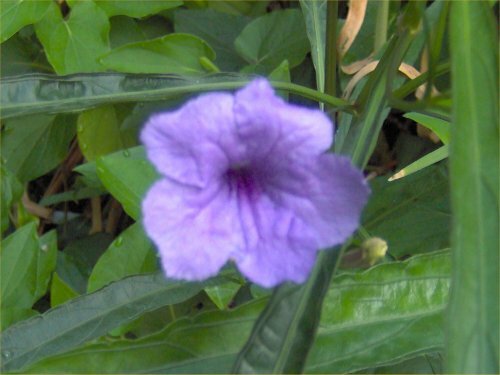 Bluebell - close-up of one flower. 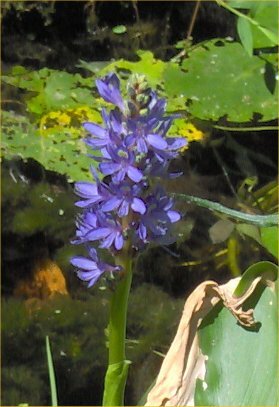 Bluebell - close-up of another flower. 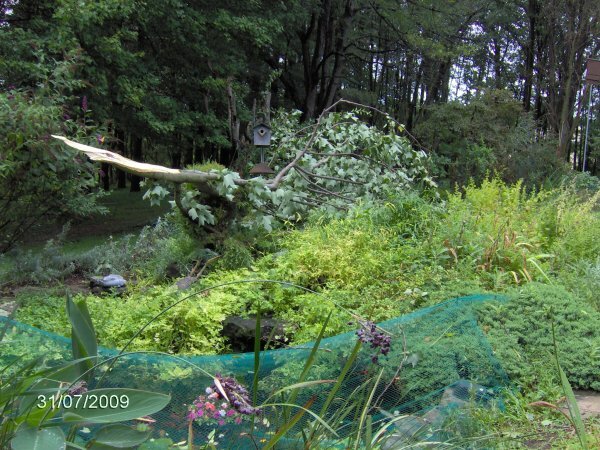 On 7/31/09, while I was at work, my father says the strongest straight winds he has ever seen came through with a storm. 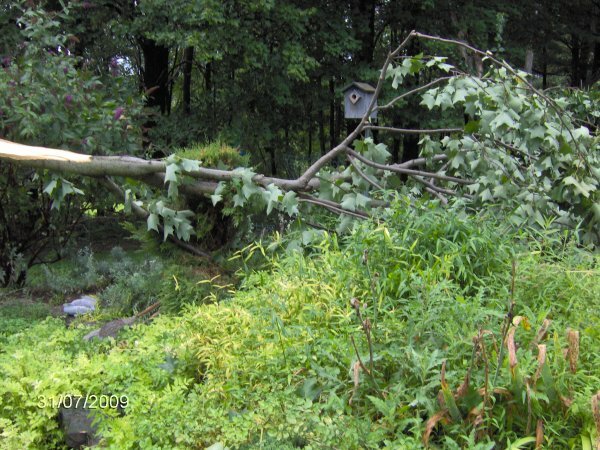 When I got home, no fewer than 12 trees had partially or totally come down including this large tulip poplar branch that fell over my waterfall area. 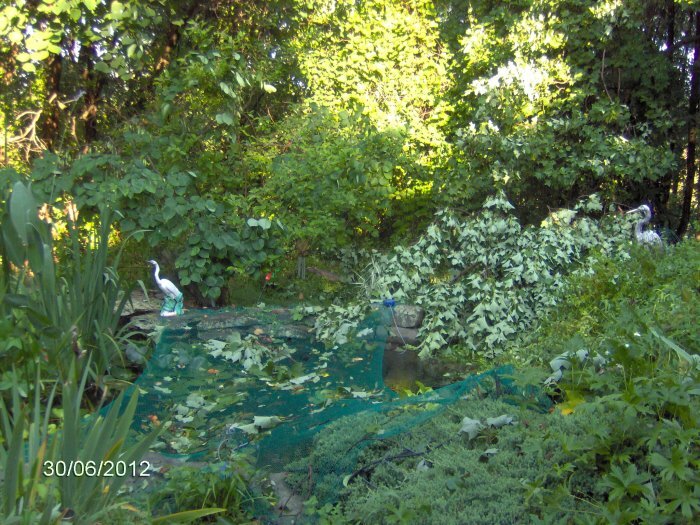 The branch was much bigger than it looks in the photos. 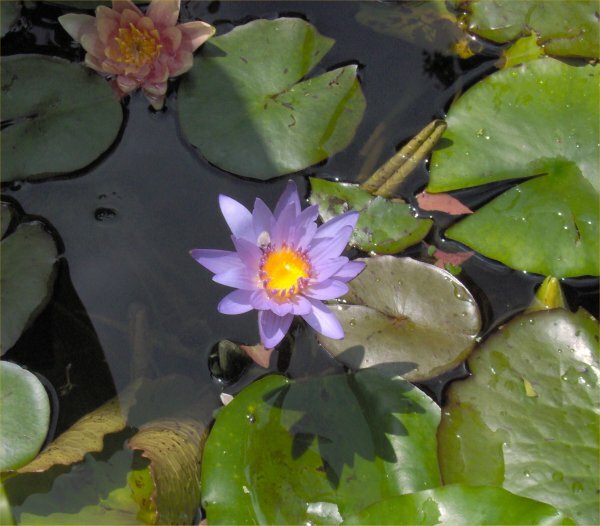 Waterlily Flowers - new Blue Beauty tropical water lily in flower and new replacement Comanche hardy water lily at the upper left of the photo. 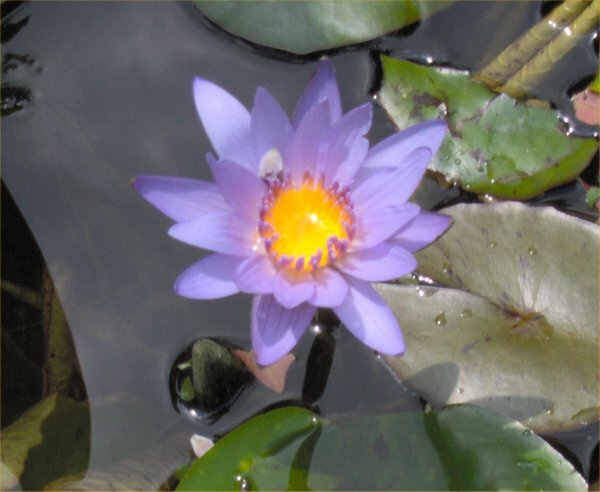 Blue Beauty tropical water lily flower, close- up. 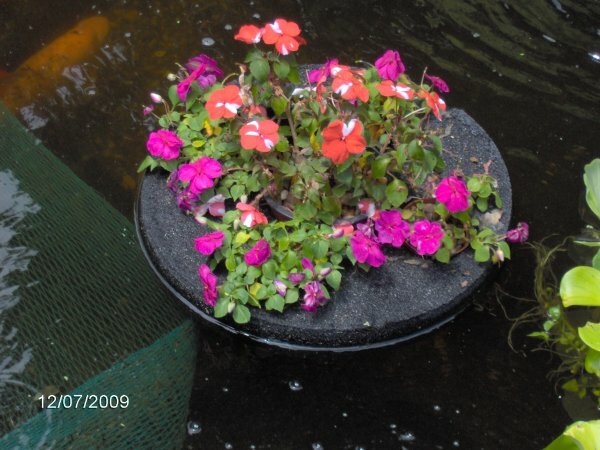 Impatiens in floating island planter. 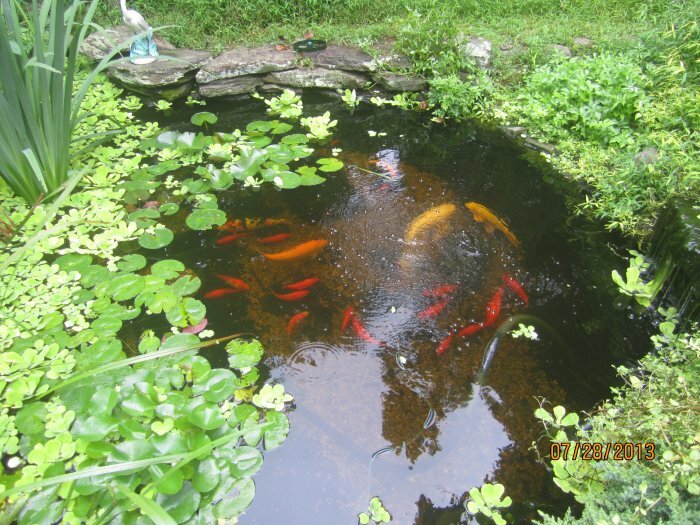 The orange shadow is a big orfe. 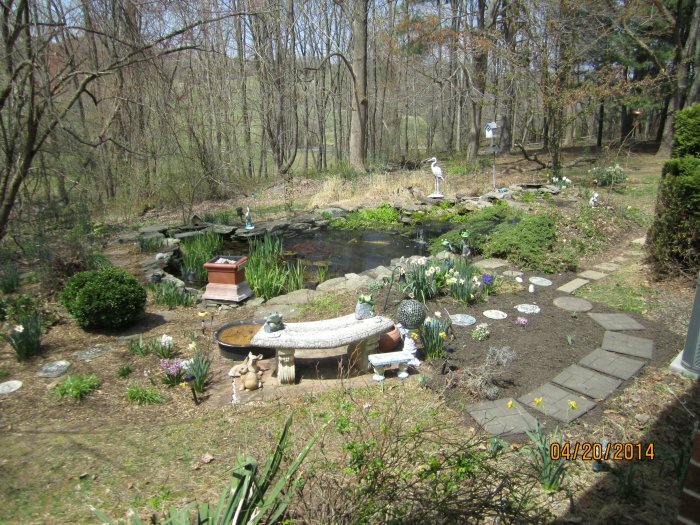 Pond facing north, red bud in bloom. 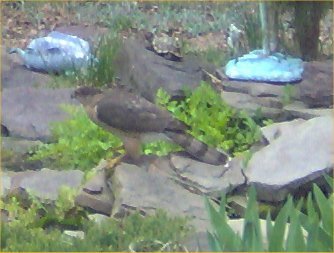 Cooper's hawk on the waterfall rocks through the window. 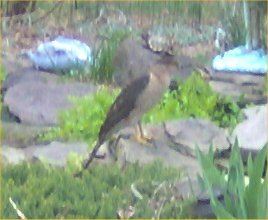 Cooper's hawk - close up of the hawk from the last photo. 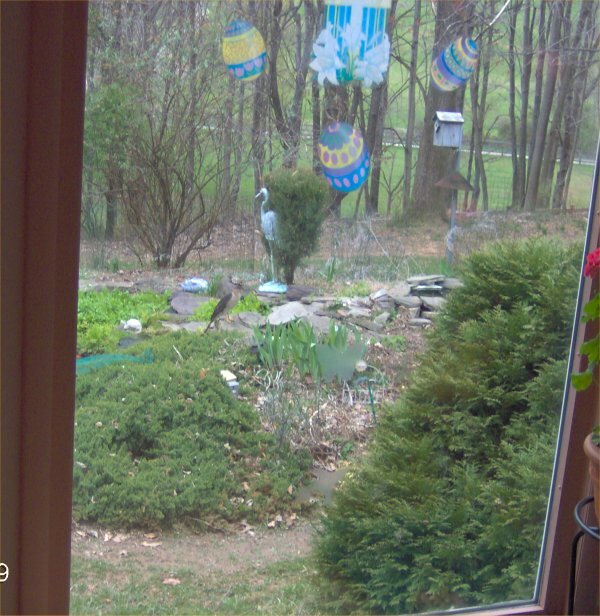 A few days later, my mother found a dead hawk. 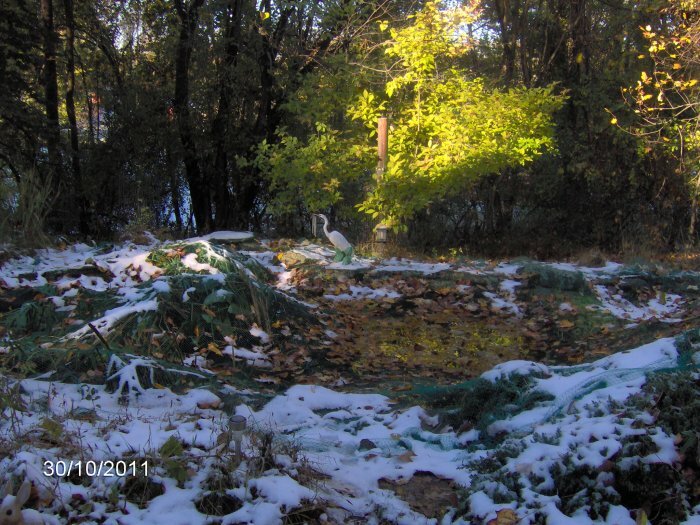 It was either the same bird or its mate. 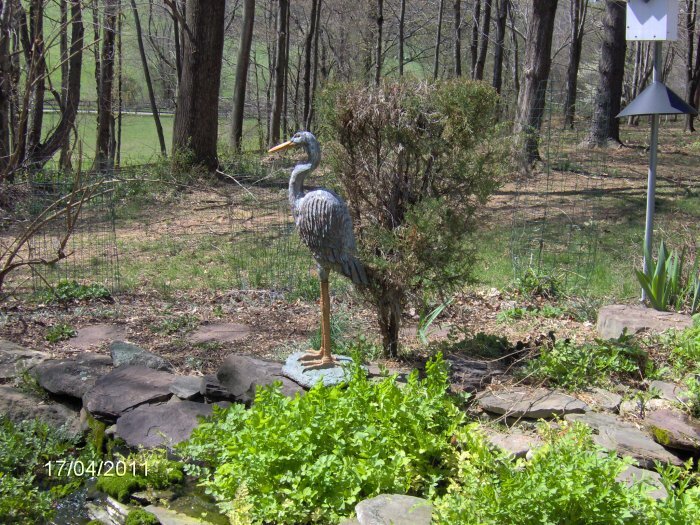 You can see photos on my birds of prey page. 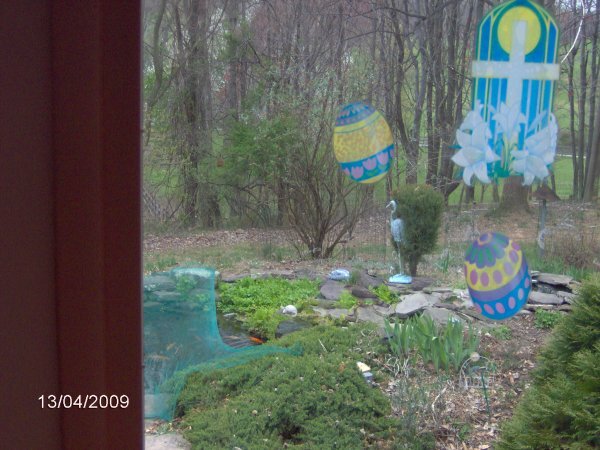 These photos are from 4/1/09. 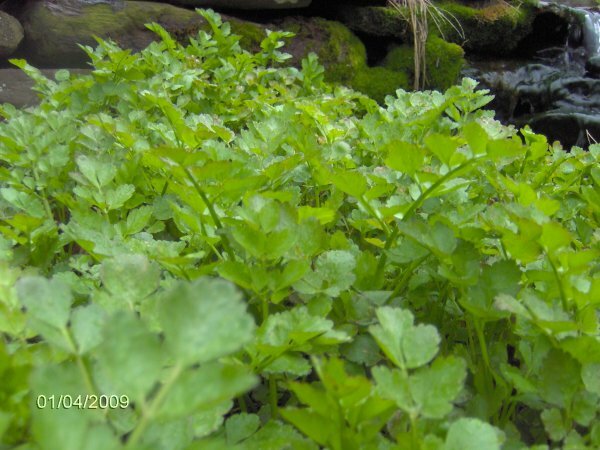 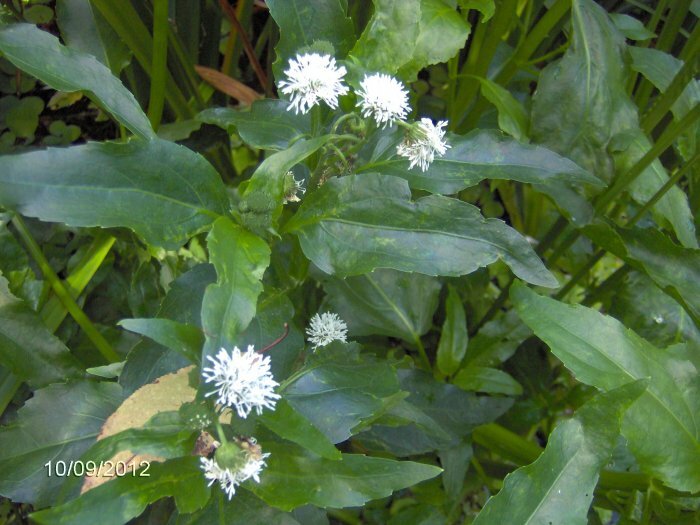 Water celery in the waterfall area, top view. 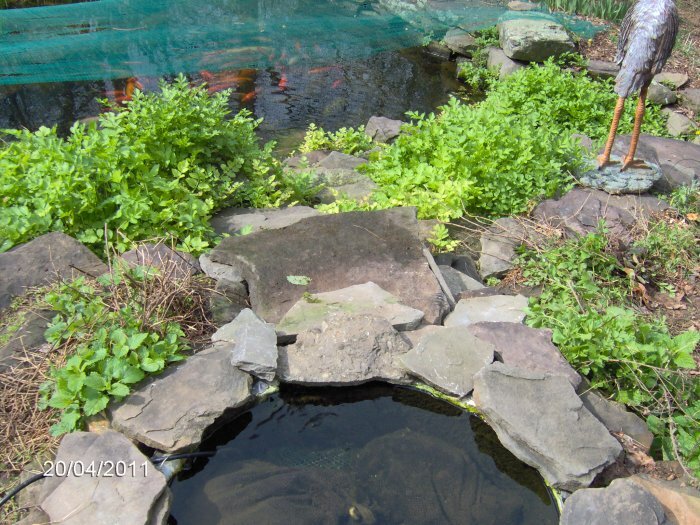 Water celery in the waterfall area, frog's eye view. 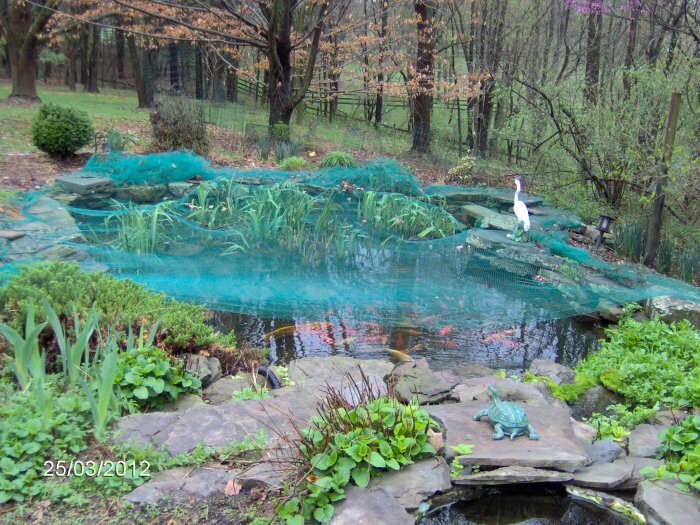 Pond facing southwest, net on, 3/21/09.